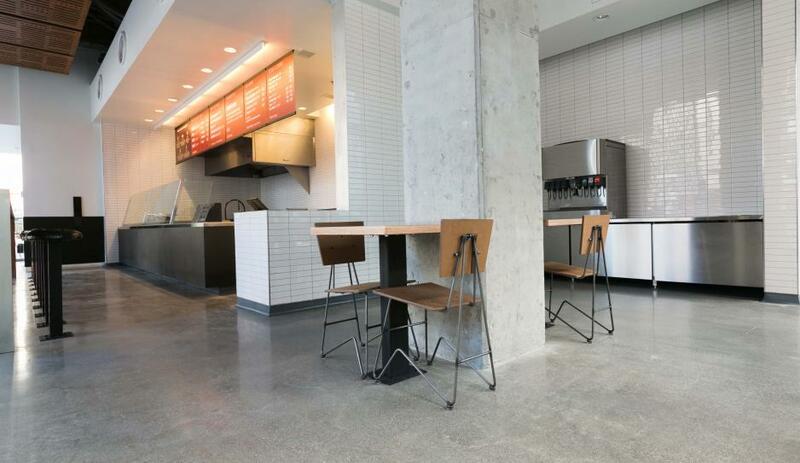 A RetroPlate floor is a great idea for department store chains like Nordstrom. 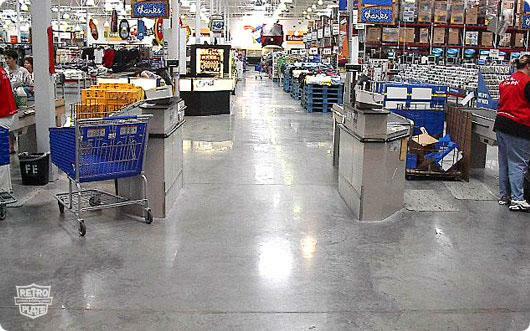 Selected for its ease of maintenance and low life-cycle costs, this RetroPlate polished concrete floor showcases the high-end store’s merchandise and displays perfectly. 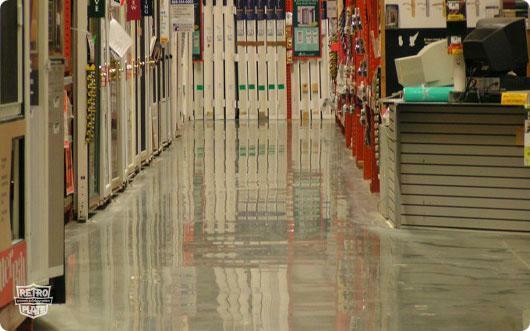 Department store floors have to withstand rolling carts with merchandise, moving clothing racks & display cases, and hold up to immense amounts of foot traffic. 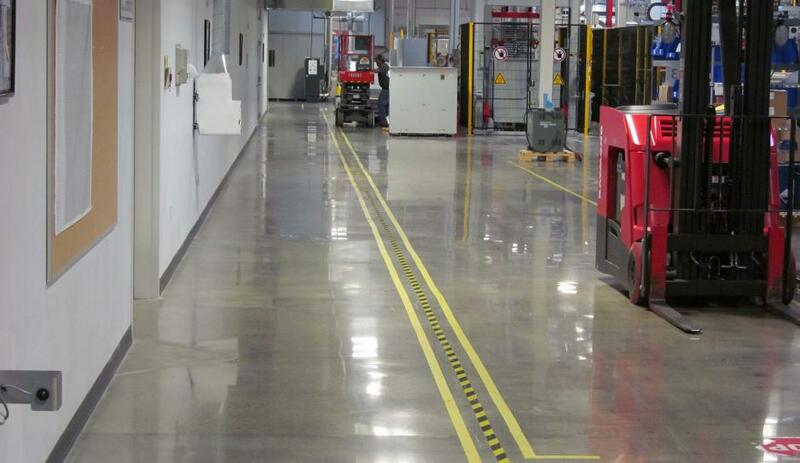 These RetroPlate floors clearly have it handled! 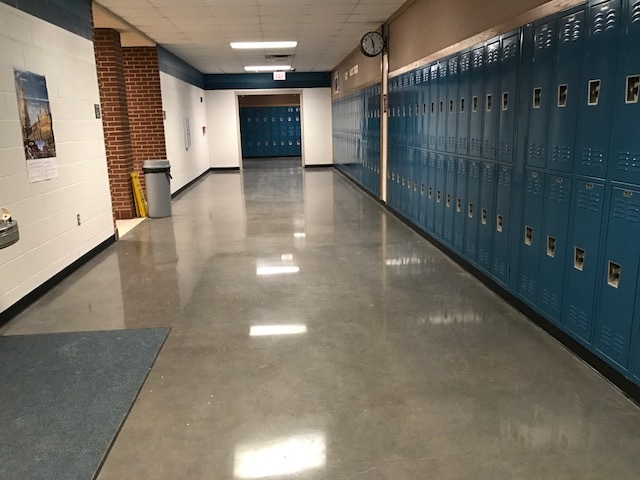 When it was time to replace the carpet in the corridors of the Wills Point High School, the District’s custodian supervisor immediately scheduled a RetroPlate mock-up of a Level 2 polished floor with a Midnight Black dye diluted to a dark gray. 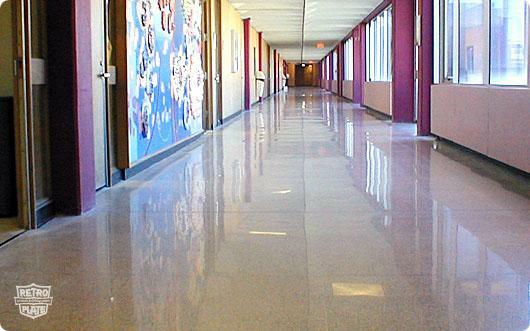 According to Rhonda Clinton, RetroPlate representative for in the Dallas, TX area, the supervisor had been extremely satisfied with the performance of his RetroPlate System floors at the Desoto Private Schools’ High School and Elementary buildings when he oversaw their floor maintenance over the span of 10 years. 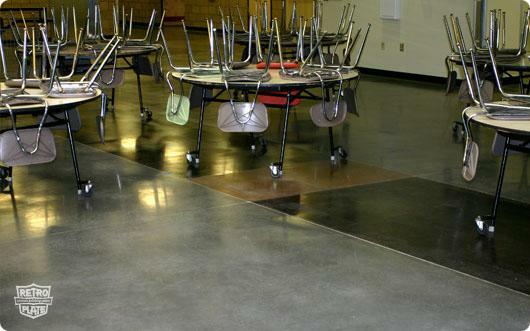 His experience prior to using the RetroPlate System was to strip the topical sealer from the floors, re-apply the acid stain, and then re-apply the top coats – every Christmas break and Summer break. 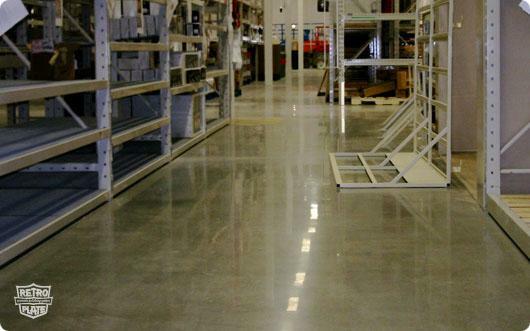 He is convinced that the RetroPlate System is the best choice for its durability and ease of maintenance; only requiring dust mopping, clean mopping, or a periodic buffing to enhance the sheen on an as needed basis. 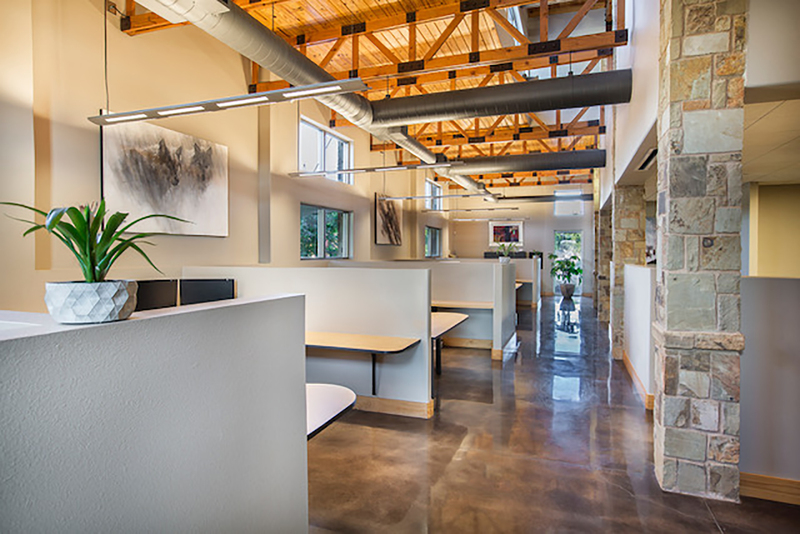 RGA Architects designed and built their office building in Roanoke, Texas nearly 10 years ago. 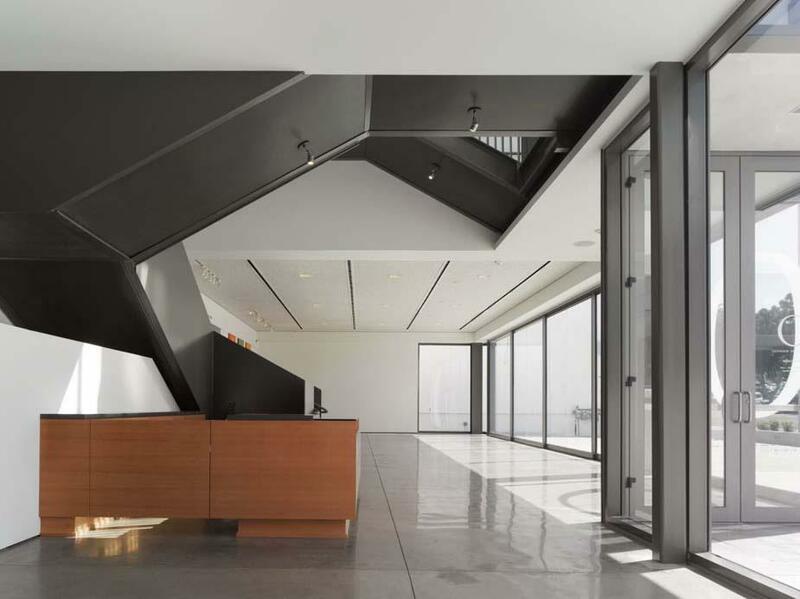 The photos of their office spaces and lobby captured just this year look incredible. 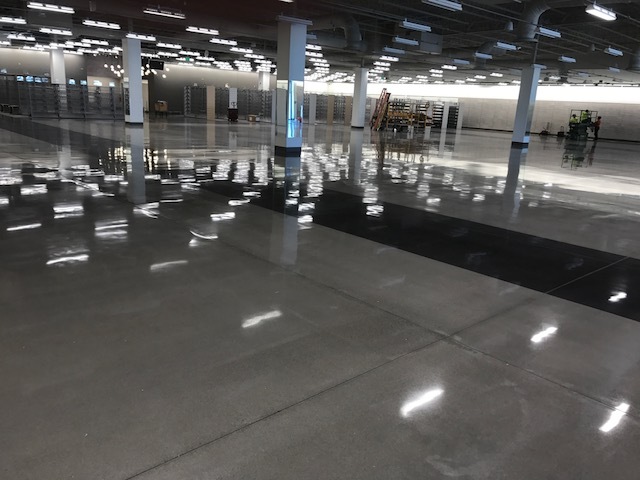 The floors in the 7,000 square foot space are not only performing well but look just as good as the day they were completed. 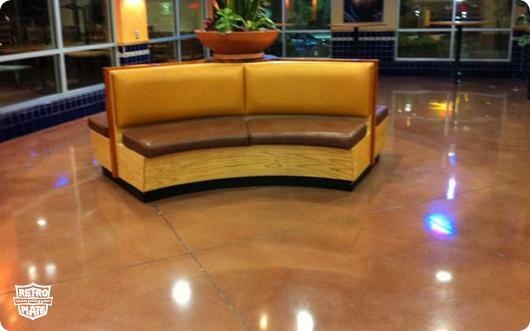 This is a direct result of the regular maintenance performed on these floors with CreteClean Plus. 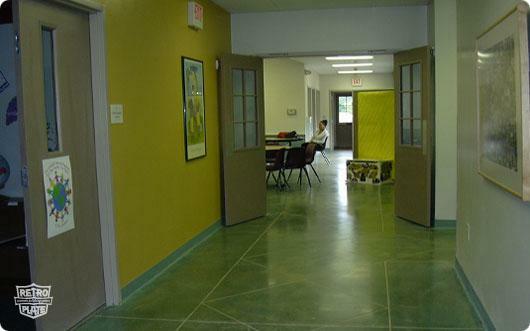 The facility has been mopped daily and buffed once a month with a soft white pad. 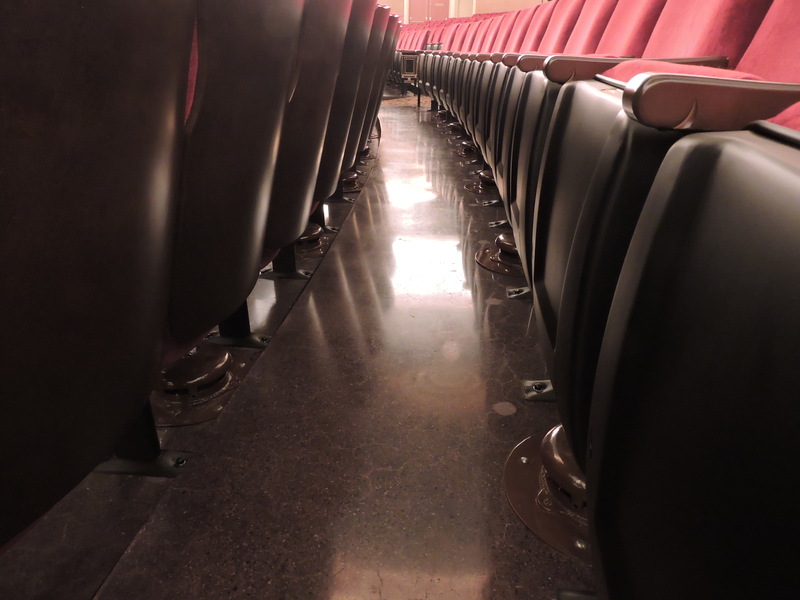 The final specs of the floor was a Level 2,800 grit satin sheen and a Class B, salt and pepper finish. 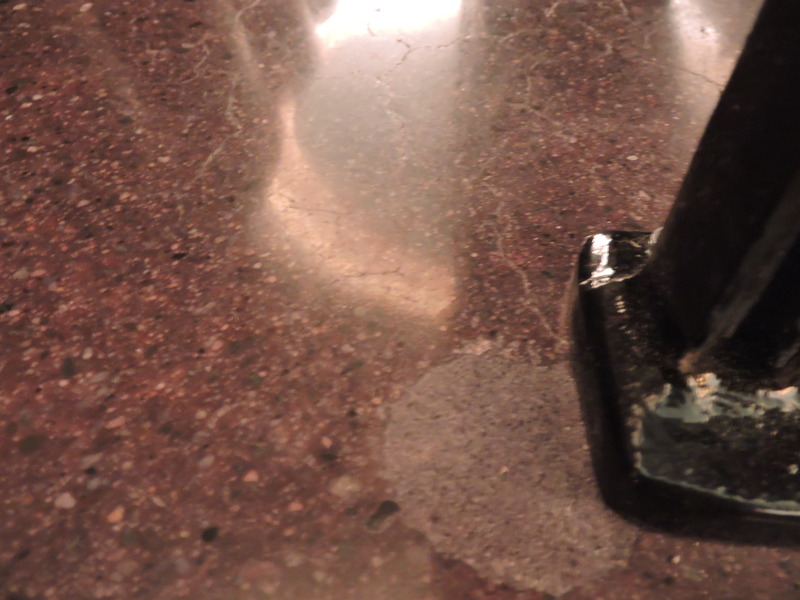 RetroGuard was applied and burnished with a 1500 grit pad. 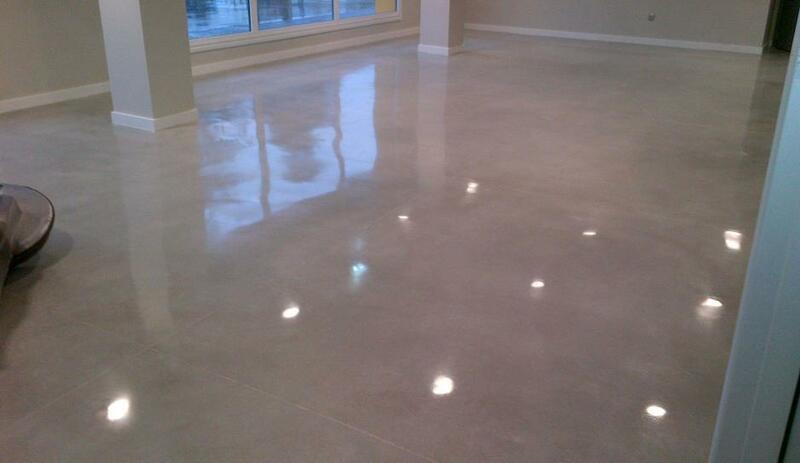 Walnut dye was used to stain the floor with a natural gray concrete accent. 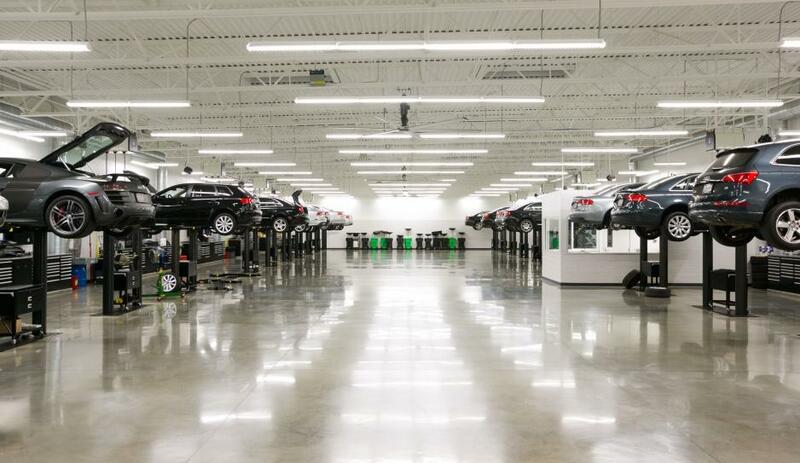 Black Mountain Motorworks in Denver, CO is an exotic car storage facility boasting state-of-the-art security features and concierge maintenance services. 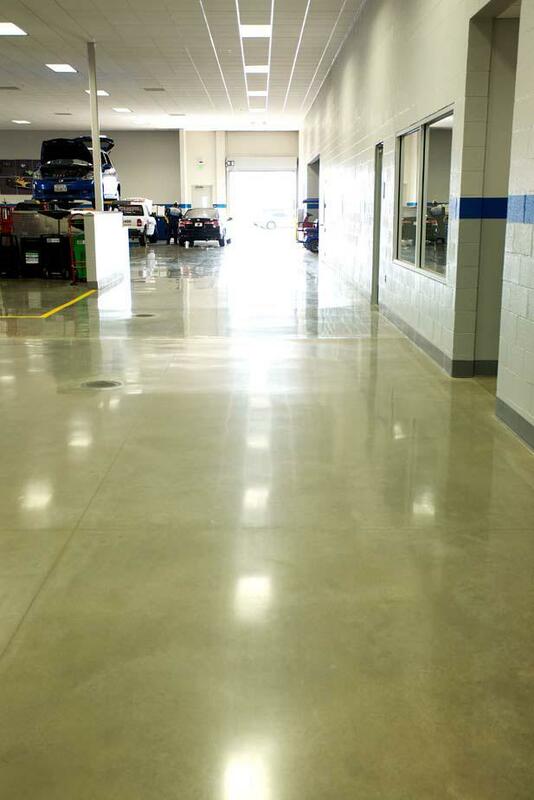 Catering to high-end automobile owners, there is no question as to why RetroPlate polished concrete floors were selected for their facility. 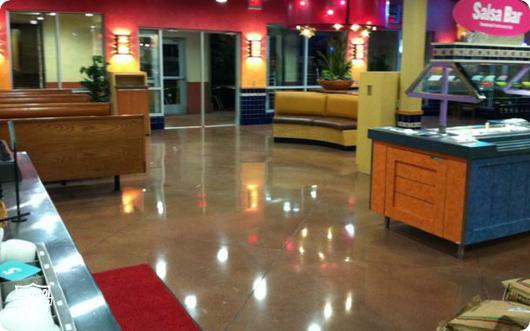 All West Surface Prep performed the concrete polishing work for this project and delivered beautifully reflective RetroPlate floors with a salt and pepper exposure. 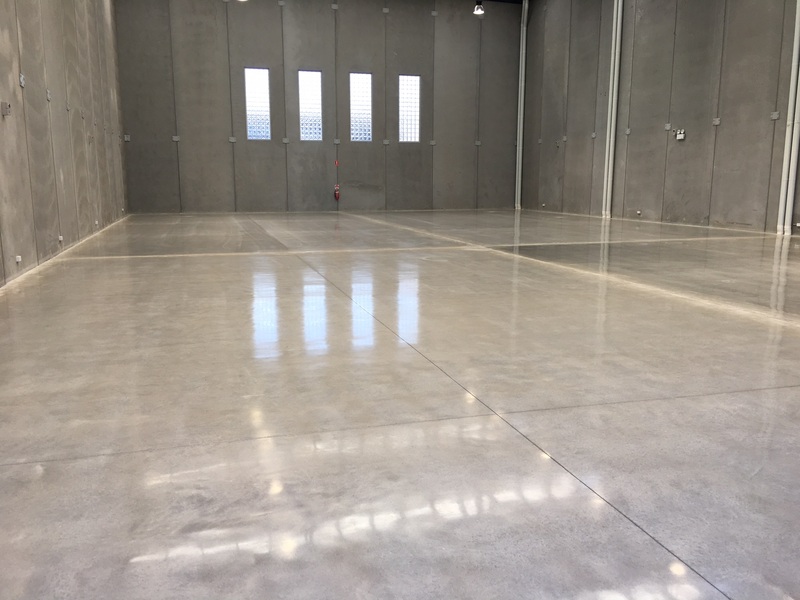 These high-end concrete floors are the perfect backdrop for the exotic cars this facility will be storing for Denver’s car enthusiasts. 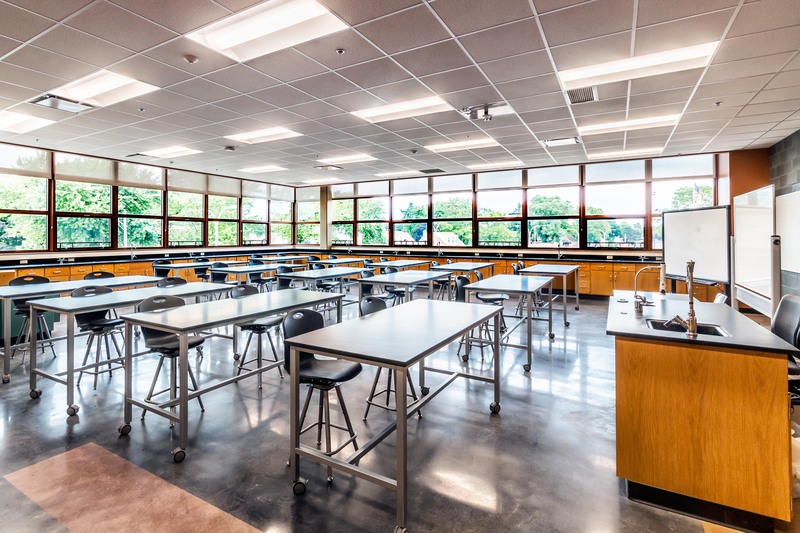 RetroPlate polished concrete was a key design feature for the Elmwood Park High School Project, which incorporated a “Flex Learning” philosophy to support the school’s vision of an educational culture in the 21st century. 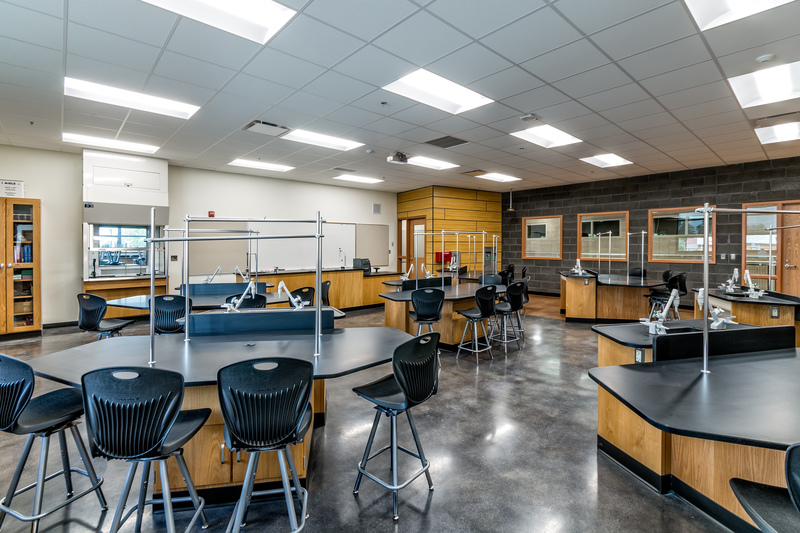 The project consisted of a major expansion and upgrades to the school which included six new science lab spaces, the re-purposing of existing lab rooms and the creation of an amphitheater-style lecture hall area. 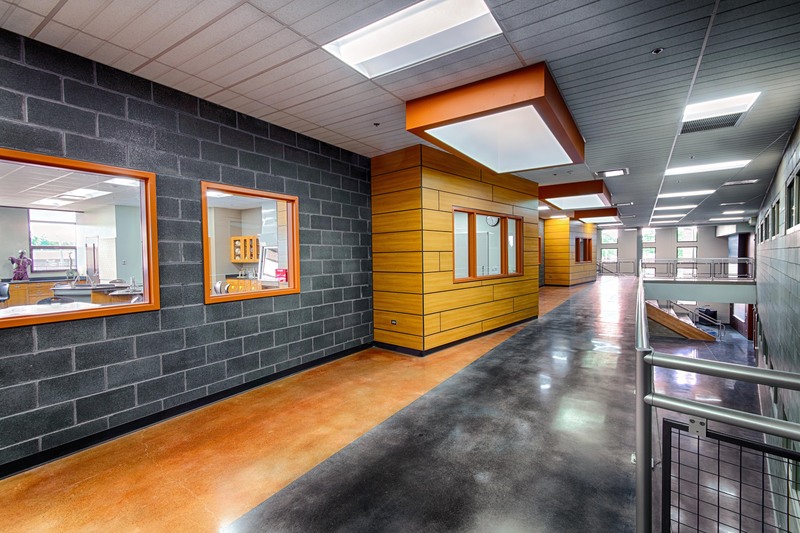 In keeping with the flexible spirit of the design, the labs included large overhead “garage doors” that opened to the Flex Learning Corridor, a common space for students to gather and collaborate. 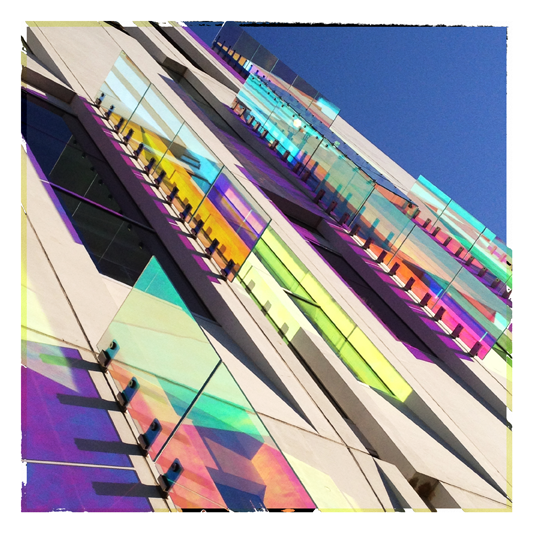 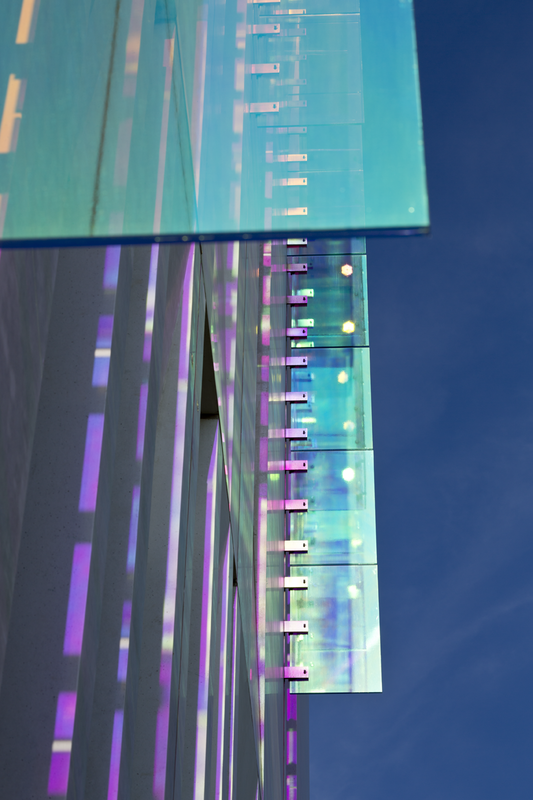 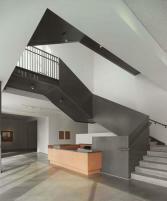 DLA Architects, Ltd. specified RetroPlate “by design” on this project. 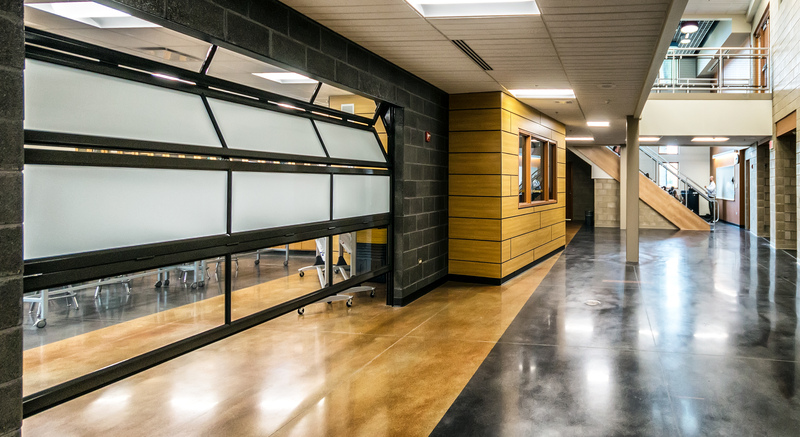 Long-time RetroPlate applicator Artlow Systems installed decorative saw cuts differentiated by black and gold dyes, as an homage to Elmwood Park High’s school colors. 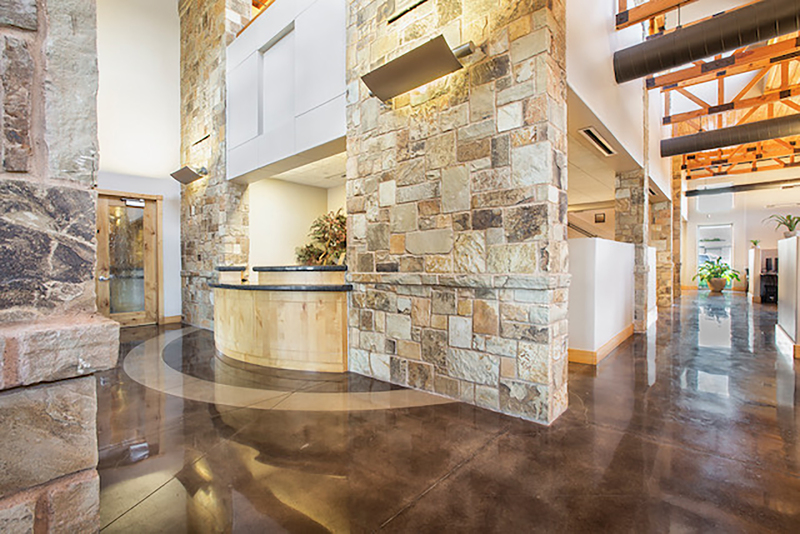 This project is a fine example of how the sustainability of RetroPlate polished concrete floors can be durable, beautiful, and green, because it does not negatively impact the environment, but rather provides a healthy space for the building’s occupants. 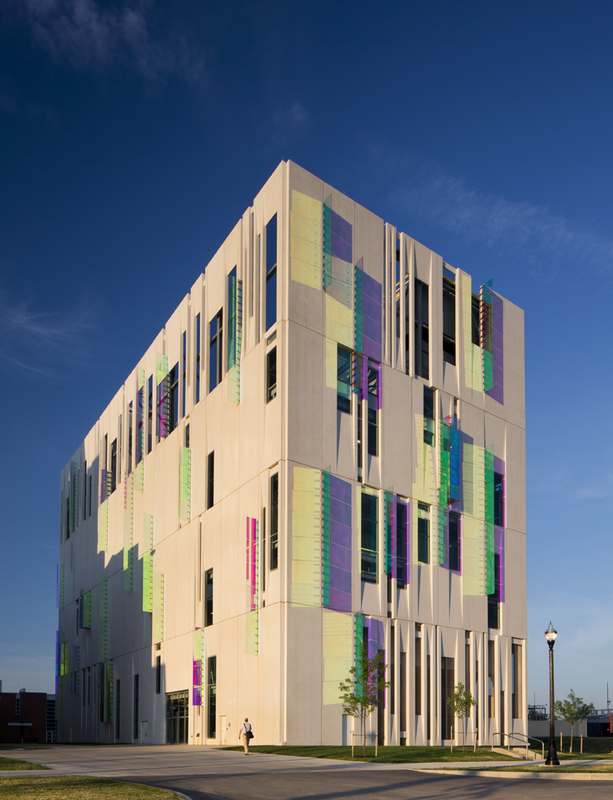 In September 2018, three years after the initial installation, Chicagoland RetroPlate Representatives Bob Donahue and Jennifer Burke had the chance to revisit the project and speak with Joseph Sierra, the Director for Building & Grounds for District 401. 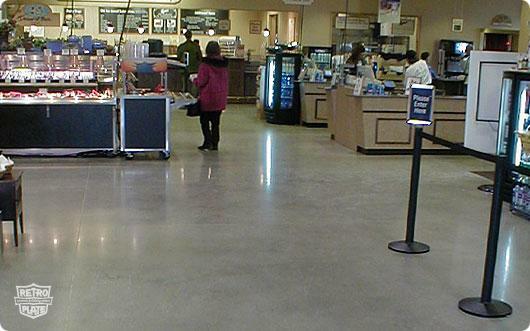 Sierra expressed that through a basic cleaning program which incorporates a walk-behind scrubber, they have been pleased overall with the floor’s ease of maintenance. 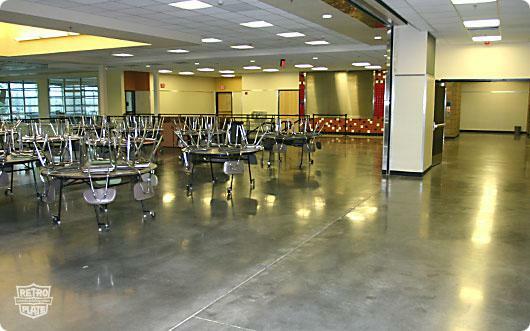 There have also been no reported issues with the durability of this high traffic floor. 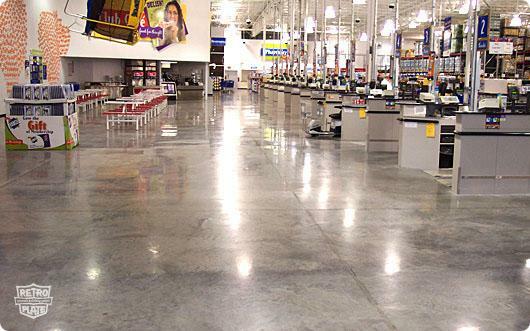 The concrete floors in this Kroger grocery store in Houston, TX was in desperate need of rejuvenation. 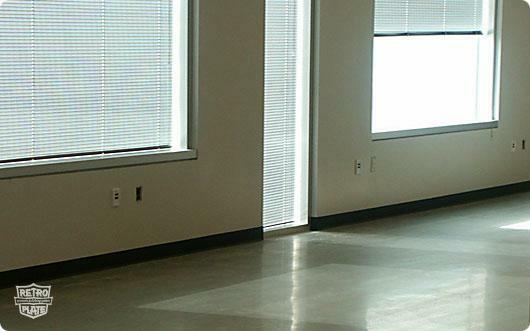 Lack of care and proper maintenance resulted in dull, unappealing floors. 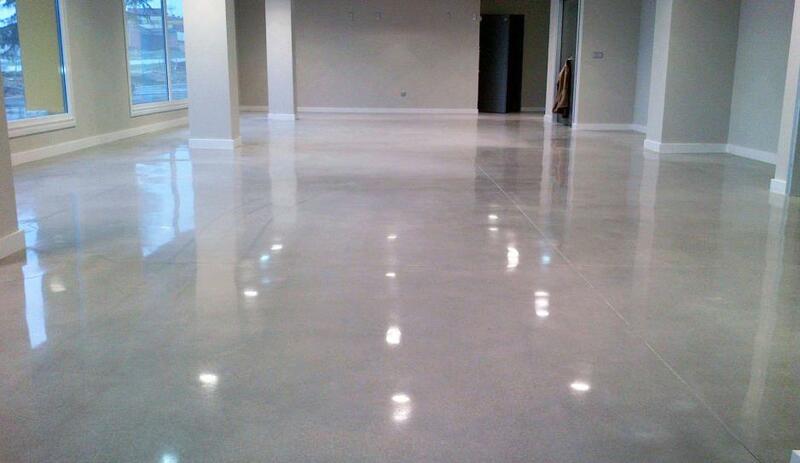 Prodigy Concrete Flooring Solutions took charge of rejuvenating the floors from a dull finish, to a highly reflective, mirror finish. 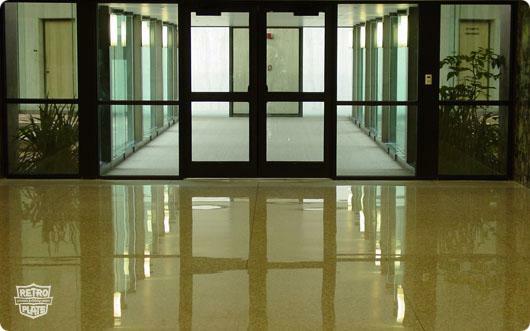 The floors were polished to a 1500-grit and finished treated with a penetrating sealer for added protection. 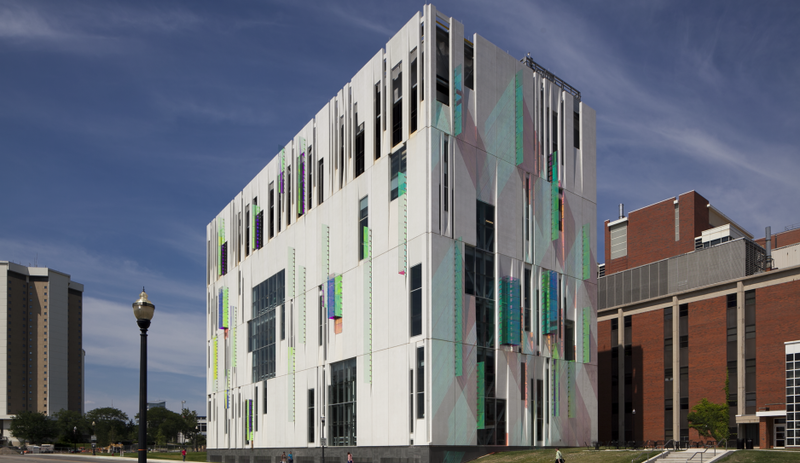 Watch the stunning transformation in this video. 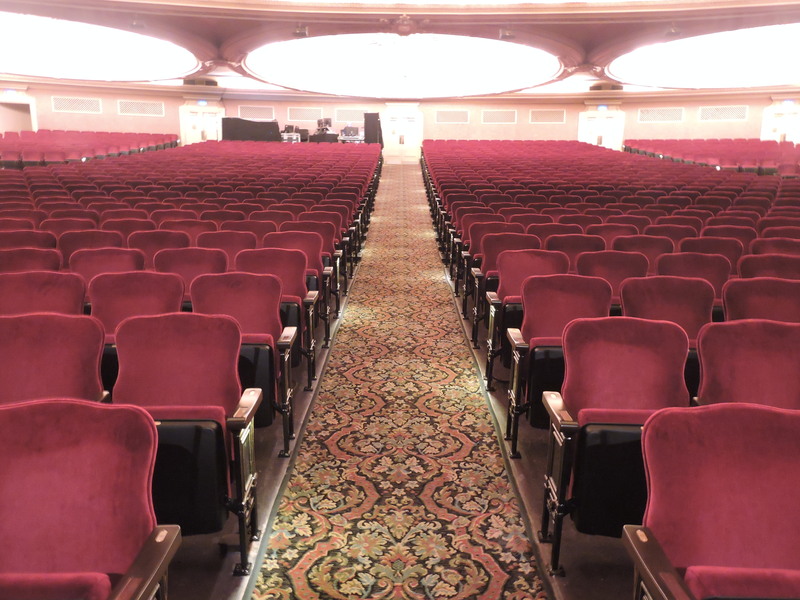 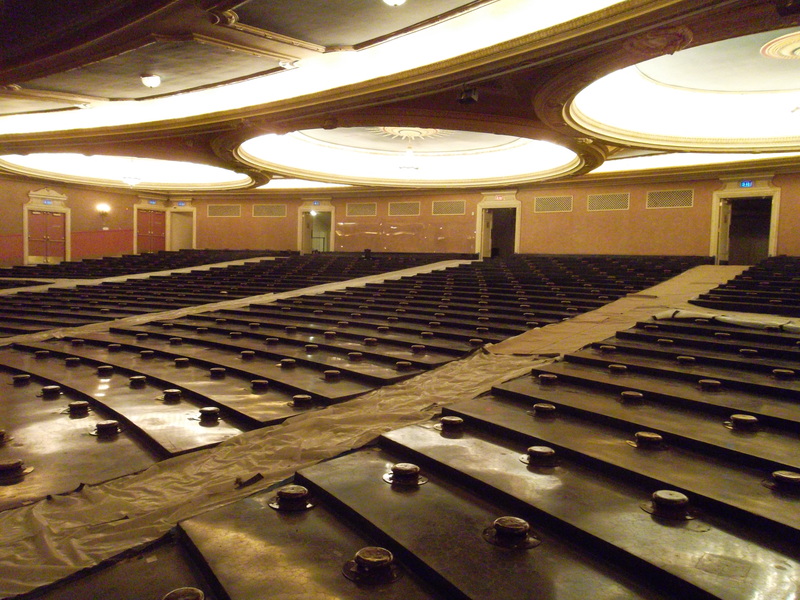 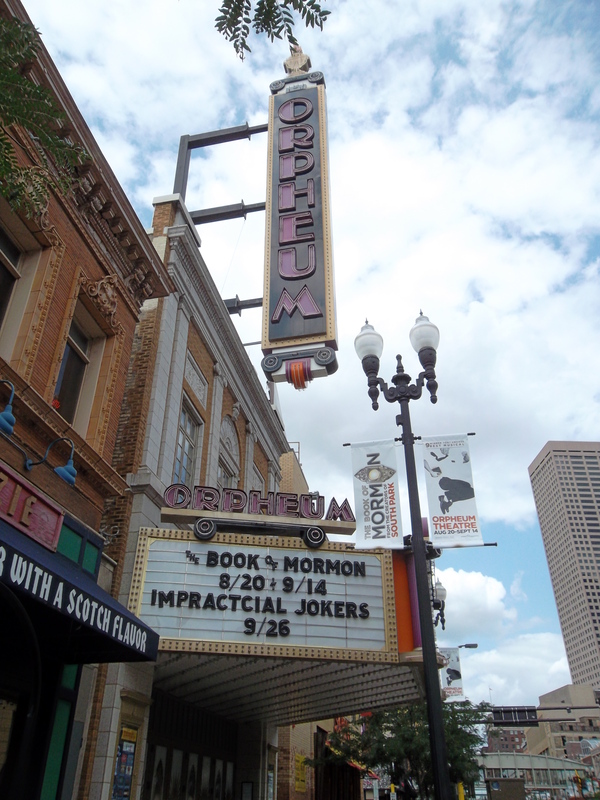 The floors of the Orpheum Theater (1921) needed refurbishing. 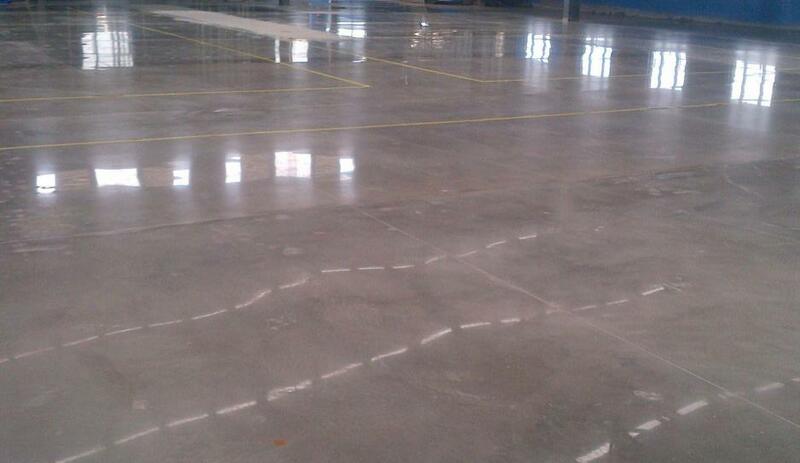 The owners were going to remove the old epoxy and put down more. 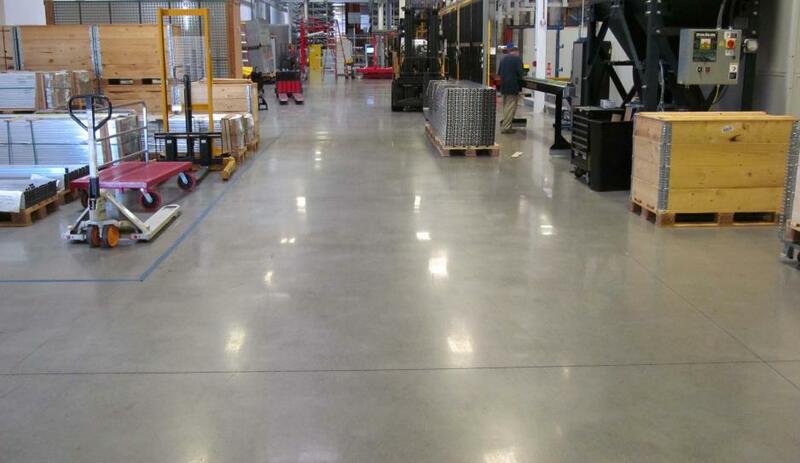 But they changed their minds when they learned about polished concrete and the RetroPlate system. 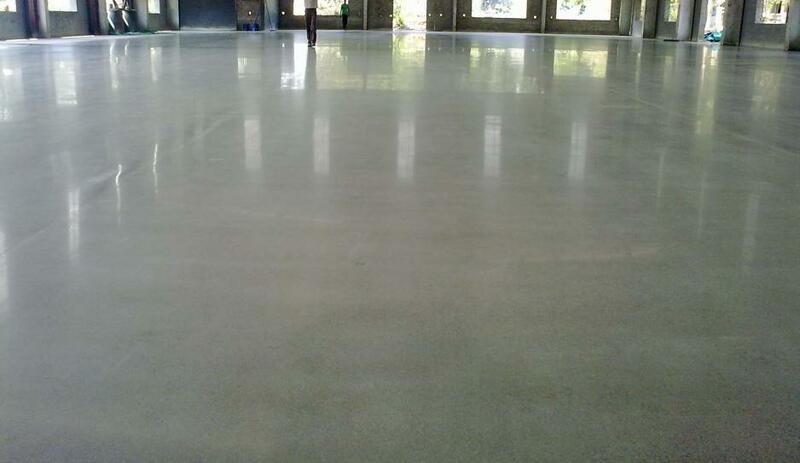 Additional Concrete Services/Gopher State Cleaning, longtime Certified RetroPlate applicators was selected to perform the work. 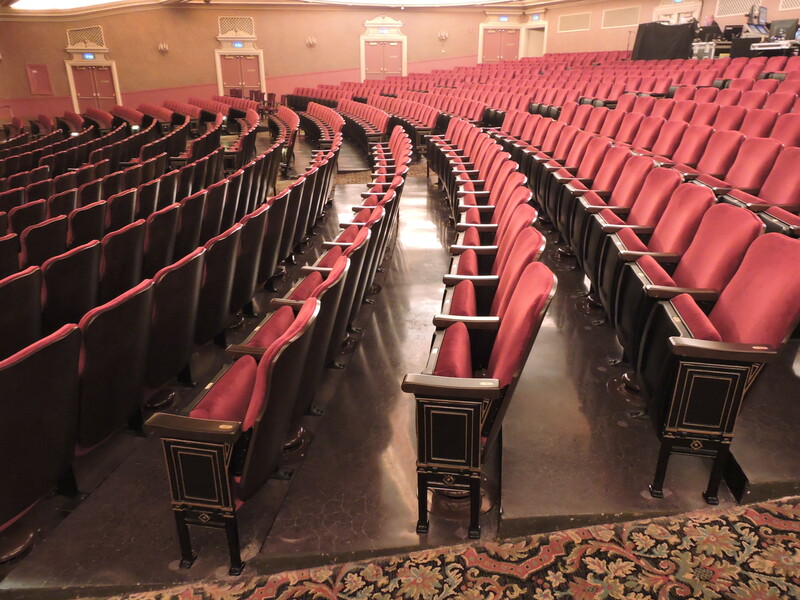 The new seats did not have the same footprint as the old ones, so 3,000 holes on the main level ad to be patched before grinding could begin. 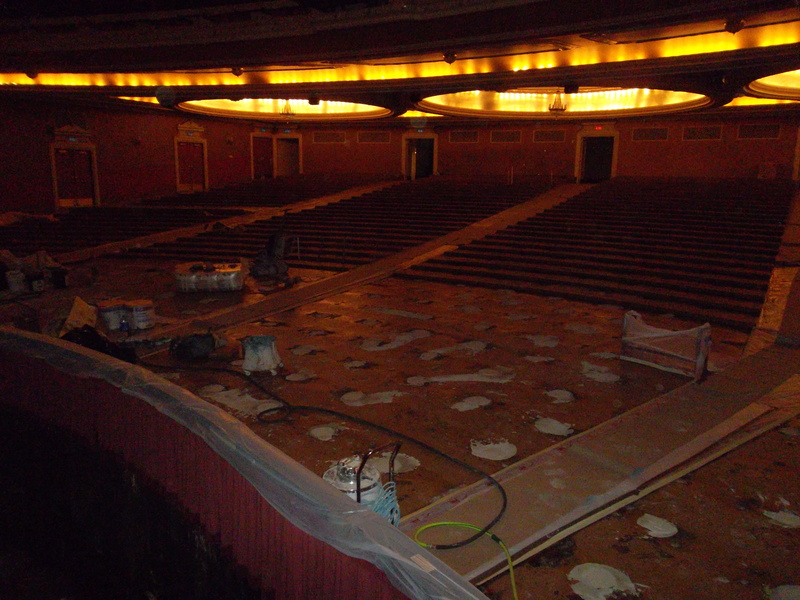 But, the most challenging part of the main floor renovation was grinding the vertical faces of each seating section. 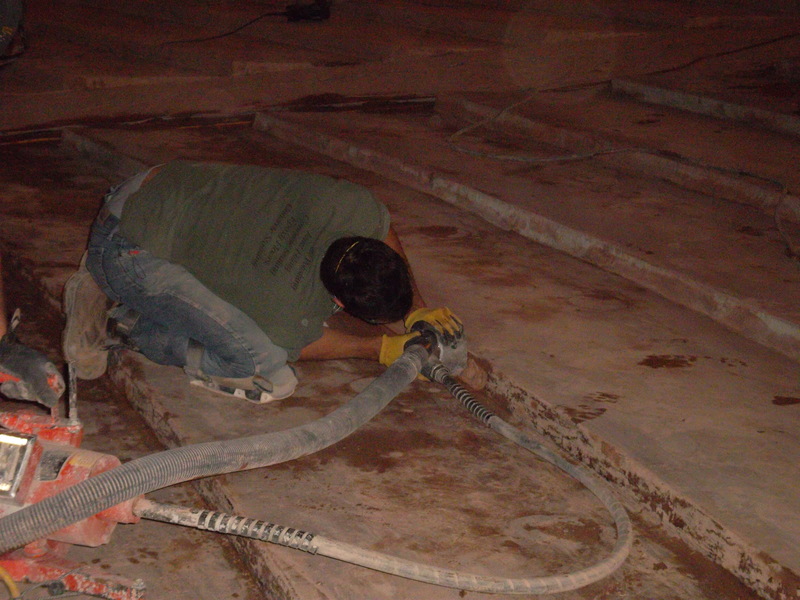 Over 2,000 lineal feet of 6” – 10” tall faces were hand ground with 7” and 9” Metabo grinders, with vacuum hoses hanging from them. 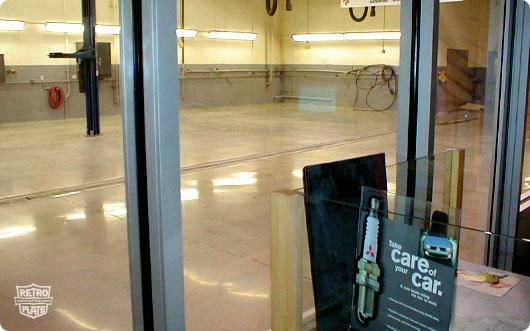 The ACS/GSC team burned up many hand grinders during this process. 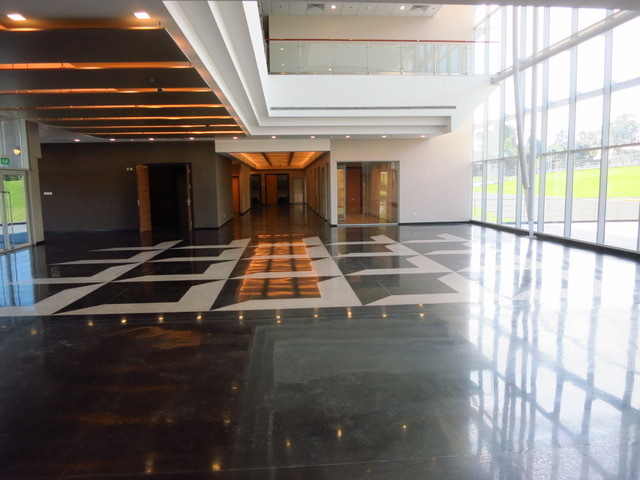 The finished project, completed in two phases (main floor and balcony) over the span of one year, took a four man crew approximately 60 days to complete. 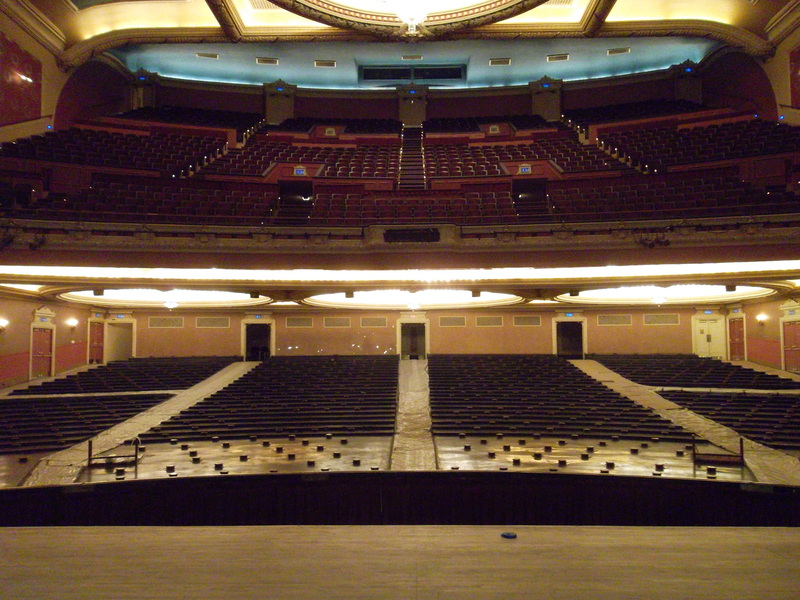 The main floor was nearly 6,000 square feet and the balcony, approximately 6,500 square feet. 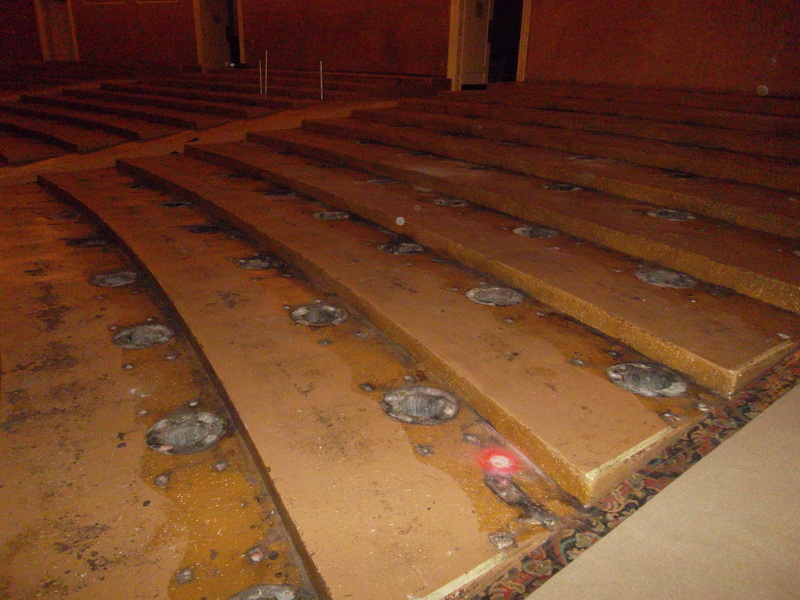 Thousands of holes were patched and roughly 4,000 linear feet of risers were ground. 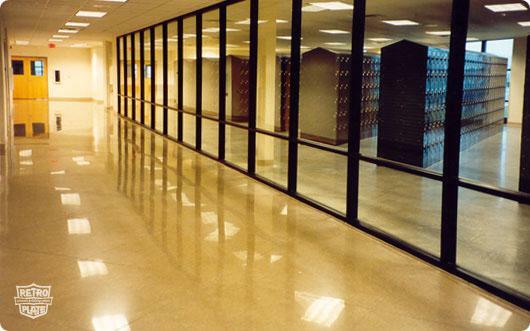 The results were a class B/C, level 3, black dyed RetroPlate polished floor. 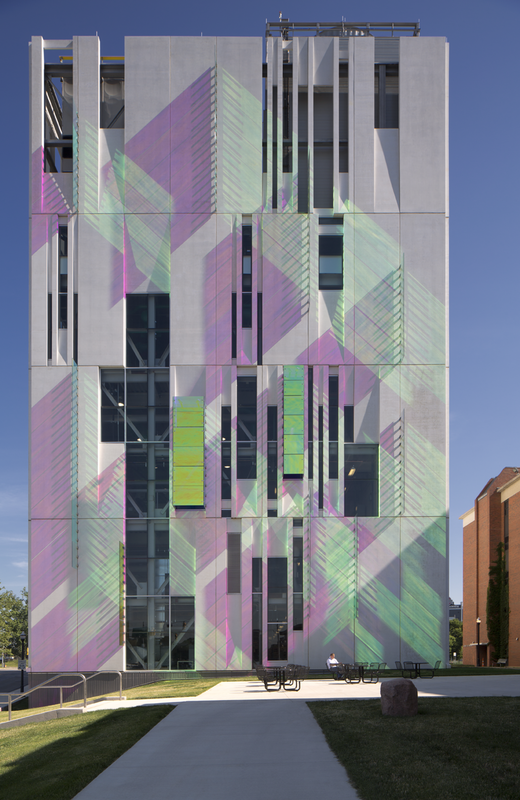 For the full project article, visit page 52 of our 2019 Project Highlights Photo Book. 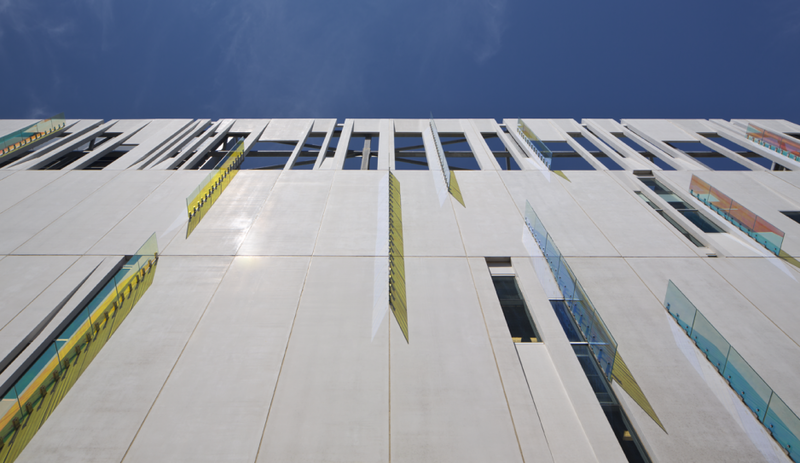 The Royal Brunei Police Force Headquarters was completed in 2014 and designed with symbolic characteristics reflecting strength and structure on its southern face and transparency and openness on its northern face. 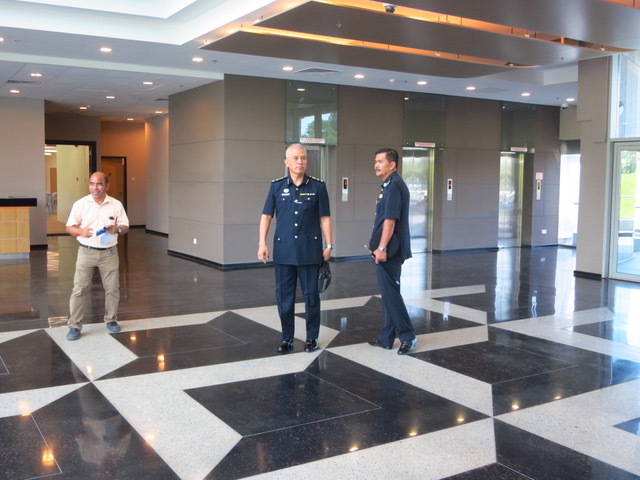 The architectural symbolism showcased in the building’s design reflects the purpose of the Police Force which is to provide transparency and order in the justice system. 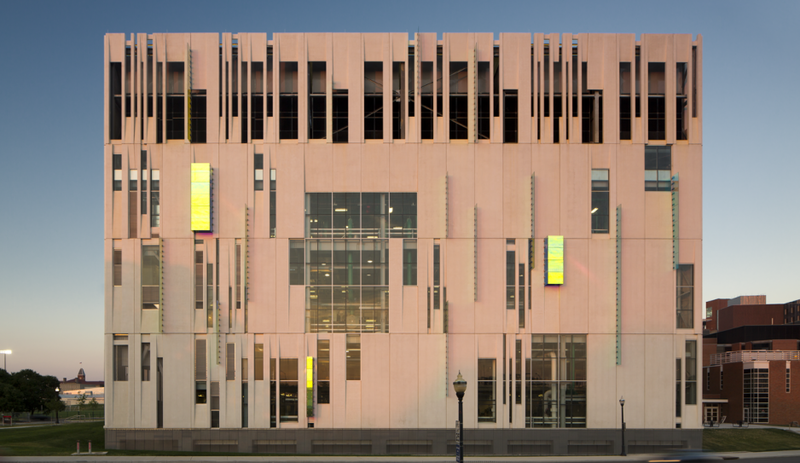 The building’s large windows allow lots of natural light to penetrate into its interior spaces, reducing the need for electricity and interior lighting. 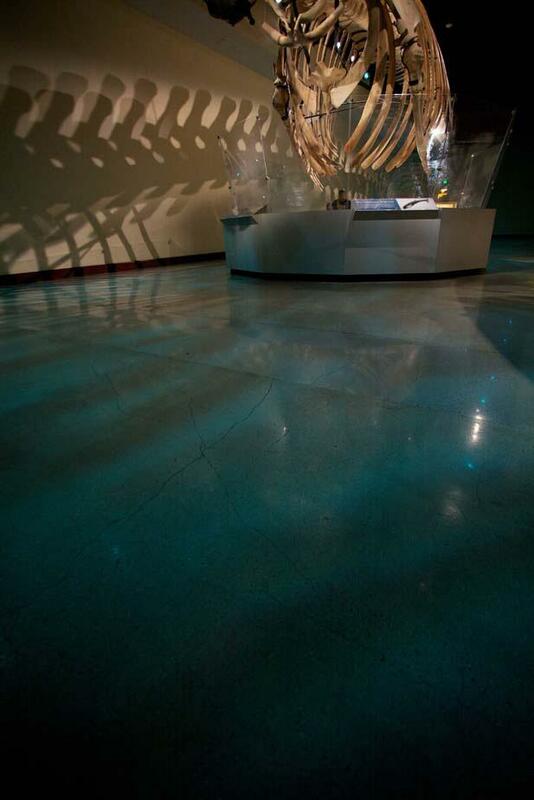 It also highlights the spectacular floor pattern created by RetroPlate applicator, BUE Brunei. 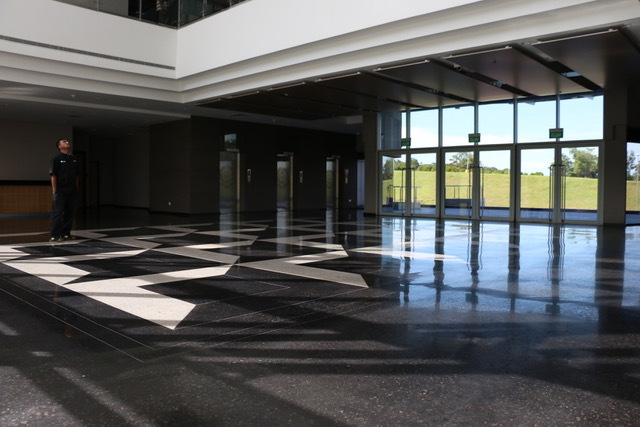 According to BUE Brunei, the lobby floor was designed to mimic black galaxy granite and white marble, but with polished concrete and colored stains and dyes. 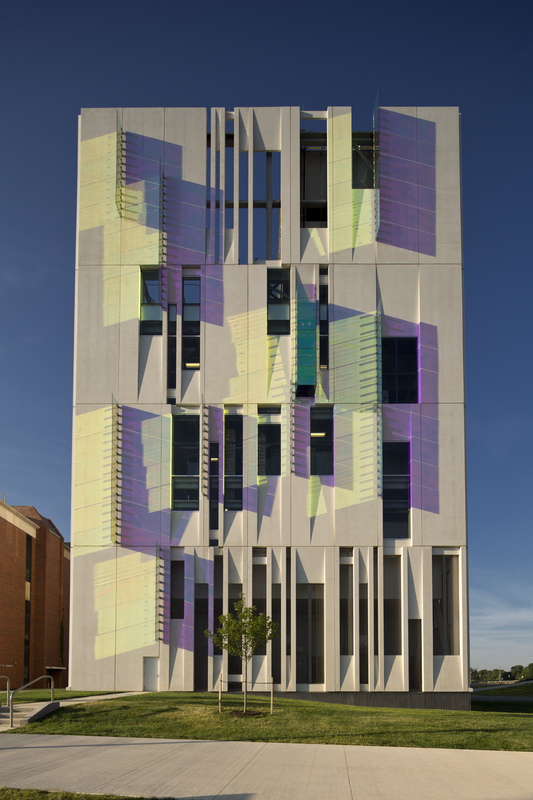 The final result is impressive, but even more impressive when natural light and shadows come into play throughout the day. 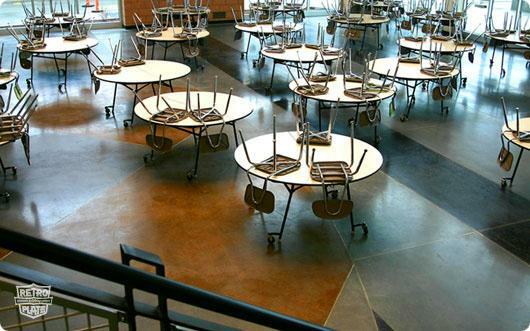 The floor design is always changing. 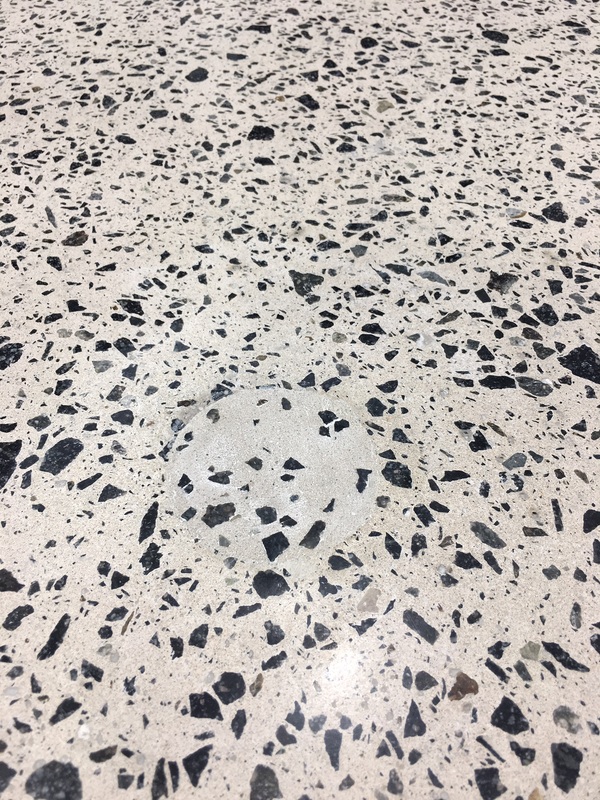 The floor also required significant holes be repaired – filling it with CreteFill Spall Repair, cement, sand and aggregate, and properly blending and disguising the area for a seamless looking floor. 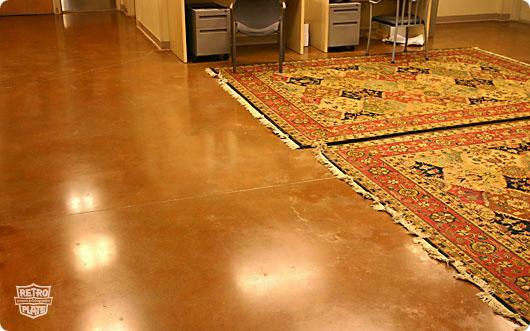 Ultimately, the showroom, workshop and office area floors were successfully finished to the client’s expectations. 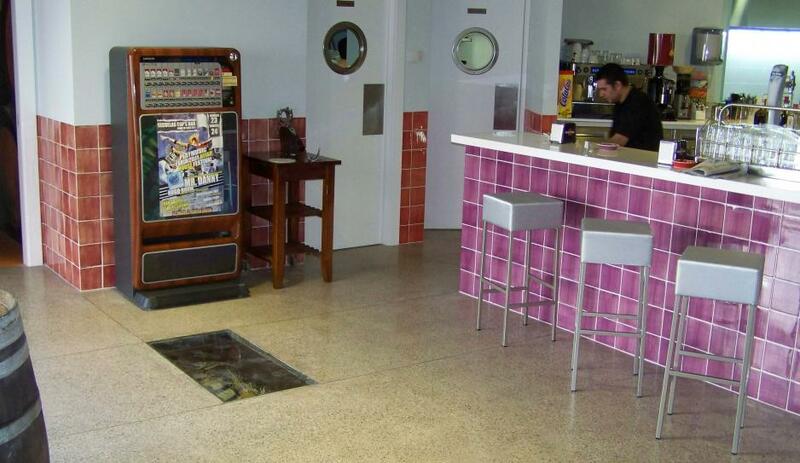 The main goal was to “produce a floor that he was proud to showcase his classic cars and present to his high-end corporate customers,” said Callum O’Neill of RetroPlate Australia. 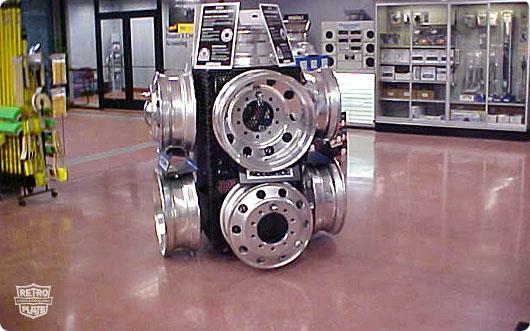 RetroPlate Was Too Expensive… Until the Inferior Product Failed. 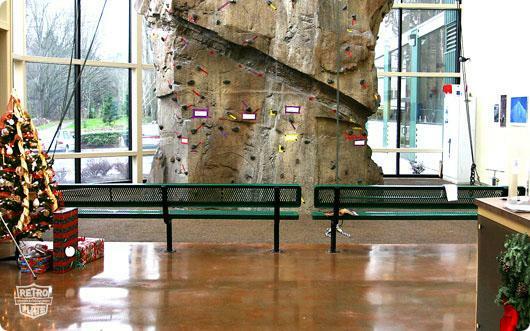 This Pacific Northwest fitness club was built in 2002. 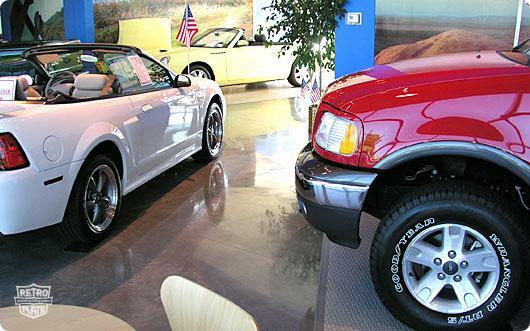 At the original completion of the project the owner believed that the cost of RetroPlate was too expensive, and that they could get by with a cheaper product. 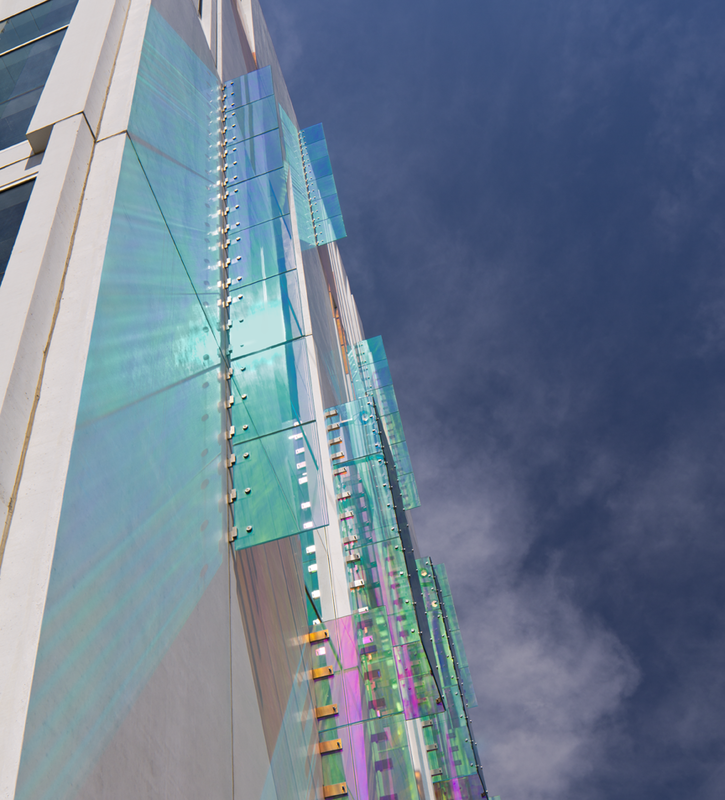 Within 12 months the topical product that was chosen for installation was failing in all of the traffic lanes. 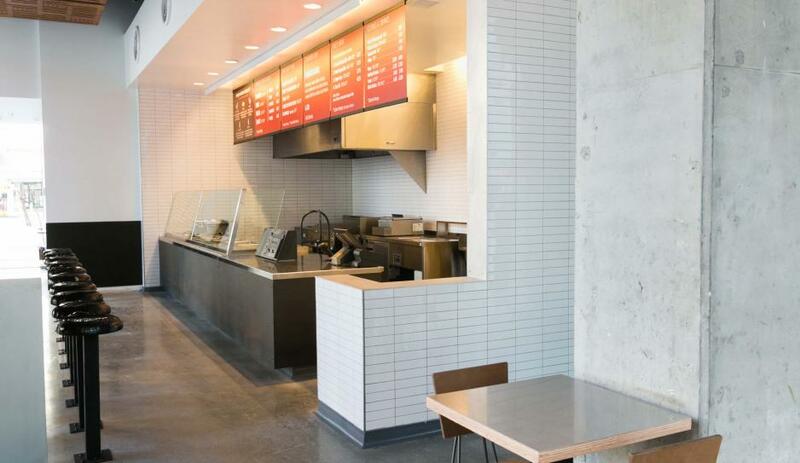 Ultimately, the product that was “less expensive” turned out to be “more expensive”. 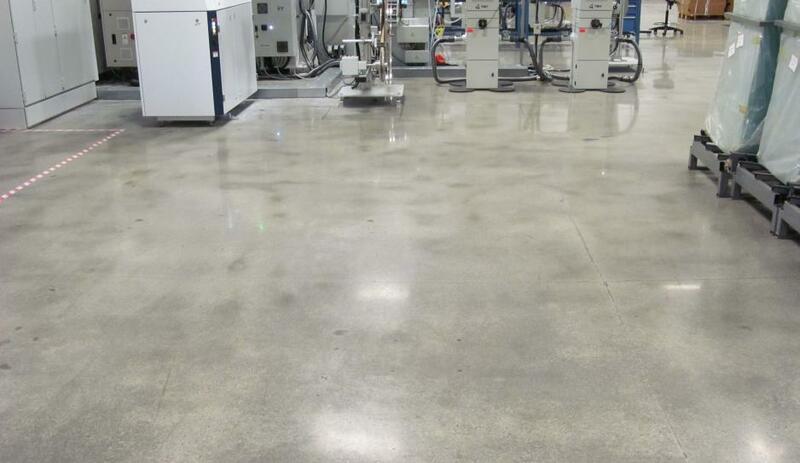 The owner brought in NWSR, a Certified Applicator who had originally bid the project to remove the failing product, and to provide RetroPlate and Acid Stain on their floor. 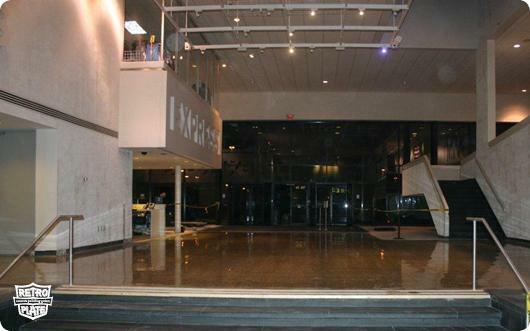 With all work being performed at night while the club was normally closed, the club never closed the doors to its customers. 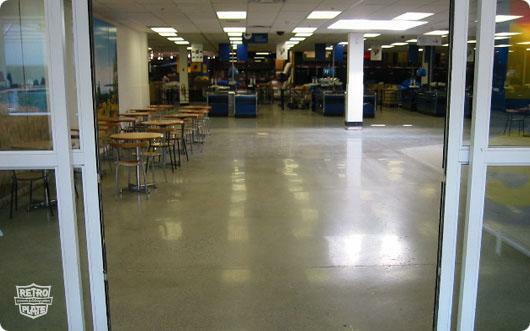 Today, all of the club’s locations are RetroPlate and Acid Stain from Day One, with more in the planning stages. 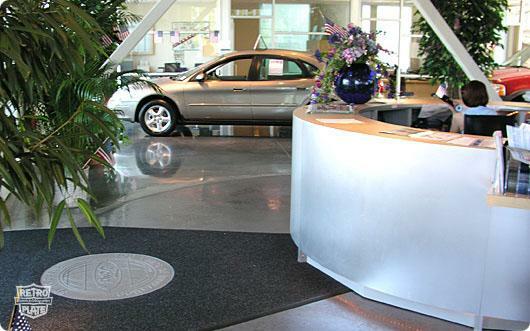 Bottom line: Look at the true costs of the product that you choose …and RetroPlate will generally be your cost effective choice. 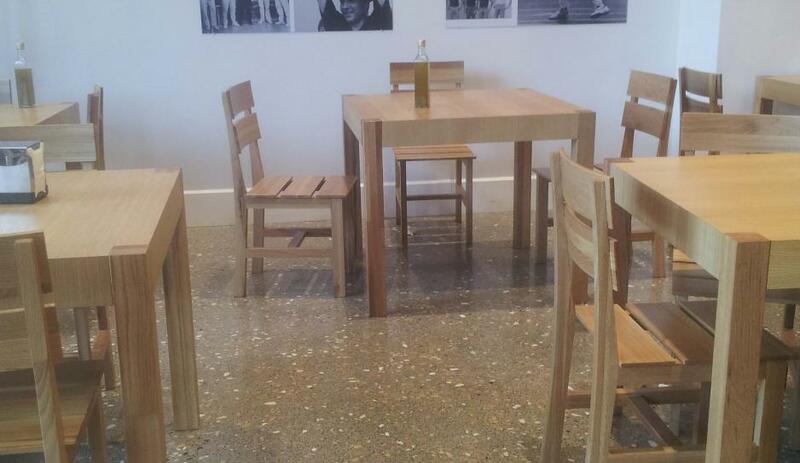 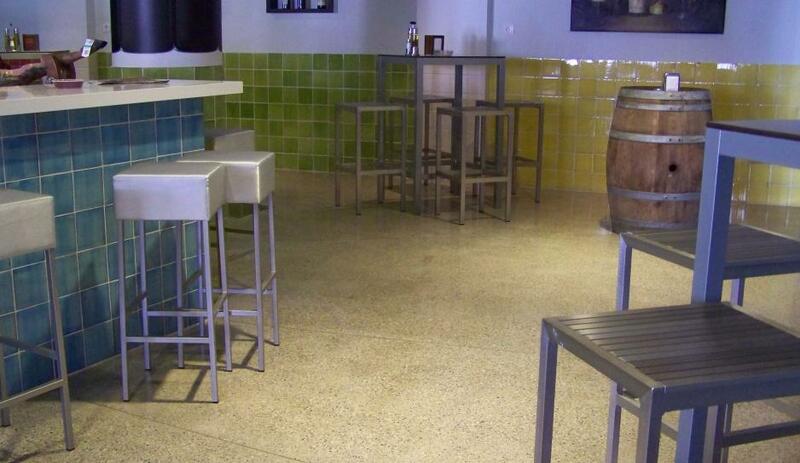 RetroPlate is a long term flooring choice with minimal maintenance needs. 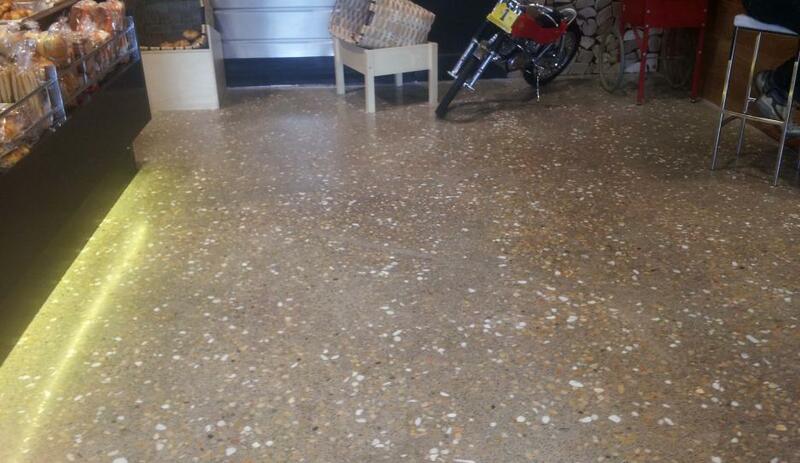 The floor in this hardware store in coastal Oregon is not only beautiful, but it is also functional. 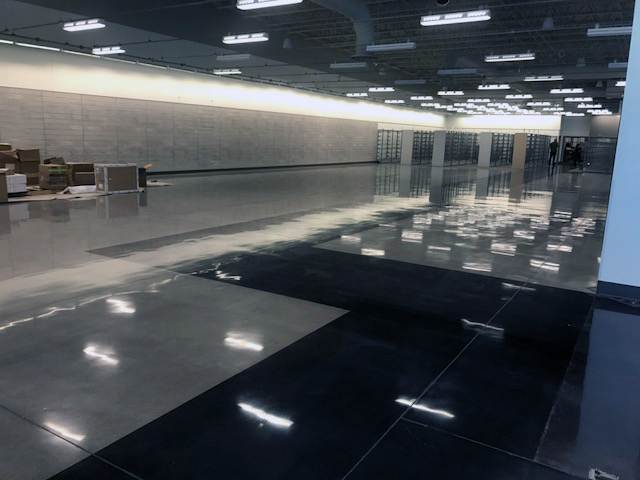 A total of just under 15,000 sq.ft. 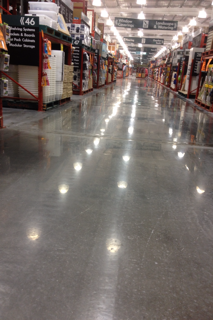 of acid stain and RetroPlated concrete are under the roof at Astoria Builders Supply. 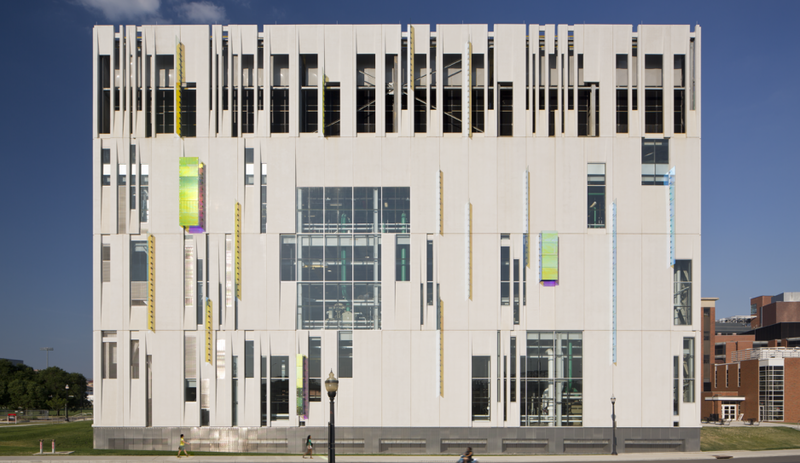 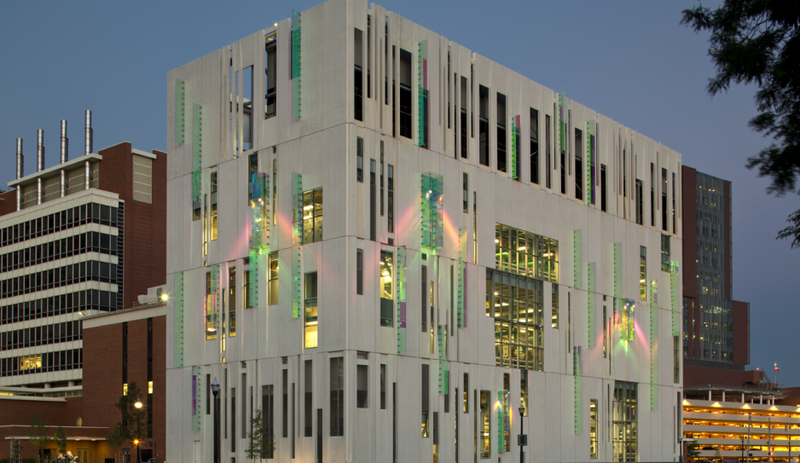 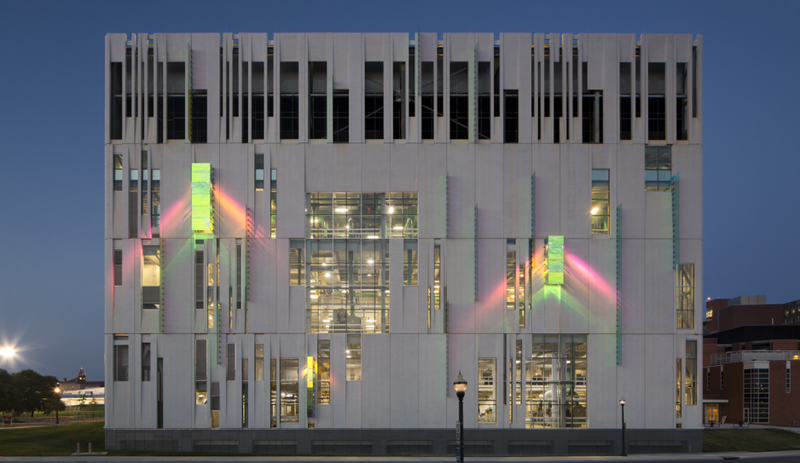 The building, designed by architect Scott Stemper of Seattle, was completed in 2002, and incorporates a radiant heating system in the slab, along with large windows for natural lighting. 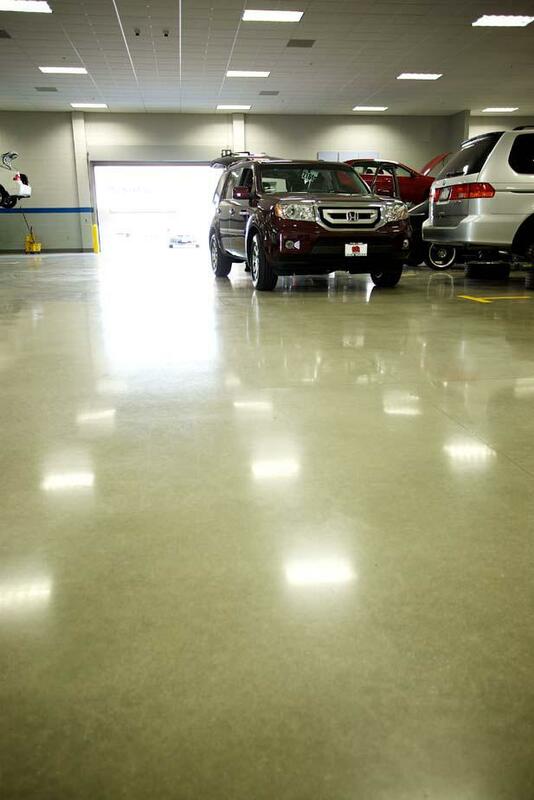 The owner chose RetroPlate with Acid Stain for its long term wear ability, along with on-going maintenance ease and savings. 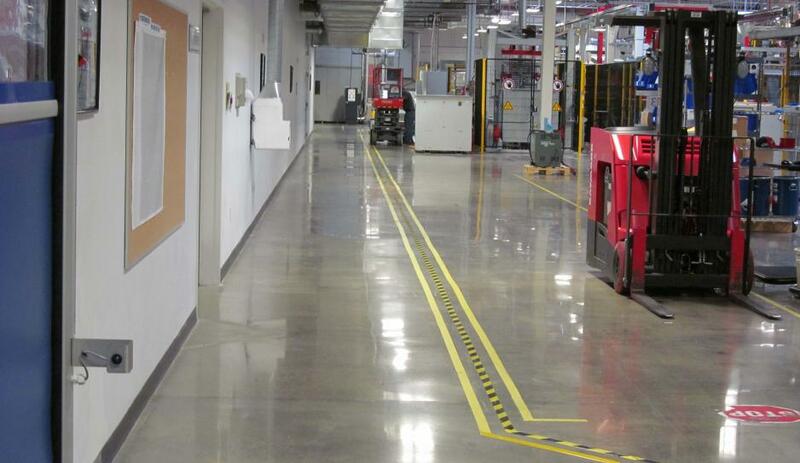 In this installation, the floor receives both foot and forklift traffic on a daily basis, and has performed exactly as the architect and owner expected. 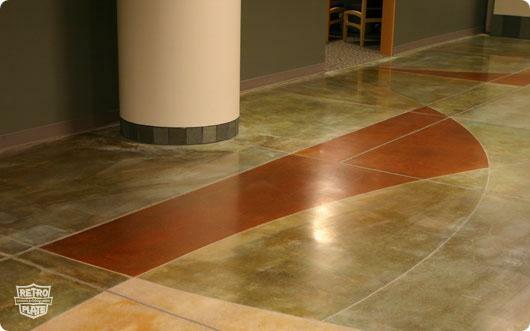 This integrally colored floor in California creates a unique color and look for this RetroPlate floor. 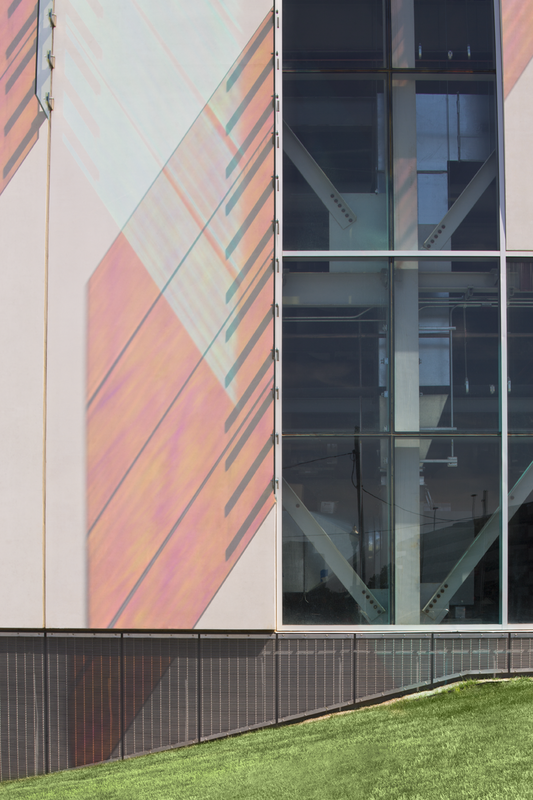 Integral colors come in any color and combined with the RetroPlate System can create a look that is as individual as it is beautiful. 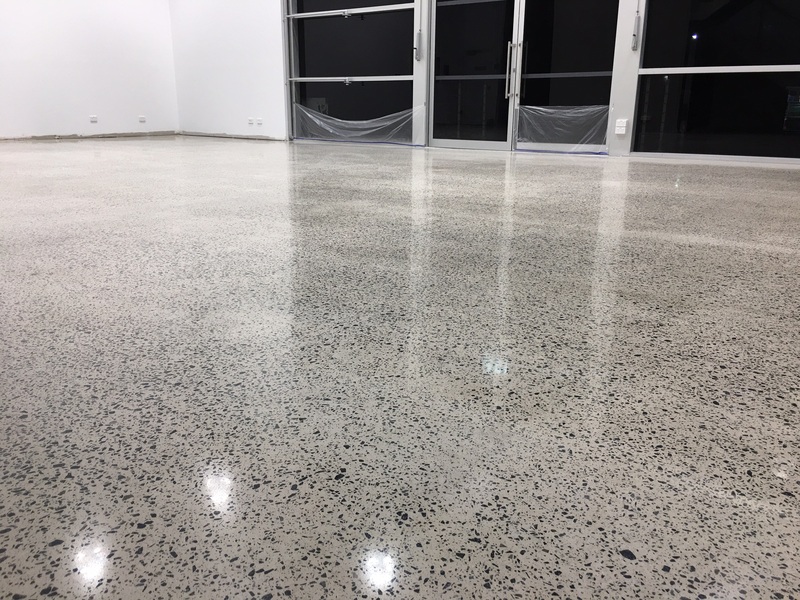 This concrete floor at Bunnings Box Hill was previously an Ashford Formula treated concrete floor, performing beautifully. 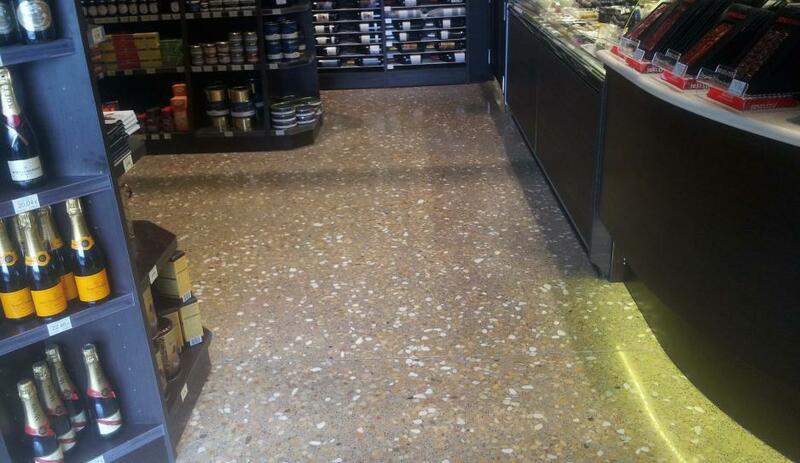 However, the client requested an upgrade to provide a new polished floor to coincide with the lighting upgrade at the store. 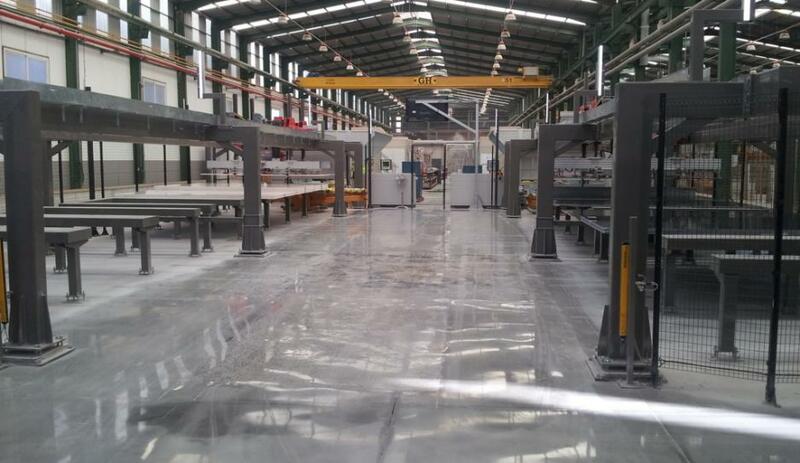 For further information on the process, please contact our Australian Distributor RetroPlate Australia. 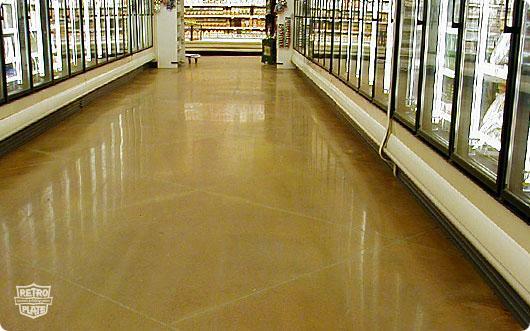 This international retailer specifies the RetroPlate System to combine a hard, polished floor with an easy-to-clean floor. 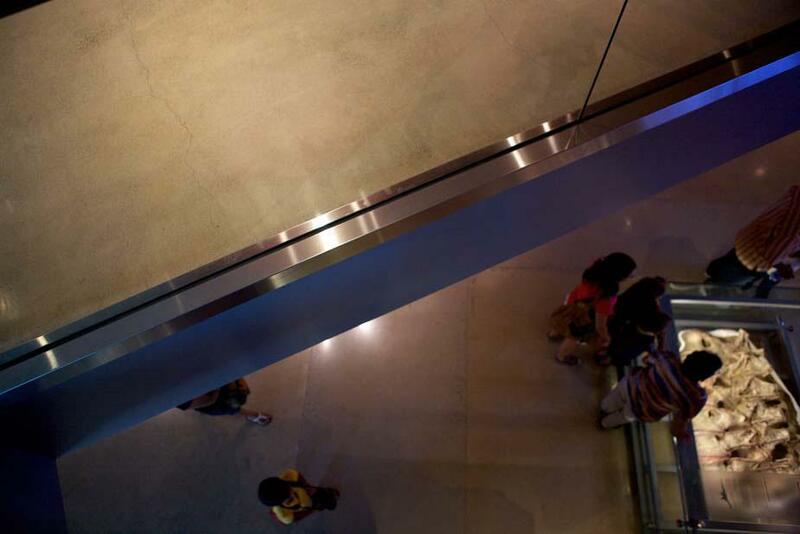 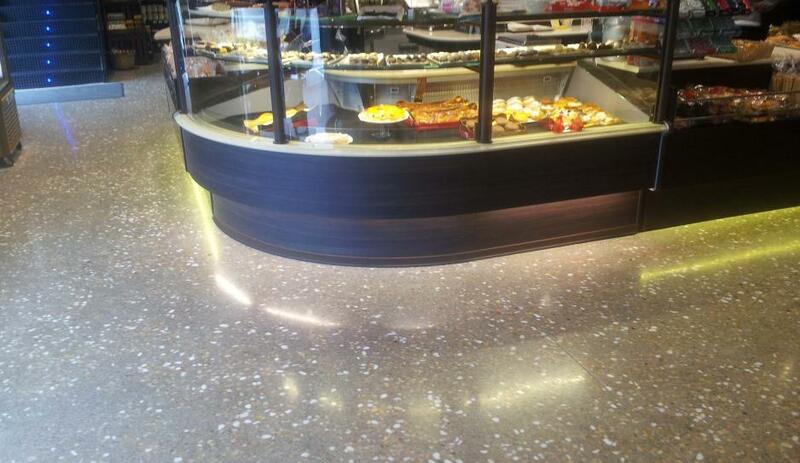 The reflectivity has allowed them to reduce the lighting in their stores and the polished floors create an enhanced environment for the customer. 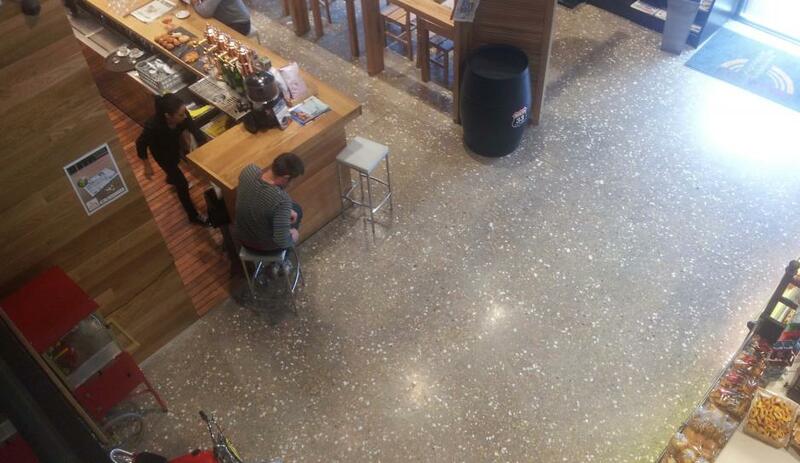 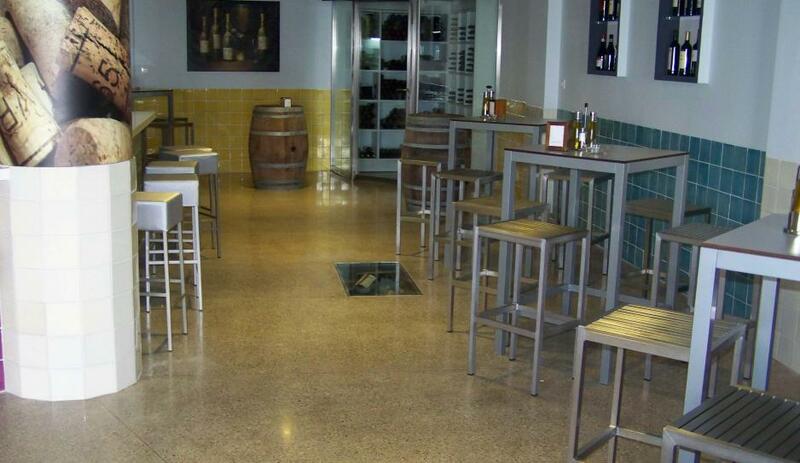 The RetroPlate System is the ideal flooring system for a retail environment. 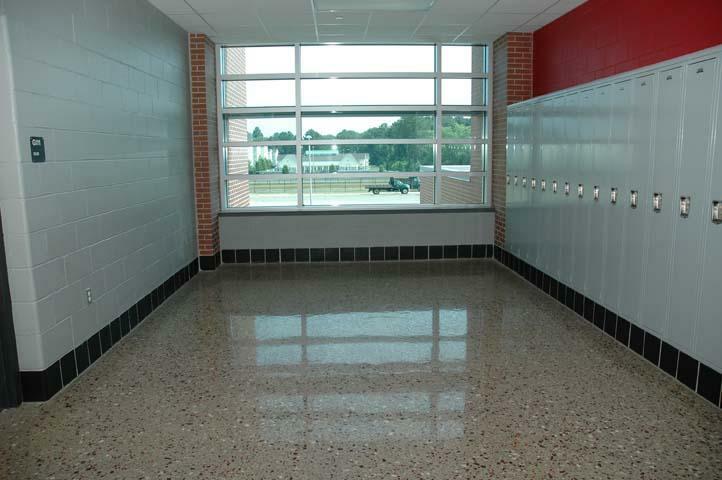 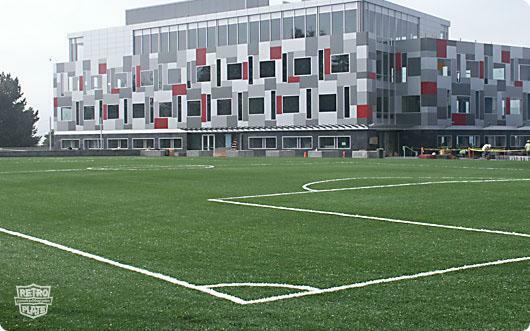 It is easy to maintain, beautiful, and competitively priced, and the durable surface has a unique look. 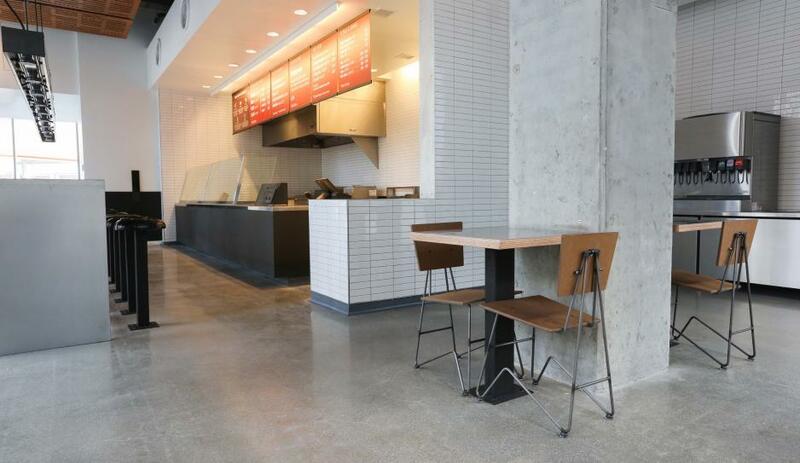 The RetroPlate System is taking retail floors to the next level in construction, design, and architecture. 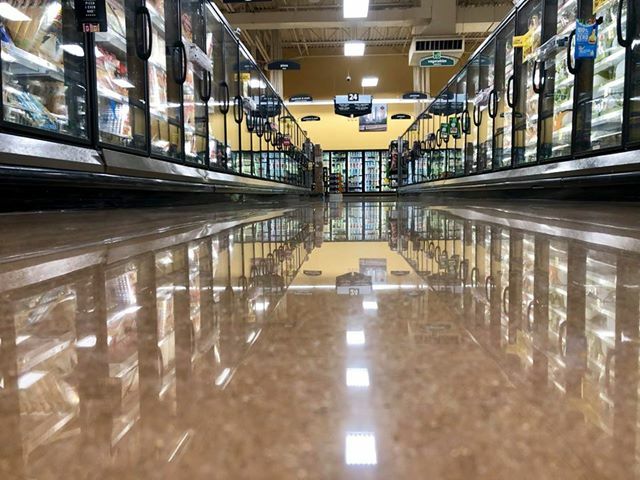 This grocery store chain has found big savings in its maintenance budget from the RetroPlate System, as well as a great new look for their floors. 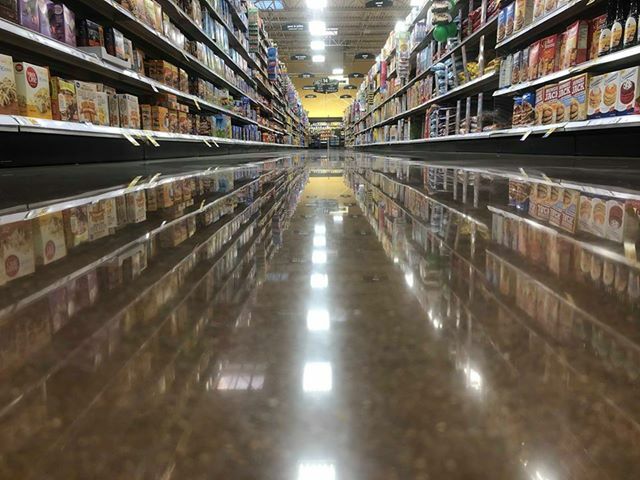 Highly reflective, abrasion resistance, and easy to clean – the RetroPlate System is transforming the way grocery stores look at their floors. 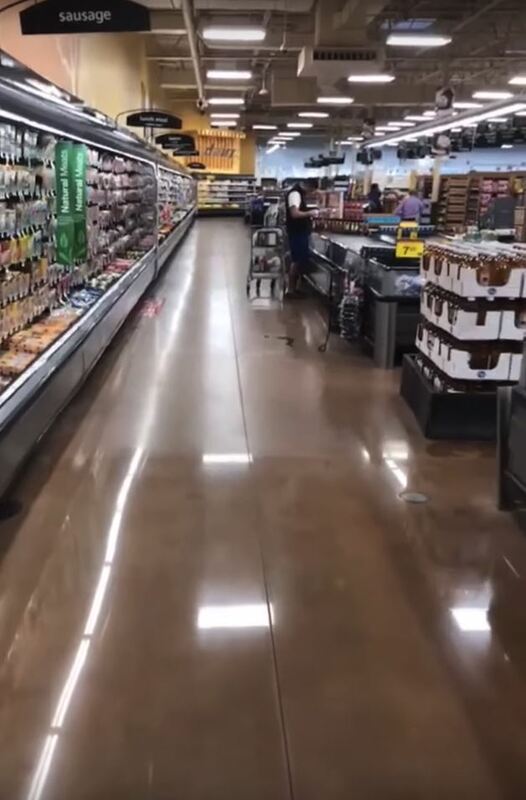 This acid stained, RetroPlated, and saw cut grocery floor looks like giant 4’ x 4’ tiles, but without the cost, maintenance, vapor drive problems, and eventual replacement associated with tile. 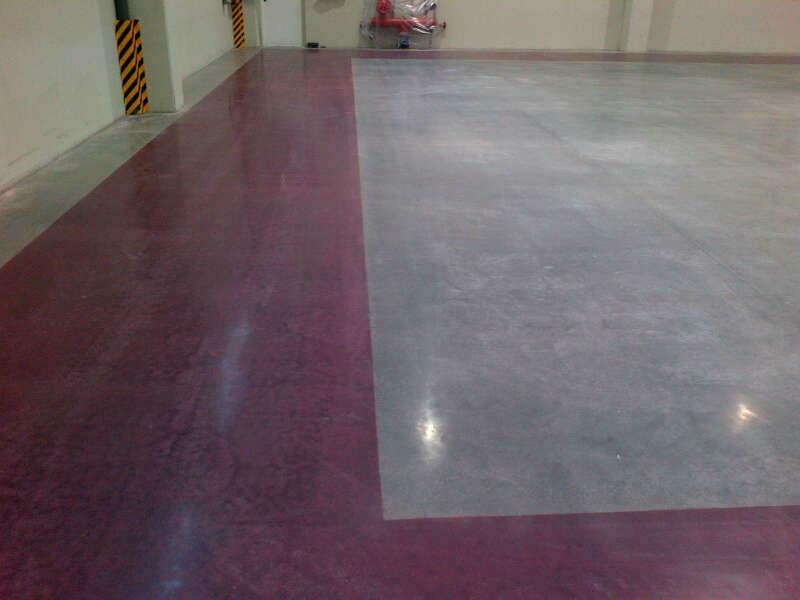 The different look and feel achieved through the RetroPlate System are limitless, and the entire process is done on the concrete floor that is already in place. 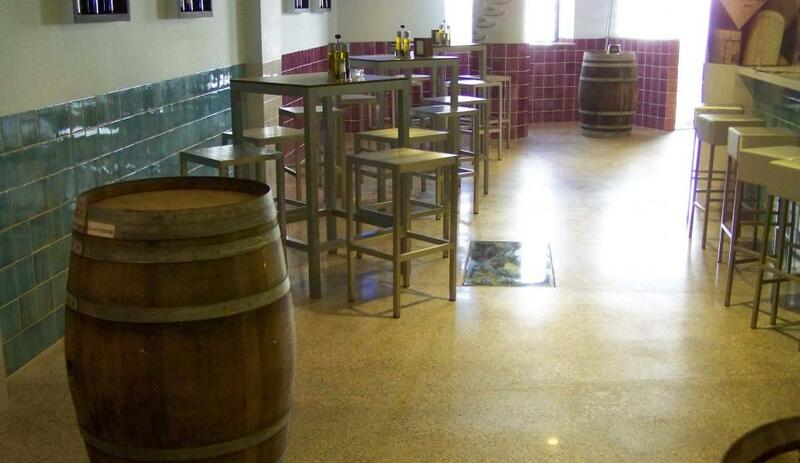 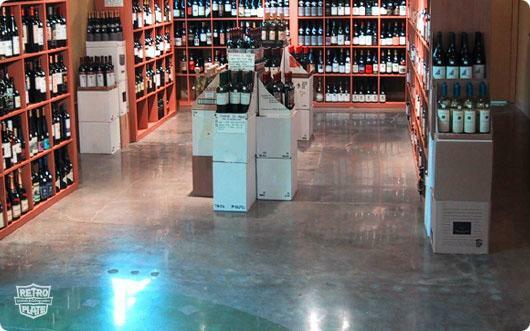 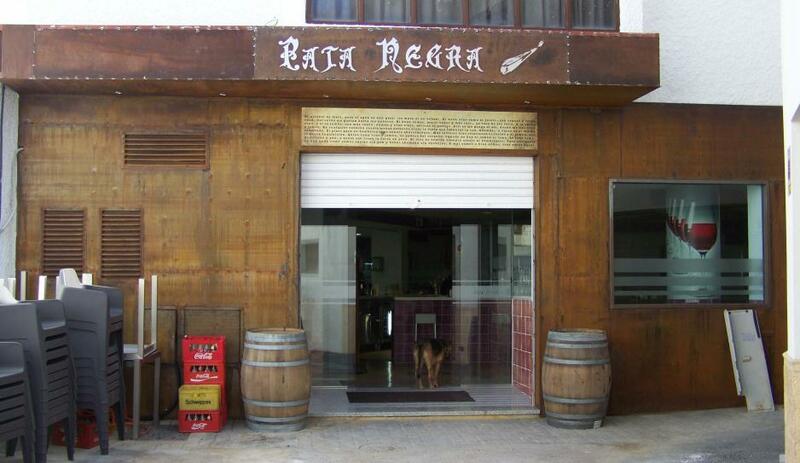 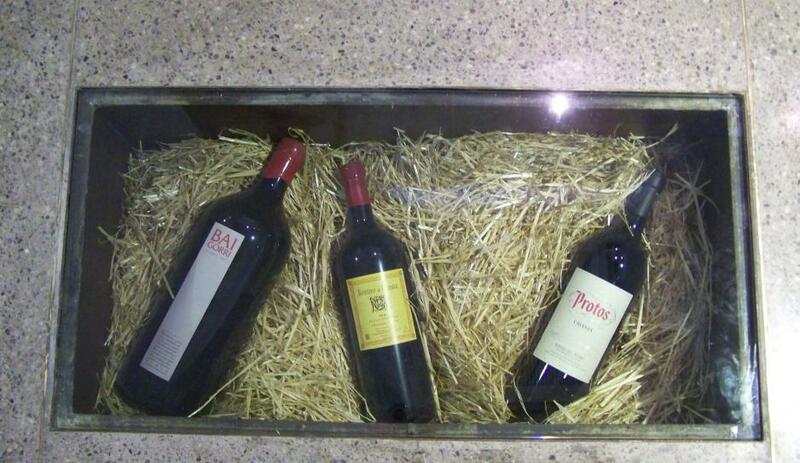 START TO FINISH PROCESS: On this project which was completed back in 2001, our Certified Applicator started with a 50+ year old slab in a building that had been constructed as a veterinary clinic, and was now being converted to a wine store. 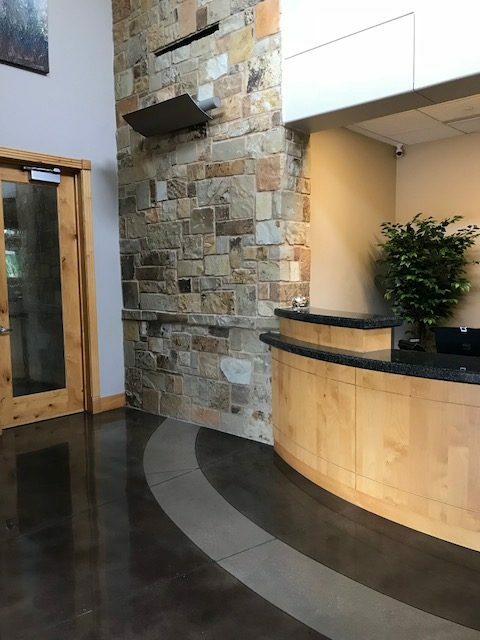 The General Contractor had to perform saw cuts and do pour backs for plumbing and electrical; the floor was stripped of old VAT; and the final project was to be a combination of RetroPlated concrete with acid stained graphics. 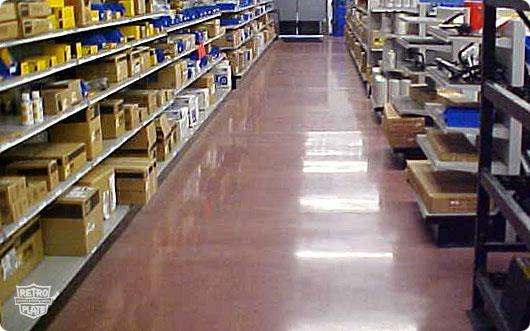 With RetroPlate, NO TOPICAL SEALERS ARE REQUIRED OVER ACID STAIN. 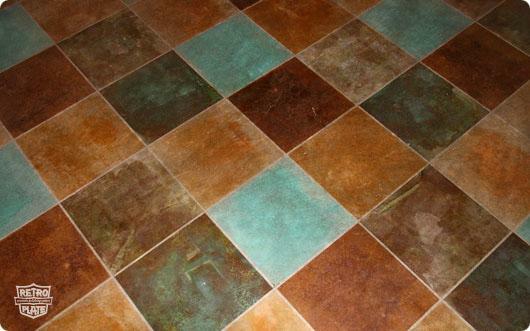 You will note from the photographs, that “ghosting” of the previous tile pattern will be present, even after the diamond grinding. 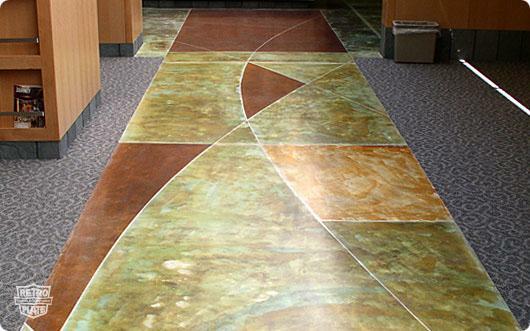 Following the initial grinding, the acid stain pattern was laid out with a specialty tape, thus eliminating the need to provide decorative saw cuts, along with eliminating the need for joint fillers. 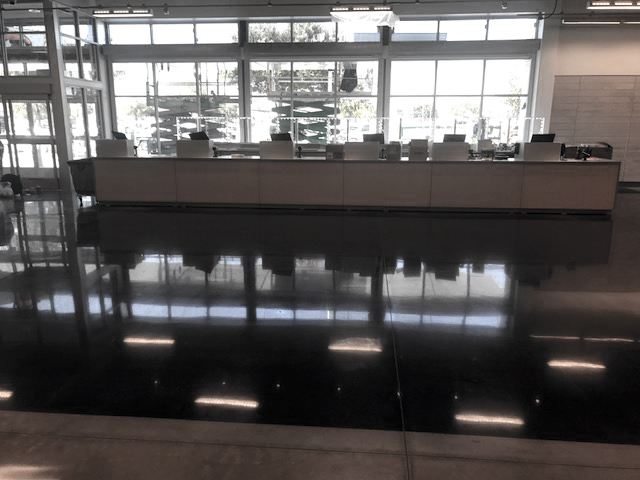 Bottom Line: The customer received a beautiful, polished concrete floor with great appearance and minimal maintenance requirements! 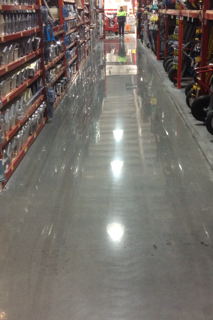 The RetroPlate System increases the reflectivity by 30%. 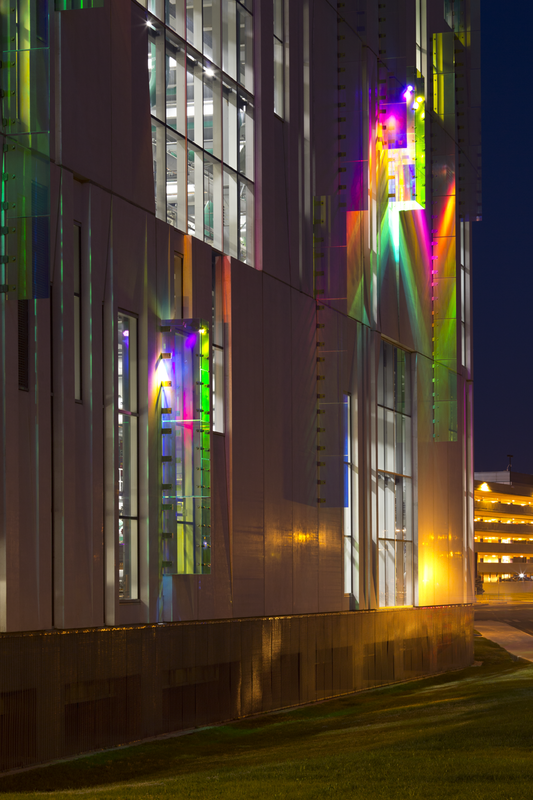 This enhanced reflectivity creates a brighter and more purchase-friendly environment. 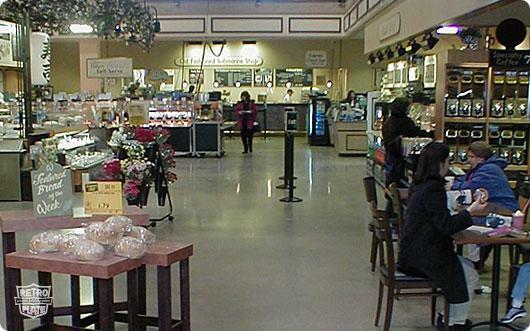 The added light and added visibility of products allows the retailer to accentuate the products from the bottom to the top of the racks. 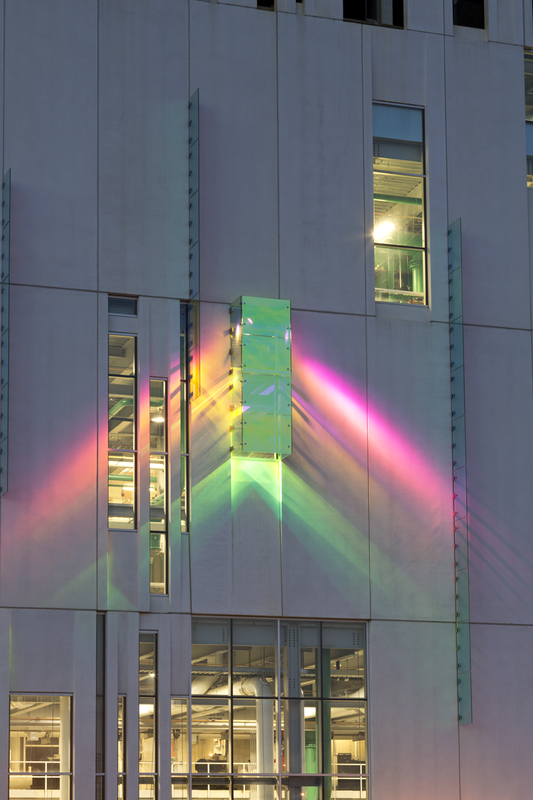 RetroPlate customers can reduce the amount of light necessary in their buildings because of the increased reflectivity, saving money on lighting costs. 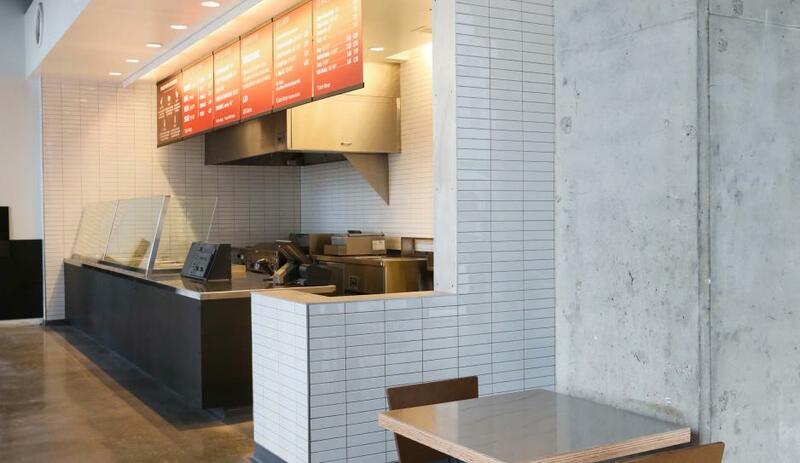 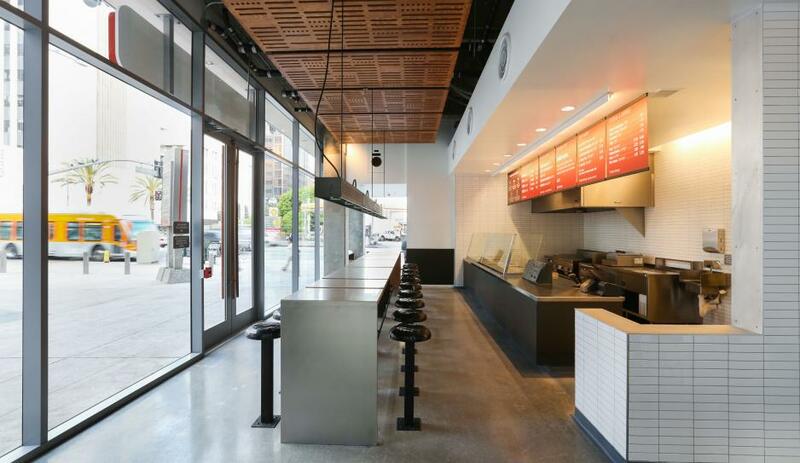 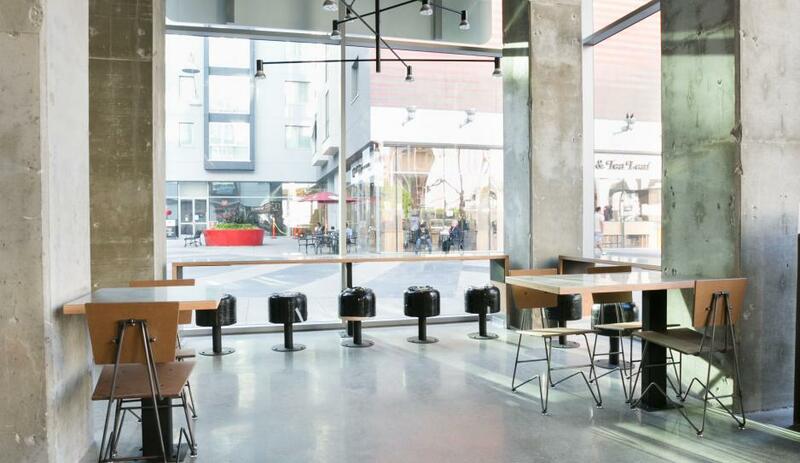 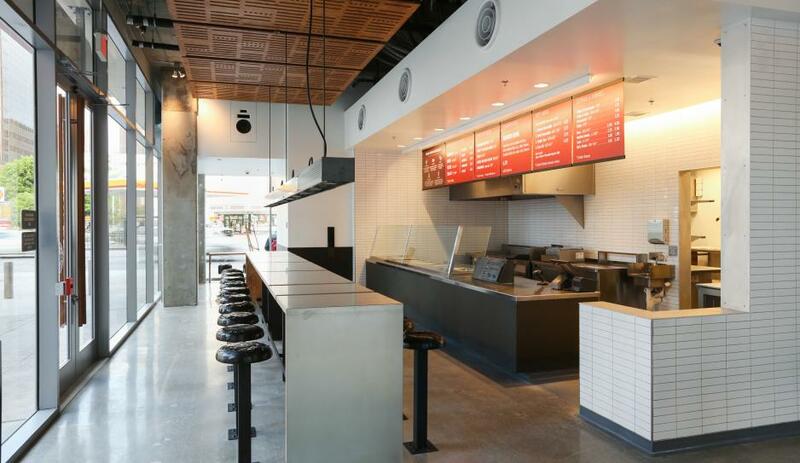 Mark Beamish Waterproofing began work on this Chipotle project in Los Angeles by filling existing cracks, joints and spalls before starting the metal polishing. 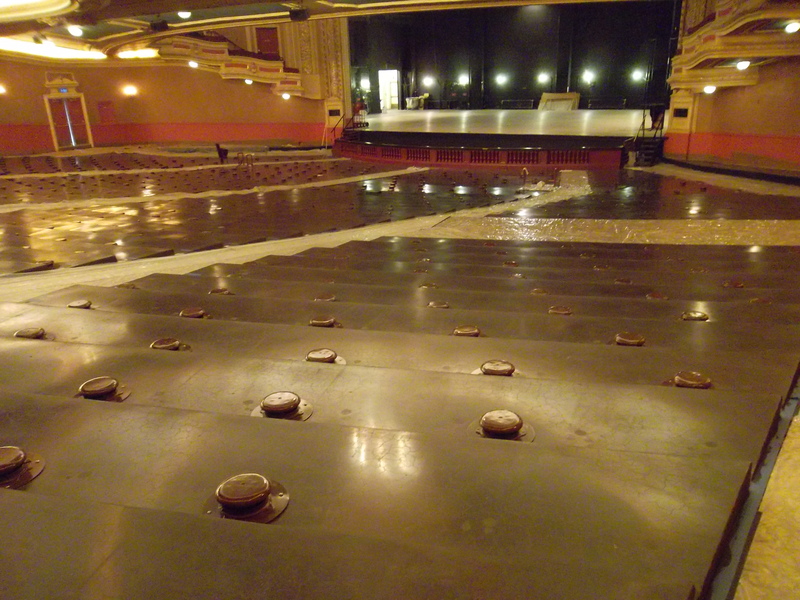 The Retroplate System was installed across 1,000 ft2 after which the floor was guarded and burnished. 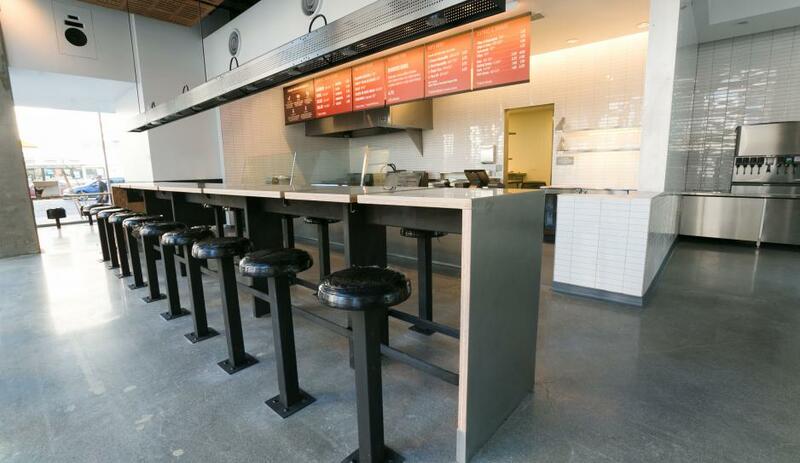 Pleased with the final product, Chipotle has been added to Mark Beamish Waterproofing’s extensive list of satisfied customers. 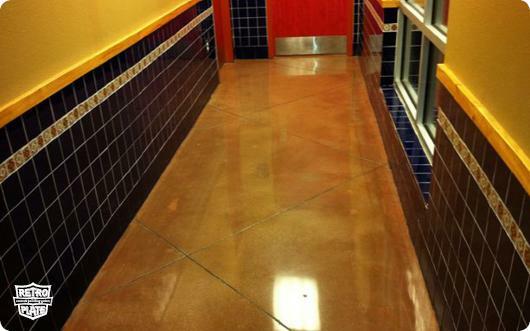 This national Mexican restaurant chain chose to benefit from RetroPlate with acid stain at this location. 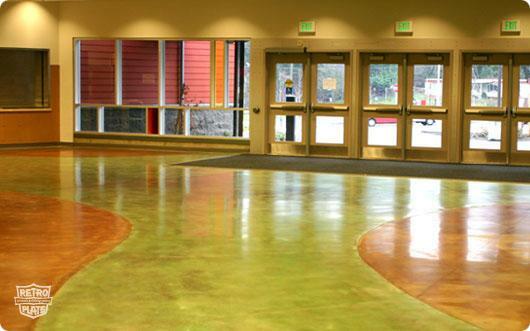 The floor delivers a vibrant atmosphere for their customers, along with providing a final floor finish that doesn’t require a topical sealer, and it is easily maintained. 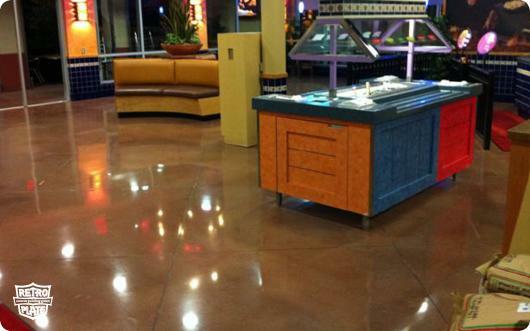 This Taco Cabana in Mesquite, Texas was a 2012 Polished Concrete Awards nominee in the Retail category. 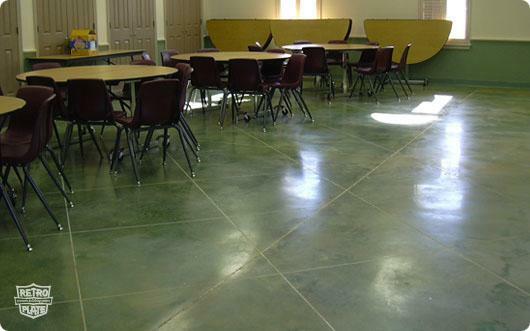 Barson Protech of Addiston, Texas was the contrator for the project. 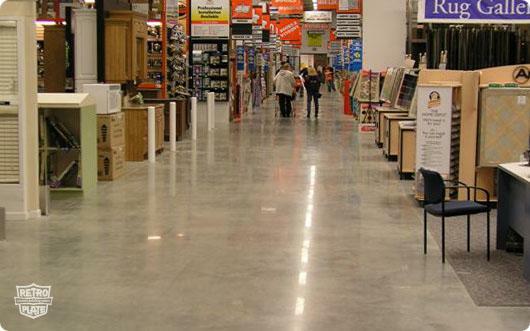 All work had to be completed after store hours and before 6:30 am, in one night, before the store manager arrived. 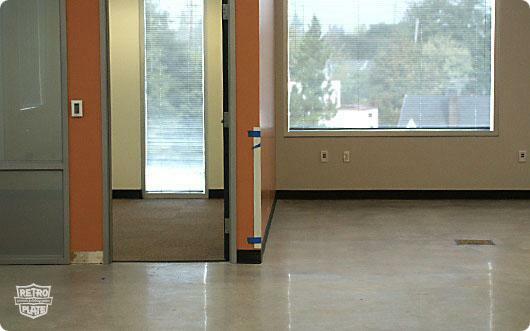 The furniture and equipment were moved to one side of the room as one-half of the floor was ground, densified, and polished. 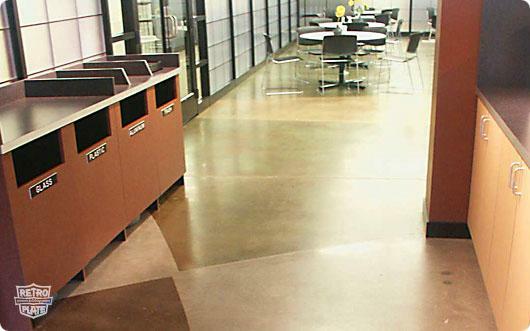 The applicator, Barson Protech, chose the RetroPlate® System because the owner had unsuccessfully re-applied topcoats to the existing dry shake color hardener floor. 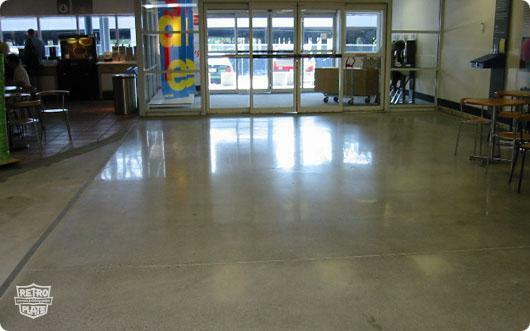 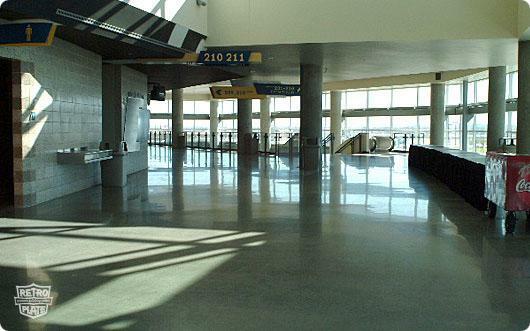 Because of the heavy foot traffic, the owner was hoping for a diamond polishing system to enhance the performance of the colored concrete and eliminate the need for re-applying topcoats, reducing costly maintenance. 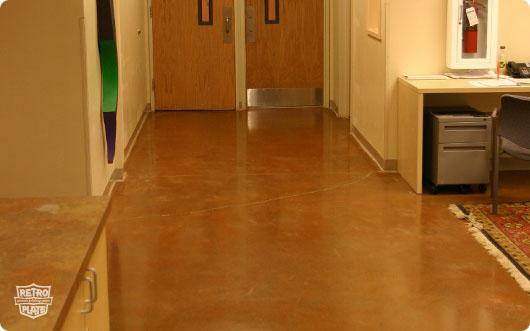 The RetroPlate® System uses a permanent densifier to seal and harden the concrete. 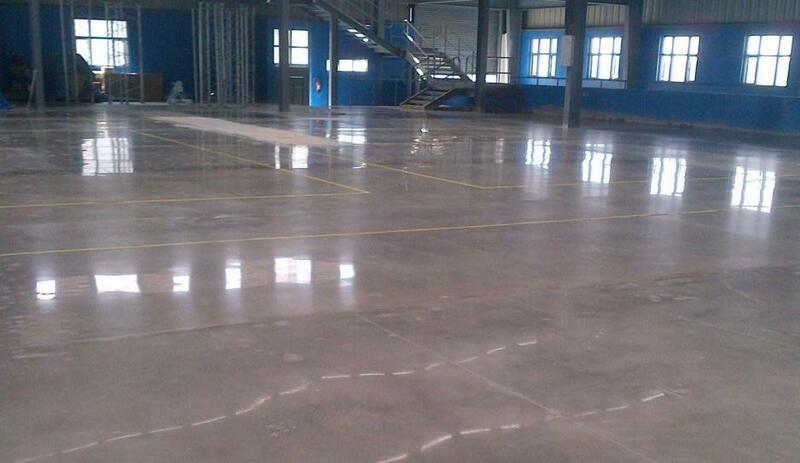 The added benefit of stabilizing the concrete and enhancing the sheen appealed to the owner. 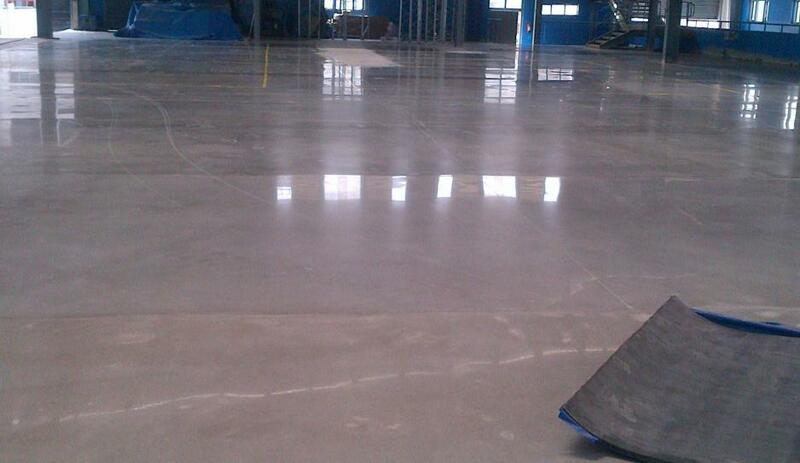 The existing floor’s joints were in good shape and there were a couple of minor hairline cracks. 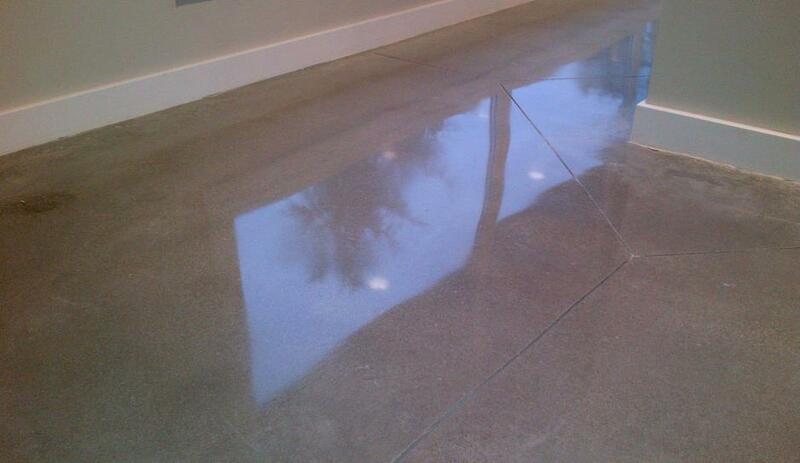 There was no need to use a joint filler or crack repair. 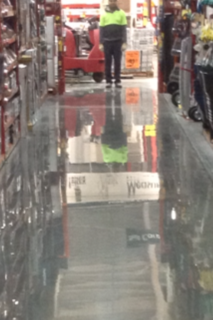 The next process was deciding what diamonds to use. 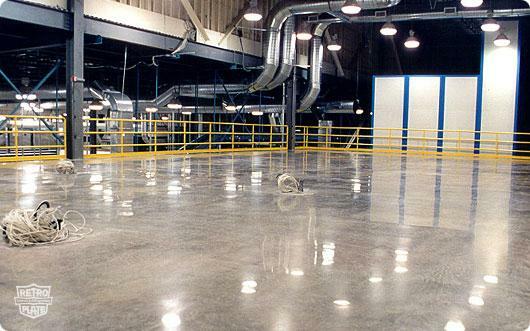 The polishing contractor, Barson Protech, started with 50-grit bonded metal diamonds. 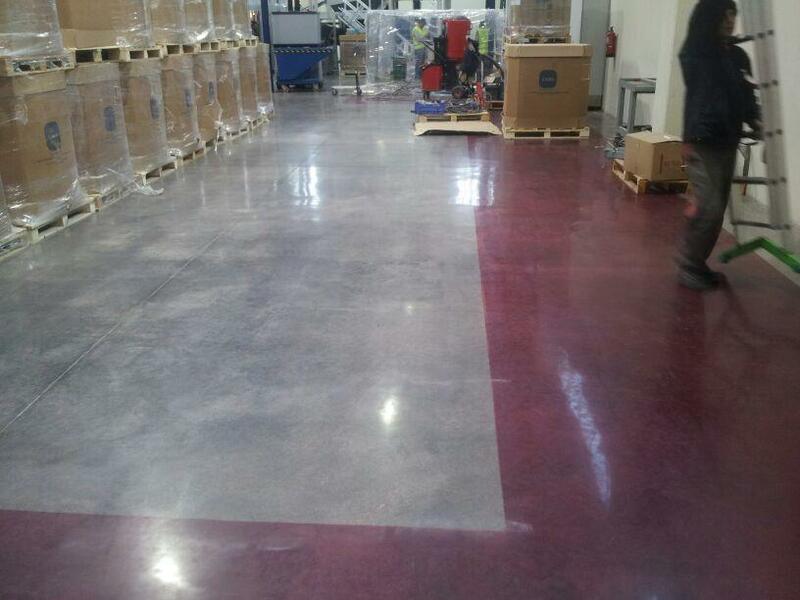 The acrylic topcoats were peeling and removed easily with the first pass of the Eagle grinding machine. 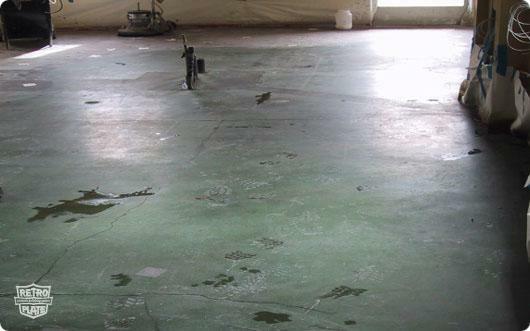 Because of the fast-track schedule, there was no time to work with chemical stripping and removal. 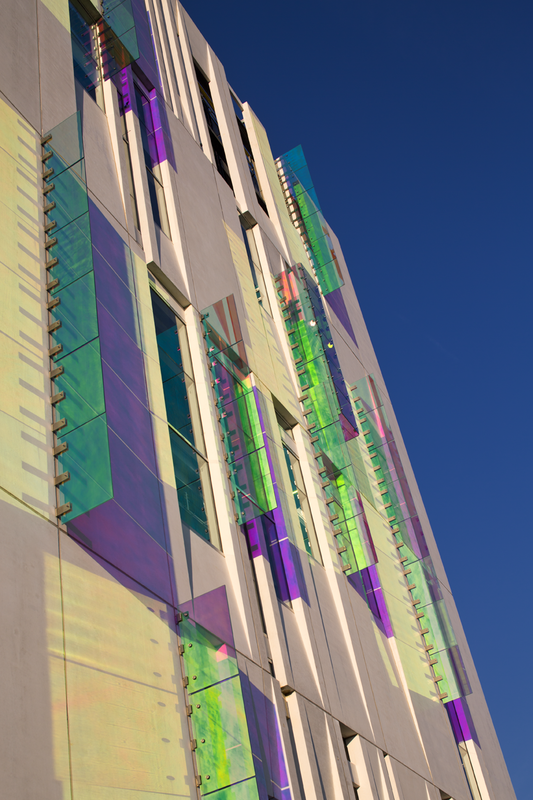 A solvent-based stripper would have been out of the question, according to Chance Beck of Barson Protech. 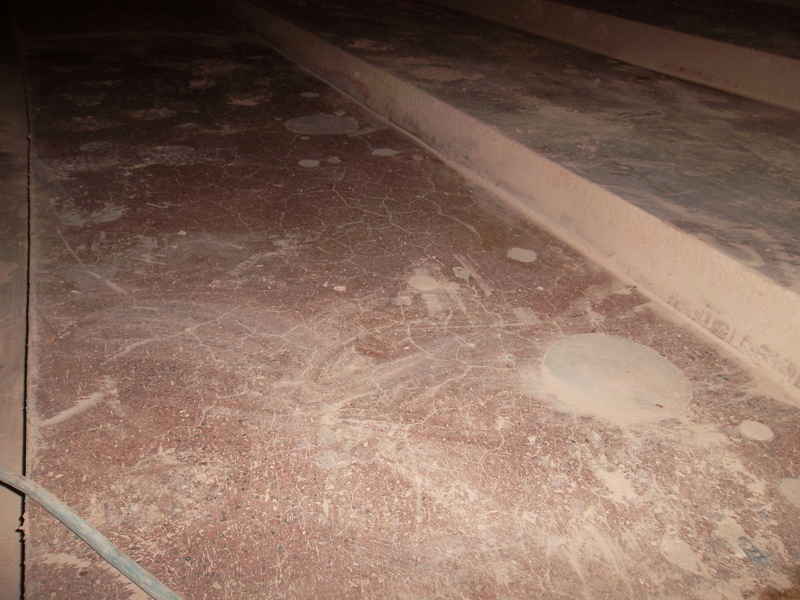 There would not have been enough time to set up adequate ventilation for a solvent-based stripper and the time involved for disposal and removal. 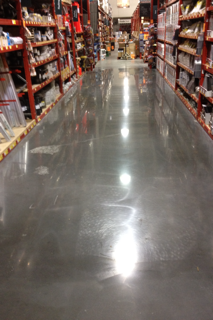 The combination of choosing the correct diamond in conjunction with the heavy-duty grinder equipped with a HEPA filter removed the delaminating topcoats with great speed and left plenty of time to bring this floor up to a 1500-grit polish. 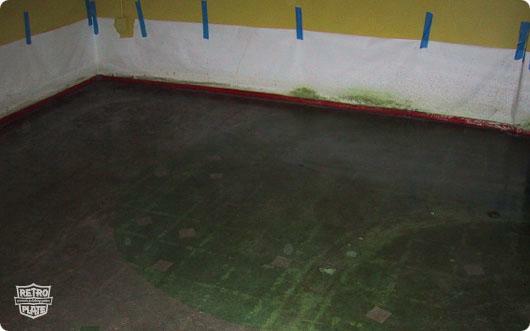 RetroPlate’s RetroGuard™ was applied as the final step as a stain guard. 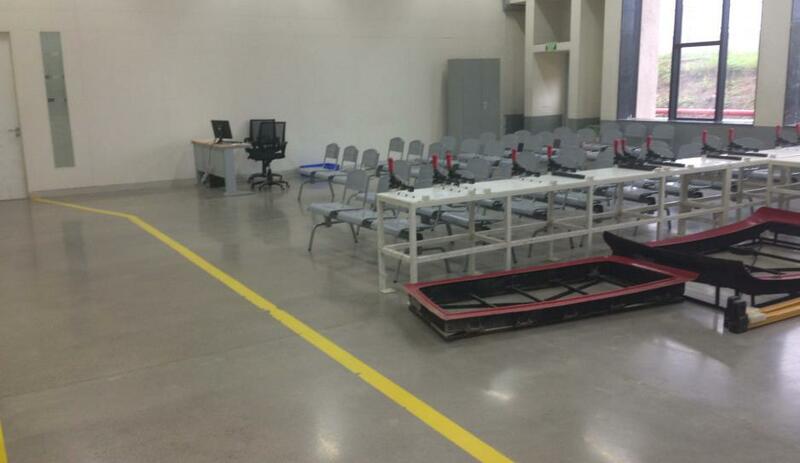 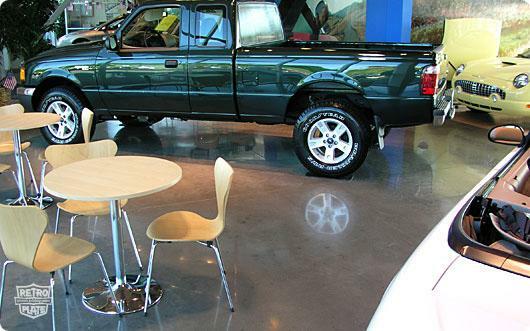 The results are in and the floor polished up beautifully with the RetroPlate® System. 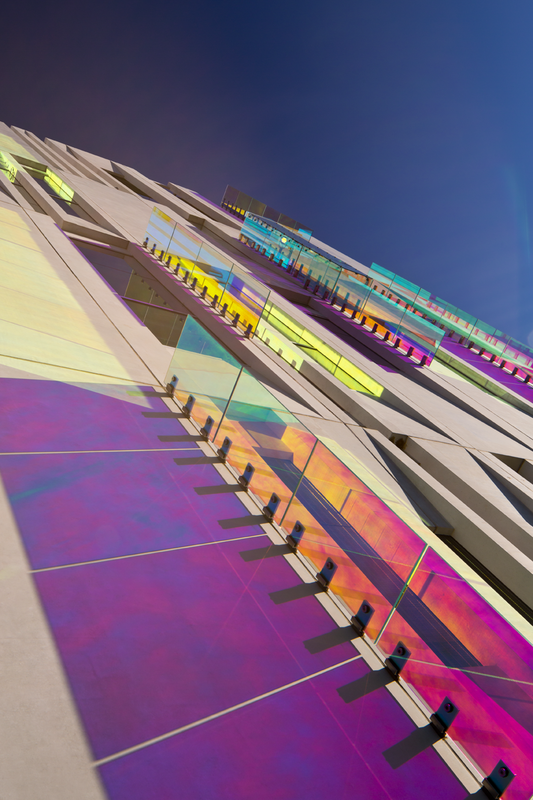 Since then, more existing projects have been polished. 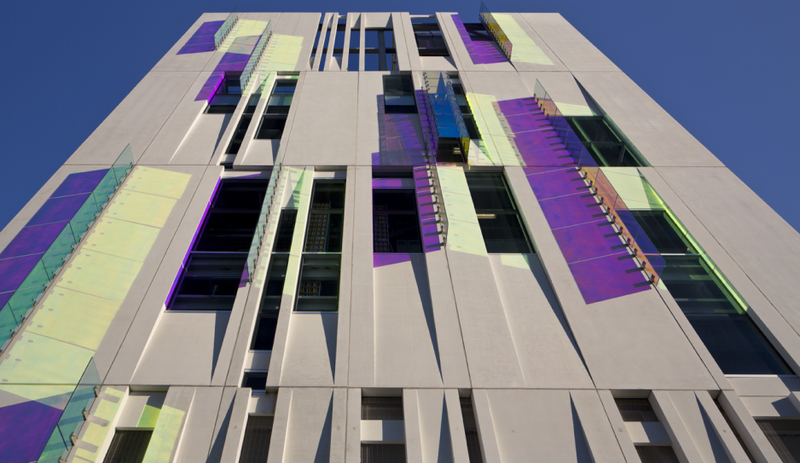 The main floors of this 17-unit, three- story condominium project received RetroPlate, along with several of the retail locations on the ground floor. 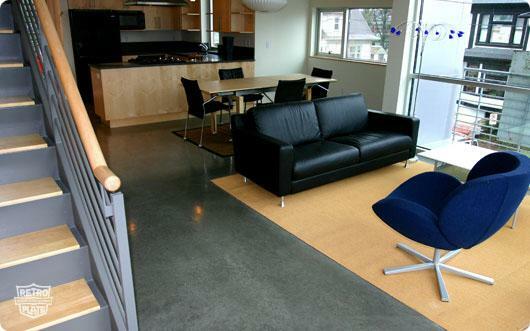 This modern home has integrally colored concrete throughout the daylight basement. 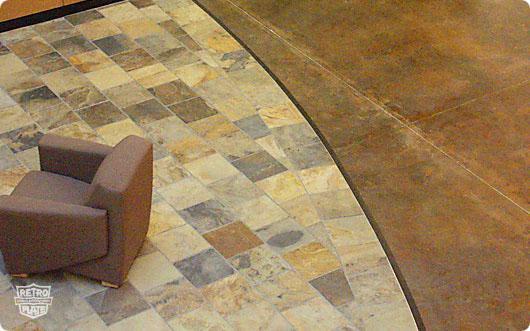 Finishing with the RetroPlate System provides a natural stone-line appearance on the floor. 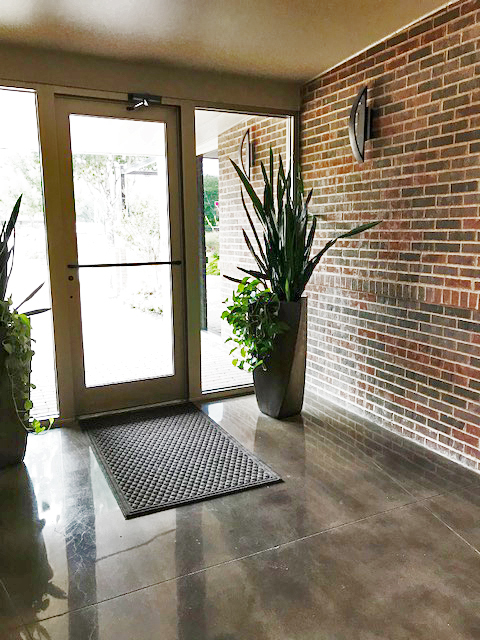 The finished basement living space in this seven-year-old craftsman-style home received an alluring 12”x12” African Slate Title pattern of customer blended acid stains with RetroPlate. 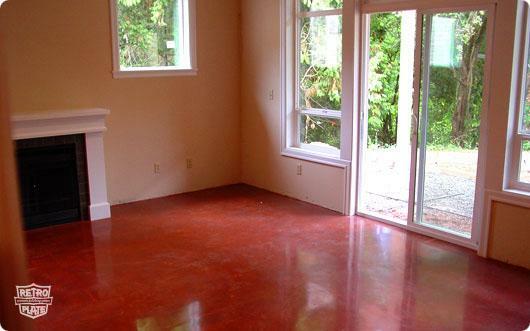 The homeowner was sold on the warmth of the finished floor, along with the ease of maintenance. 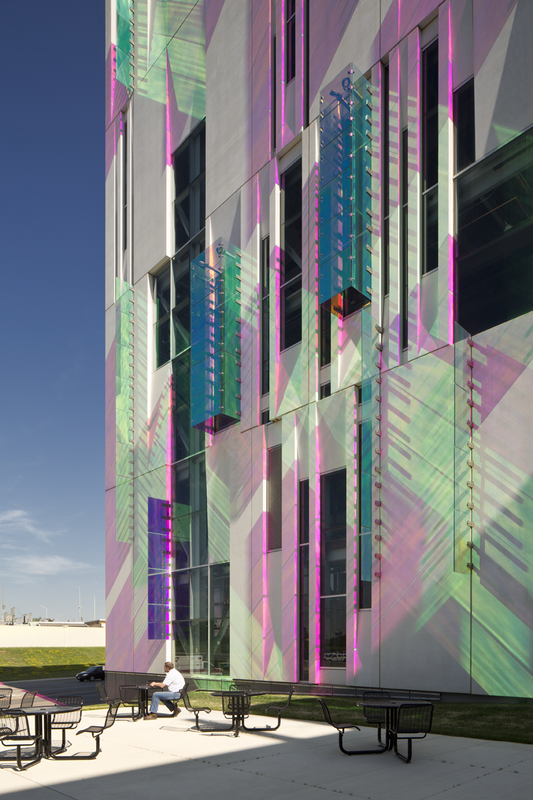 The U.S. headquarters of adidas America is a blend of old and new, and they utilized RetroPlate in areas on both phases of the LEED qualifying project. 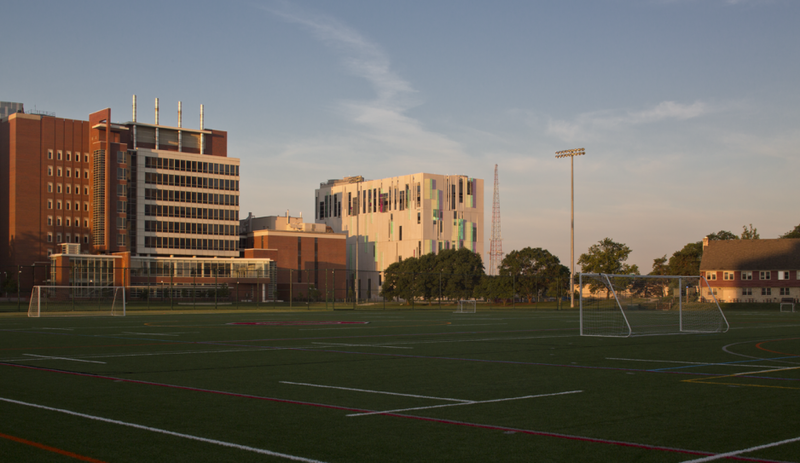 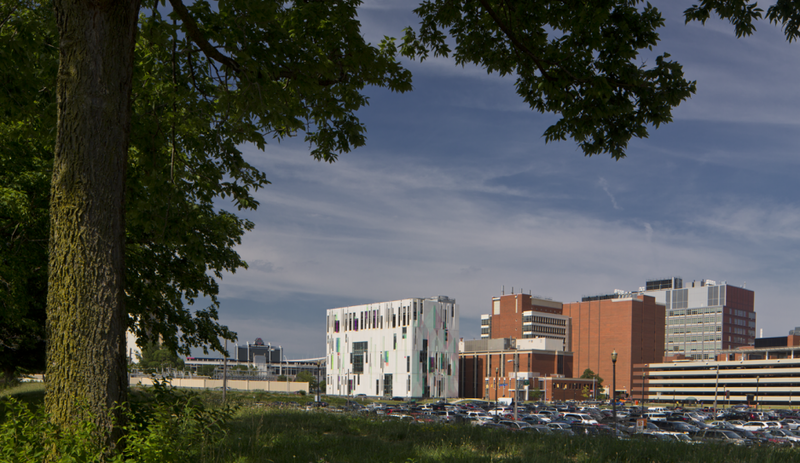 Originally, the three buildings served as a hospital prior to adidas America’s restoration. 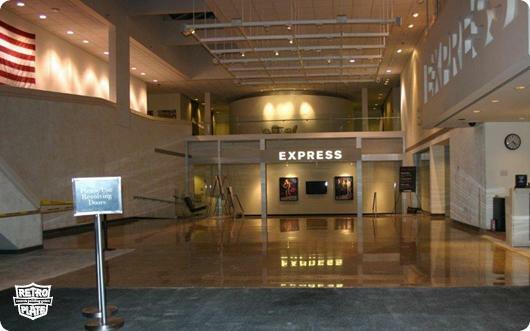 Prominent headquarters open their arms to RetroPlate and acid stain. 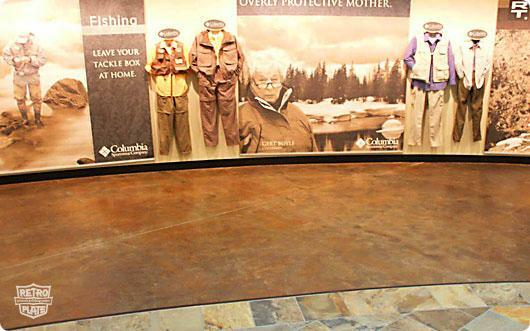 For Columbia Sportswear, RetroPlate and acid stain were the winning combination for tying in their natural rockscape, slate and existing concrete that had previously been covered with VCT and carpet. 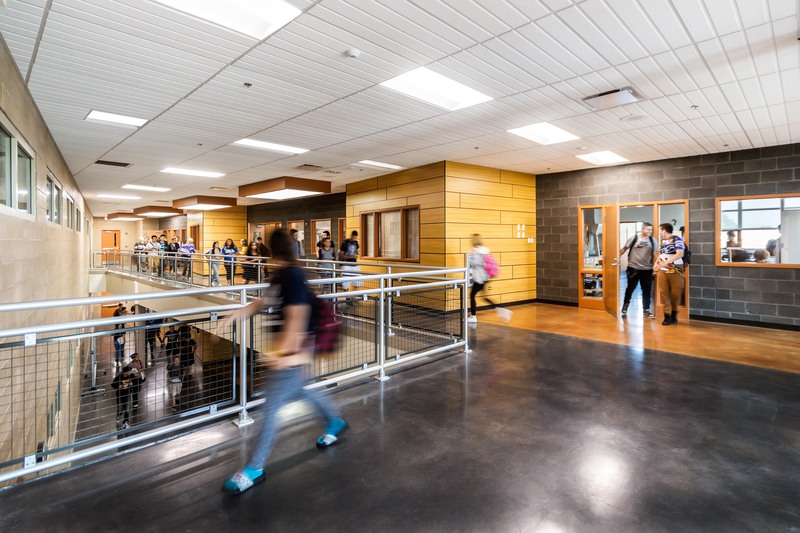 A combination of acid stain was blended to create the 25,000 square foot Columbia Trail that winds through three older buildings. 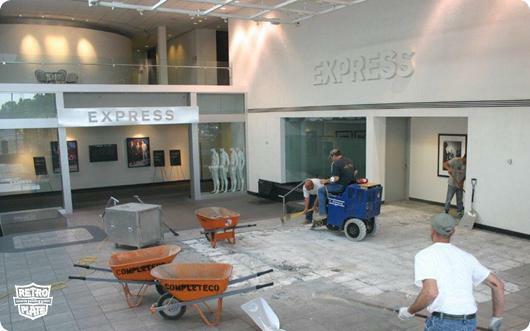 These Gap corporate offices received the RetroPlate System, turning bare concrete into something spectacular. 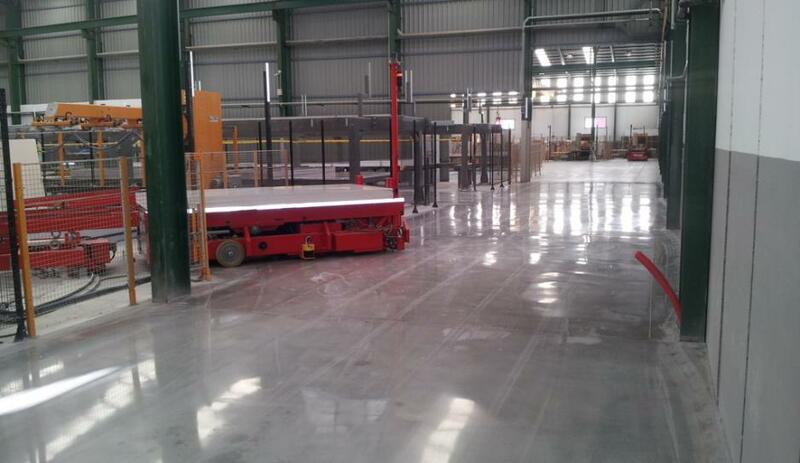 The RetroPlate System transforms the concrete floor already poured for structural purposes and makes it aesthetically impressive. 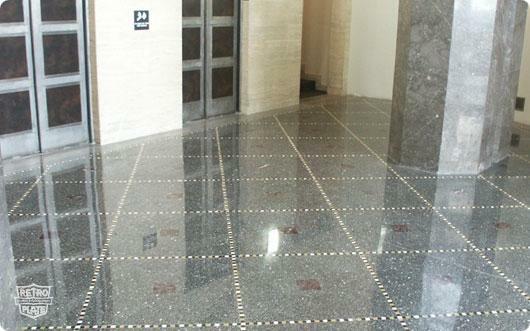 This 1940’s office building had poorly maintained cementitious terrazzo throughout the main lobby. 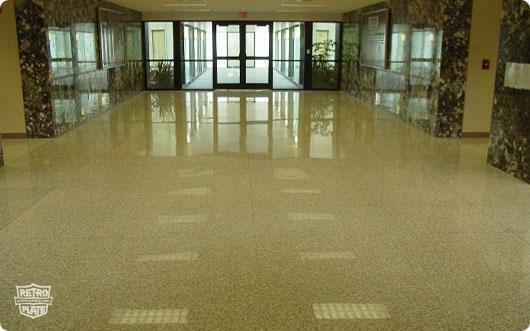 RetroPlate strengthens the matrix that the marble chips are embedded in, providing an intense shine, along with a low maintenance floor. 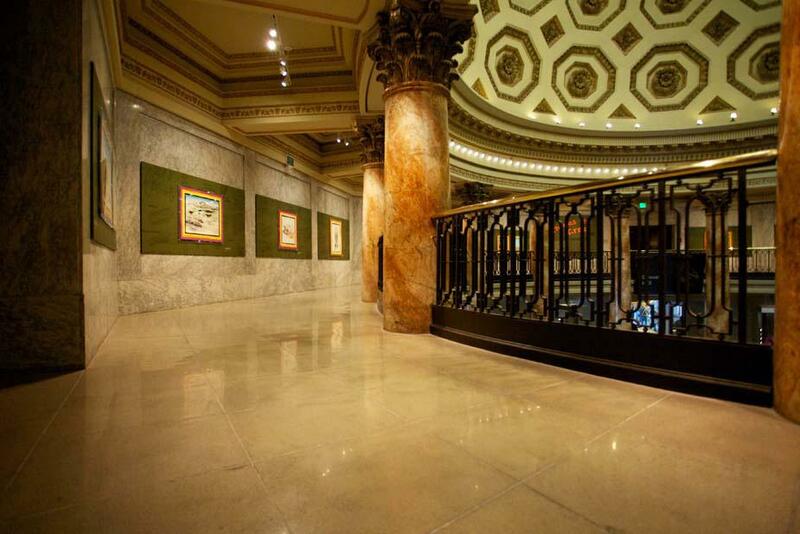 The work Mark Beamish Waterproofing performed at the Natural History Museum of Los Angeles was part of a $69 million historic preservation and renovation project. 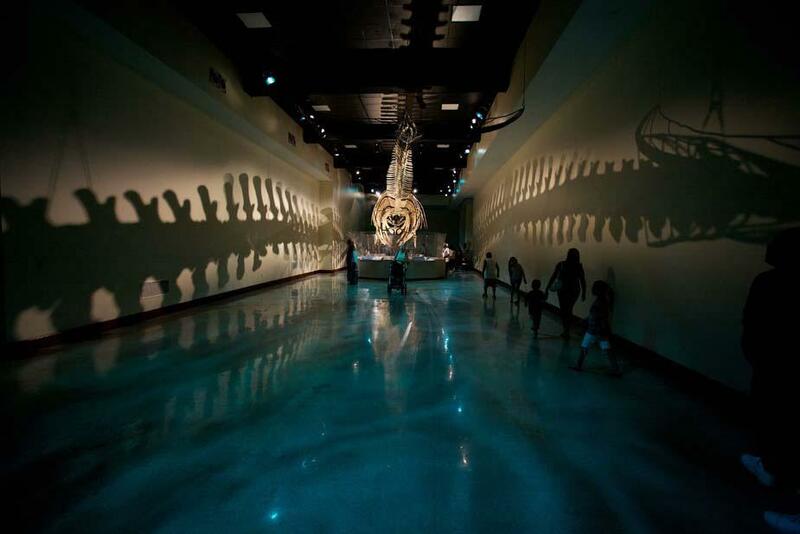 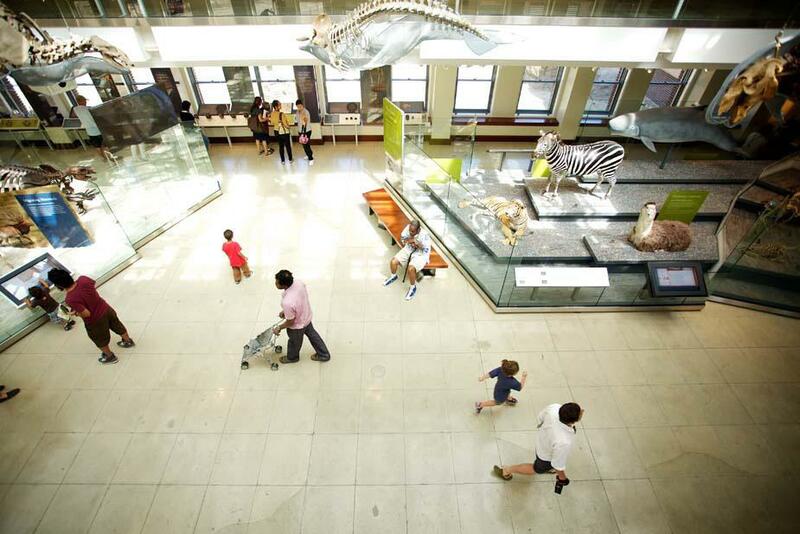 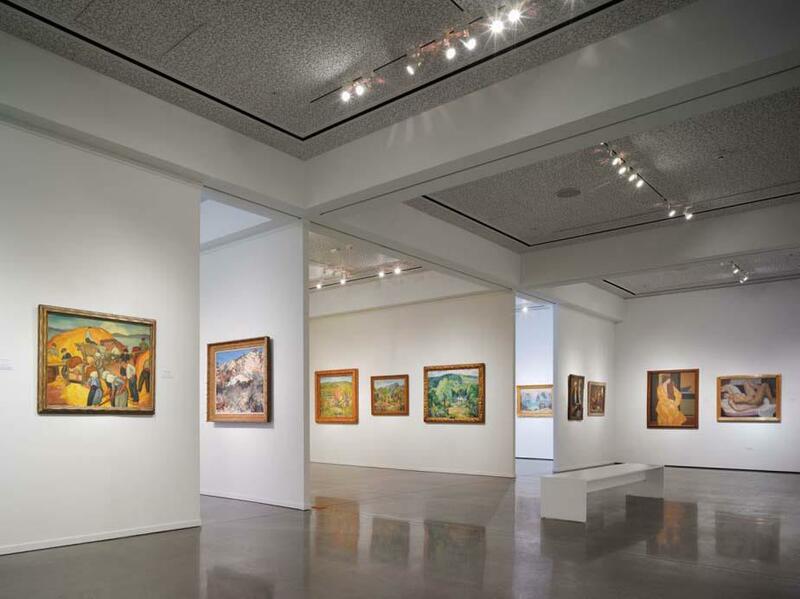 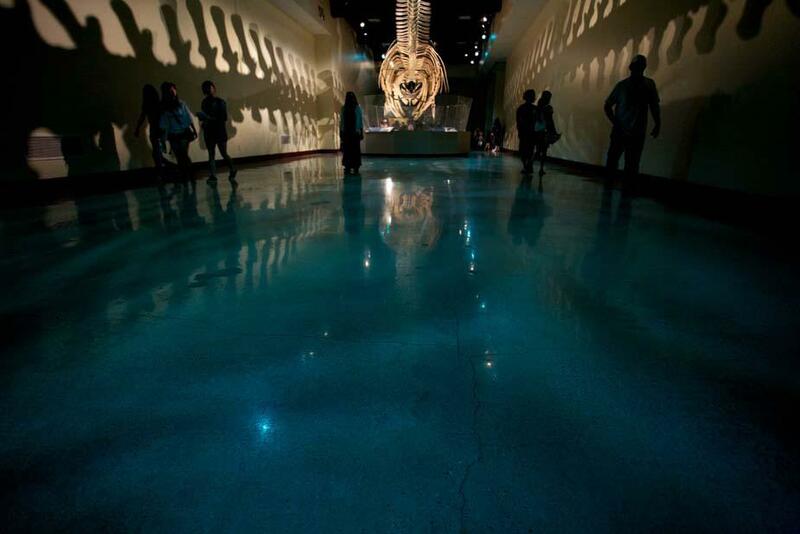 The museum desired to preserve the original look of the century old museum floor, exposing its imperfections. 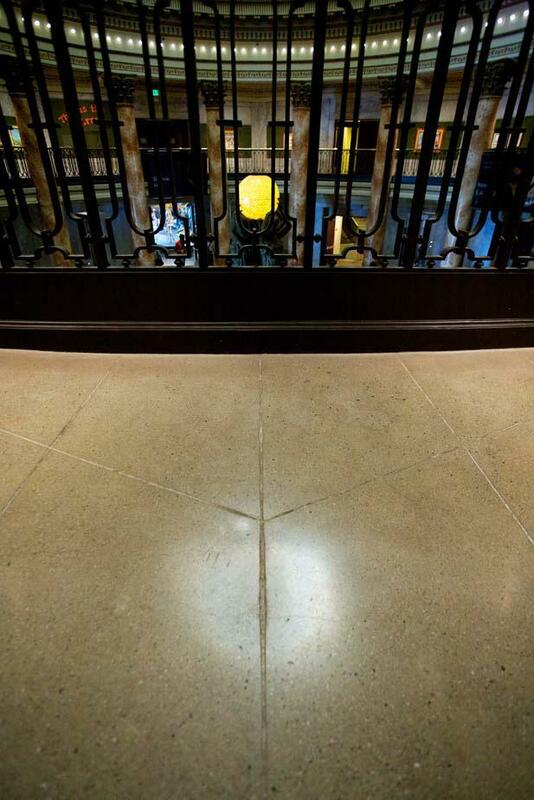 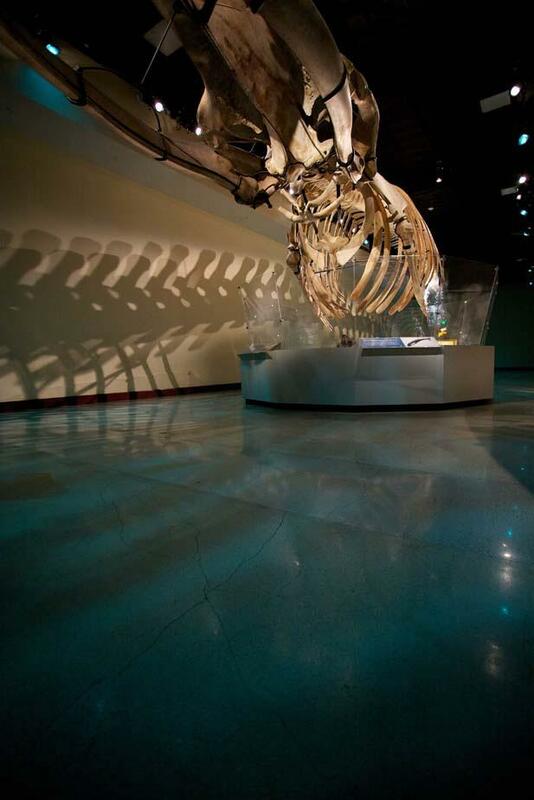 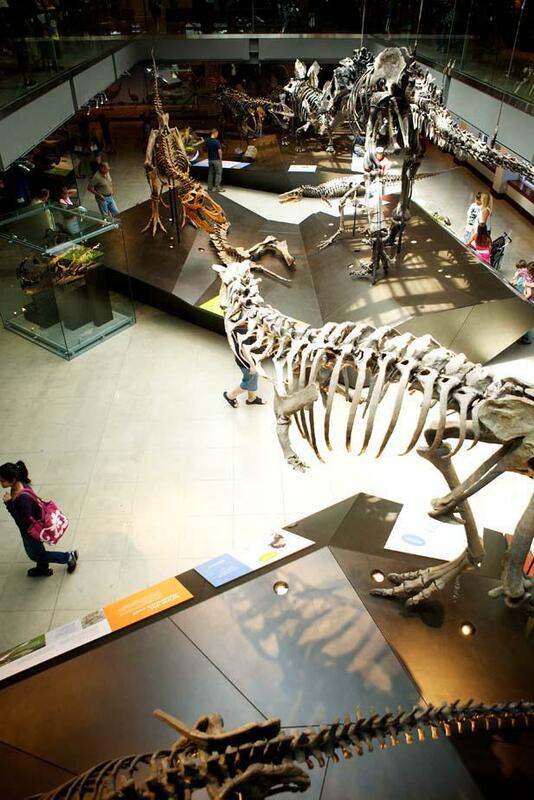 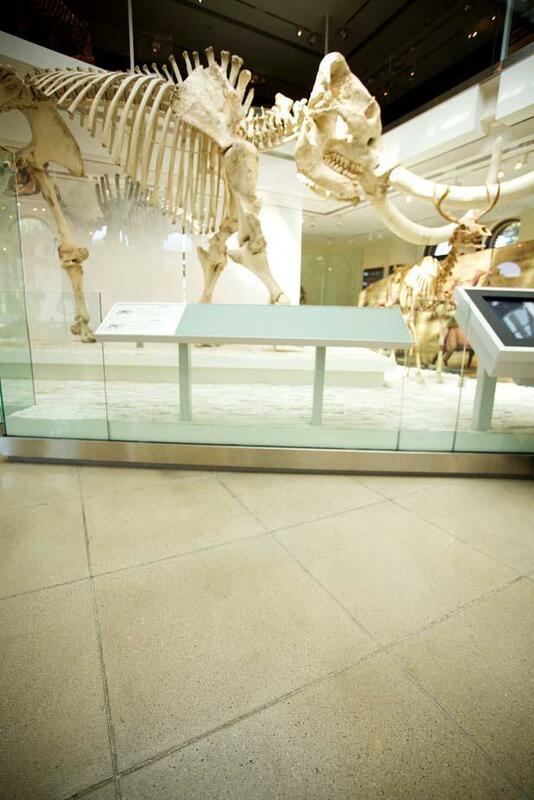 After grinding and polishing, Mark Beamish Waterproofing was able to deliver the desired look by using the RetroPlate System, which doesn’t hide things, but rather mimics what is underneath, giving the floor at the Natural History Museum of Los Angeles a smooth finish. Mark Beamish Waterproofing was contracted to complete the concrete polishing for the expansion of the Oceanside Museum of Art in 2008. 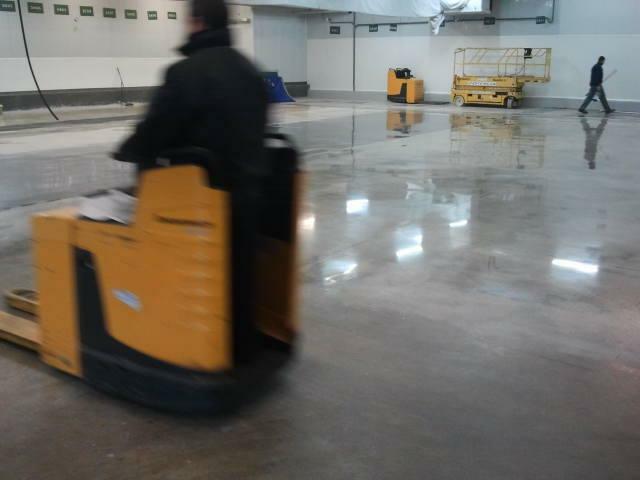 First, Mark Beamish Waterproofing went in to clean and prep the concrete surface, including filling the slab joints and patching/repairing any spalls. 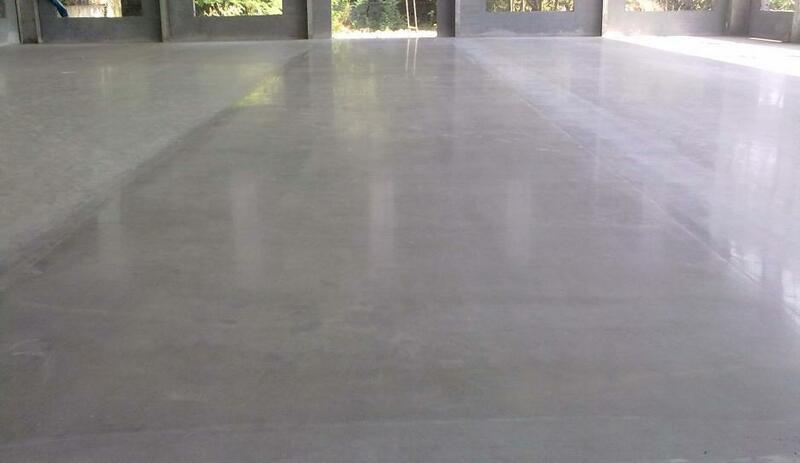 The refining process was initiated by grinding and then honing the concrete with the Klindex Expander followed by the utilization of the Retroplate System to chemically densify the concrete. 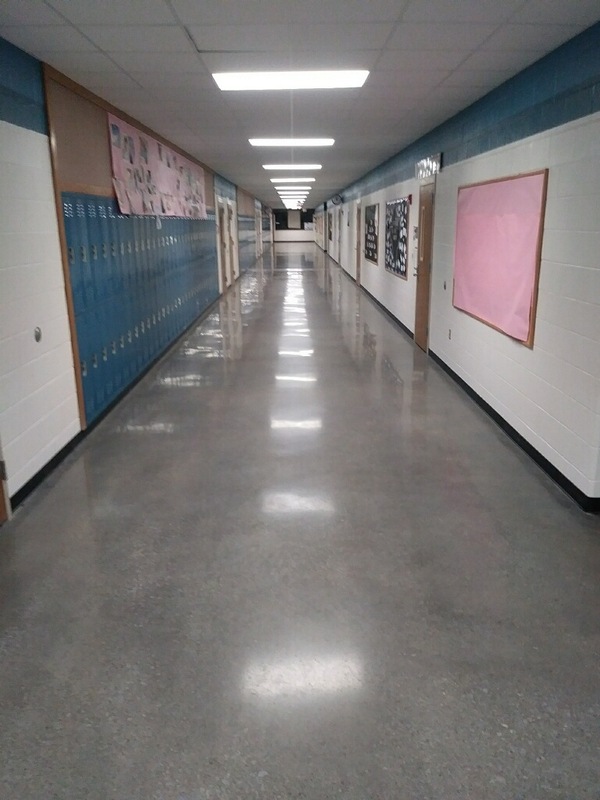 Mark Beamish Waterproofing then completed the concrete refining by bringing the polish up to the specified shine through a series of passes with the resin bonded diamond pads. 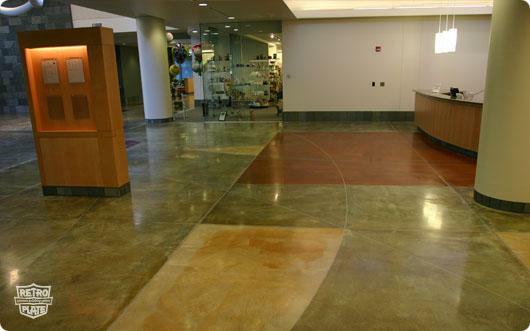 St. Peter Hospital was looking for a vibrant, but low maintenance flooring for their new Emergency Center, and the planned renovation of their Main Entrance Lobby. 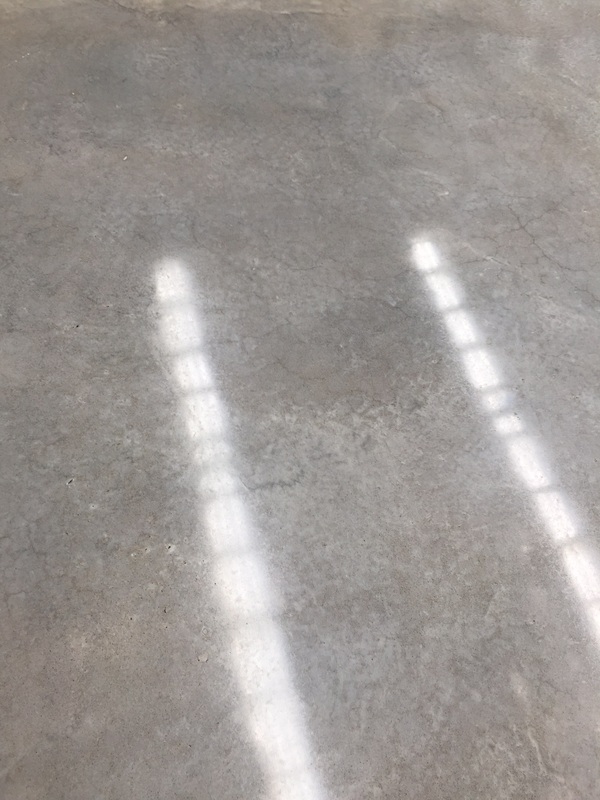 They initially considered classic stain with topical sealer until their walk-through of area projects revealed failed floor after failed floor. 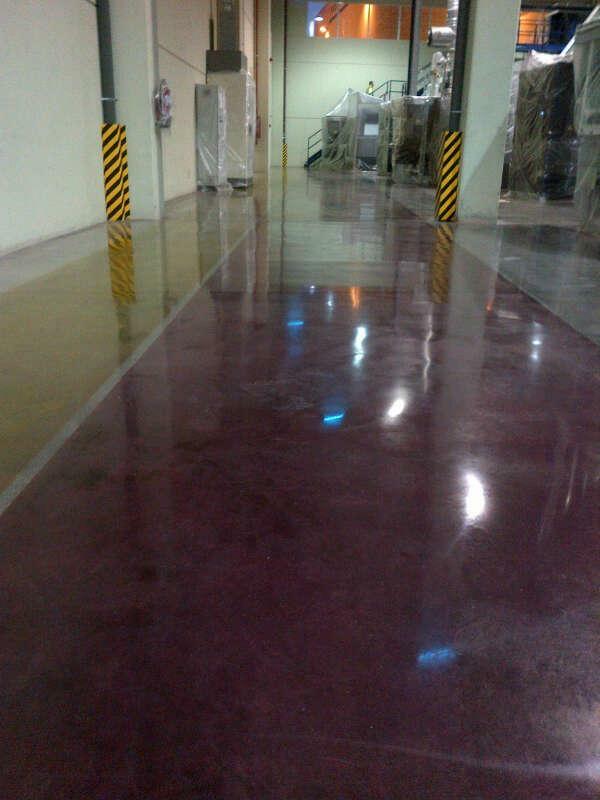 Once they saw how poorly the old standard held up, they turned to the RetroPlate System to protect their acid stain. 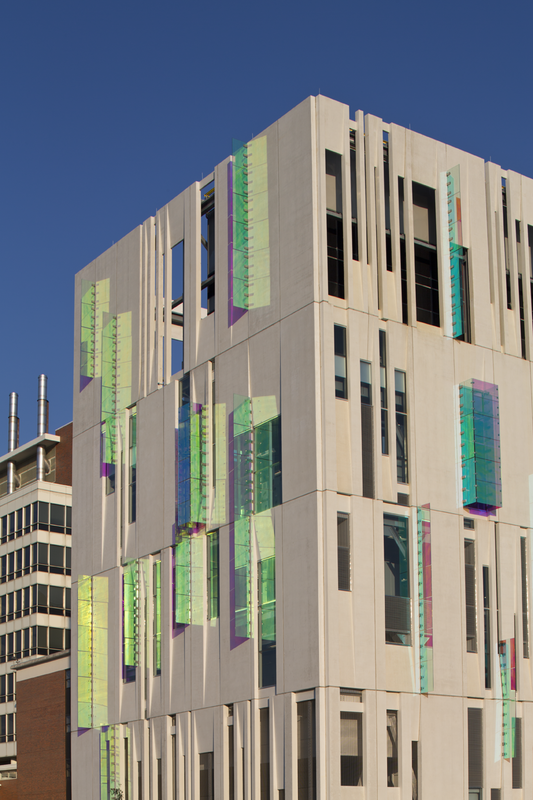 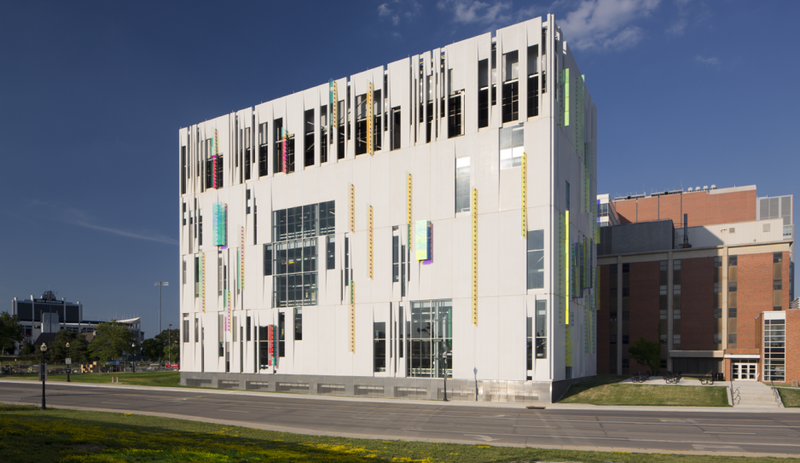 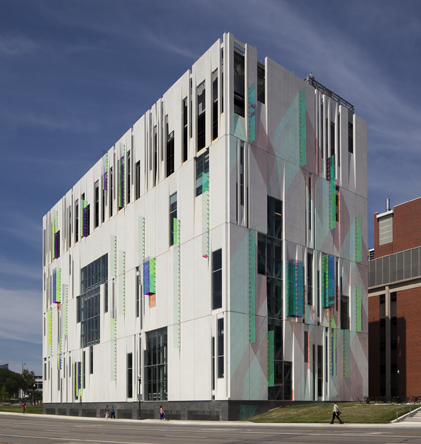 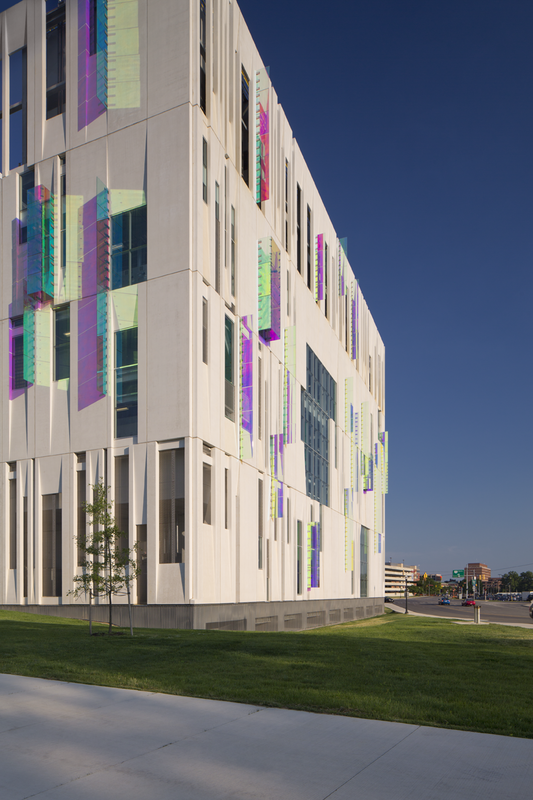 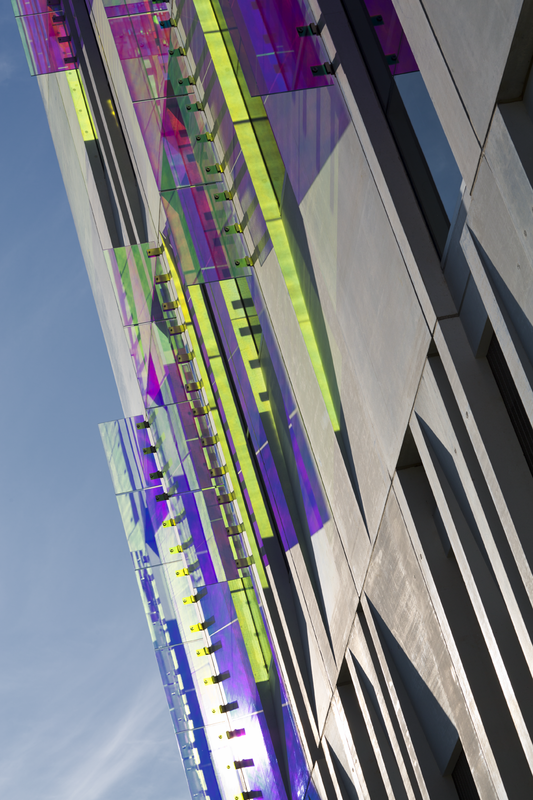 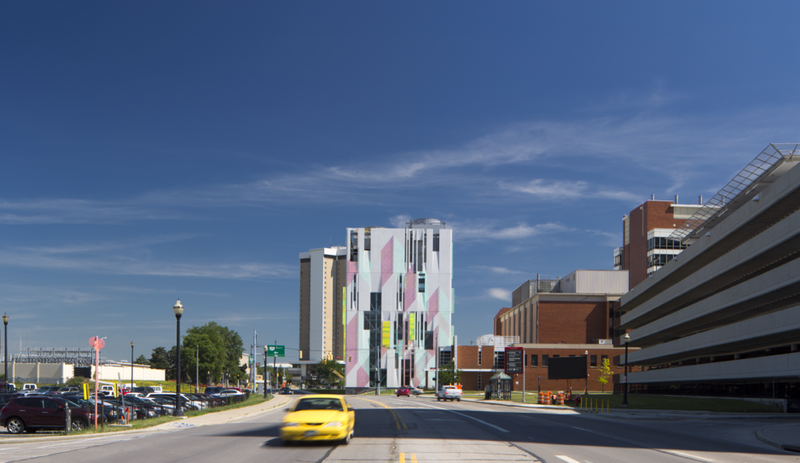 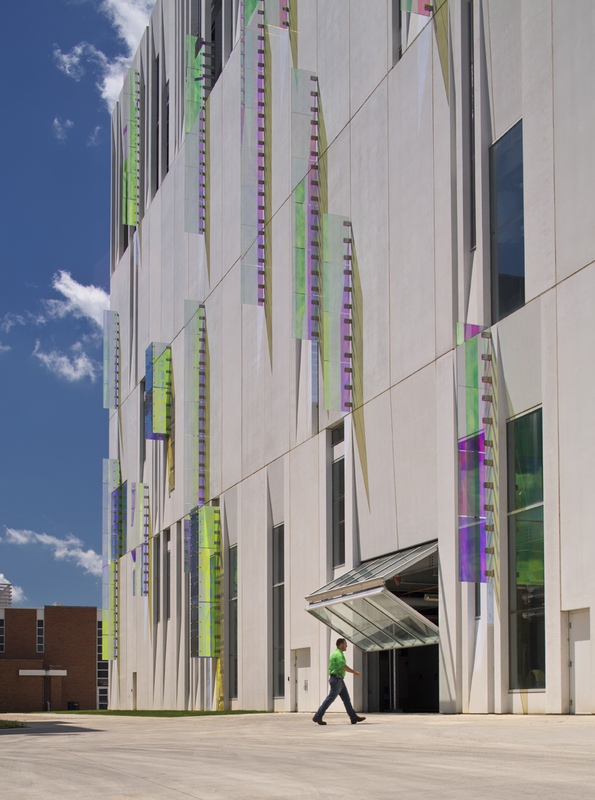 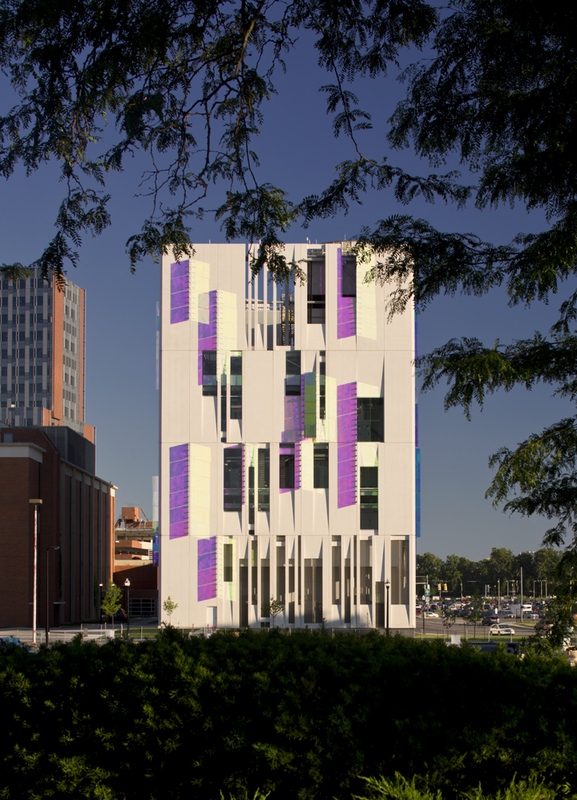 The project was in three phases, with the topping slab formulated with white cement to provide for more vibrant colors. 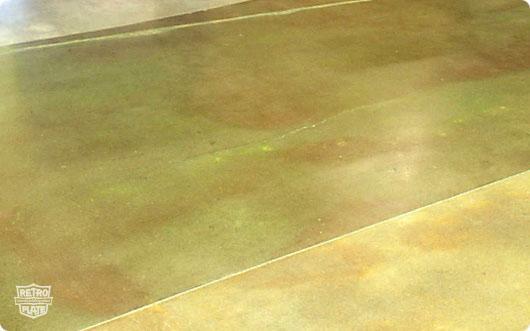 The final acid stain colors were arrived at through blending and overlaying of multiple acid stains. 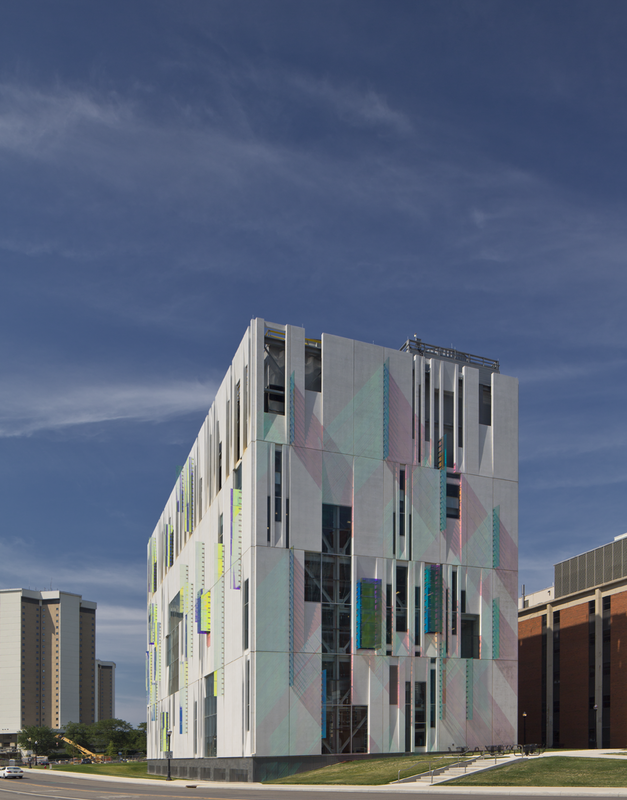 The three phases were placed separately over an 18–month period. 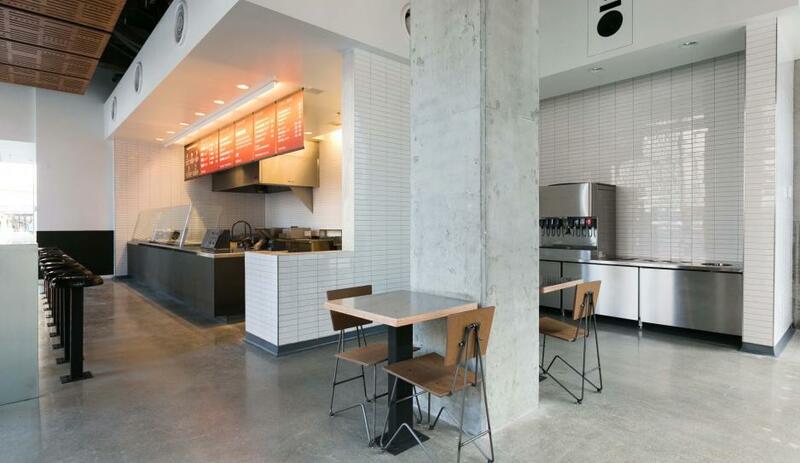 All matched perfectly. 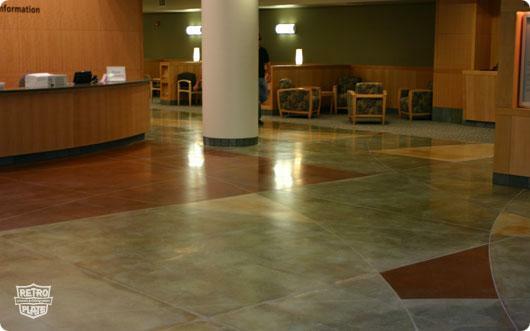 With the ease of maintenance, the hospital wishes that all of their floors were acid stained and RetroPlated! 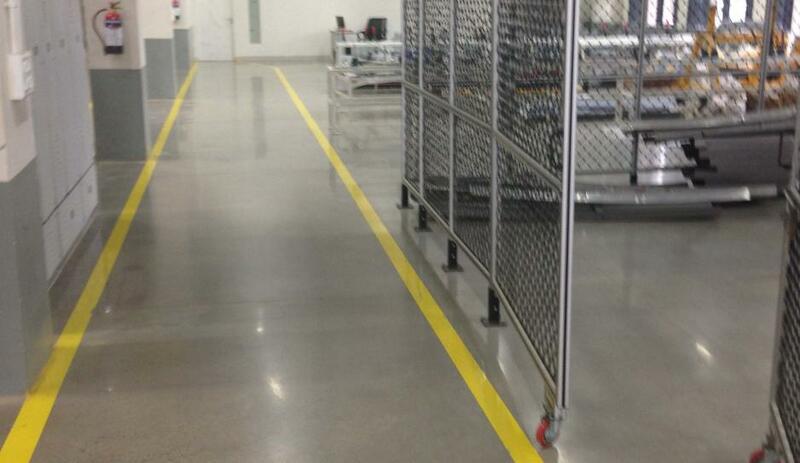 Maverik Laboratories sought a durable floor that could handle high traffic in their laboratory warehouse for cosmetic products. 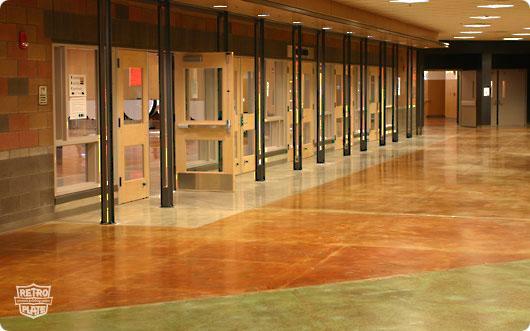 Project specifications called for applying dyes to specific areas of the floor to designate traffic areas for personnel and equipment. 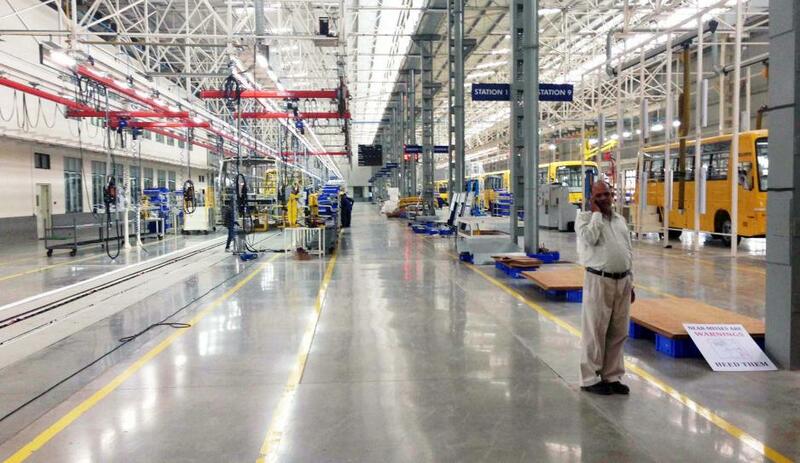 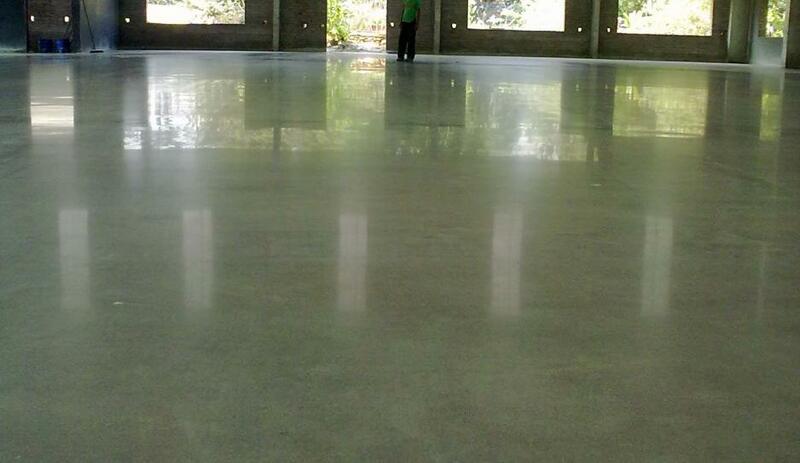 An old Sony manufacturing building was retrofitted with polished concrete floors. 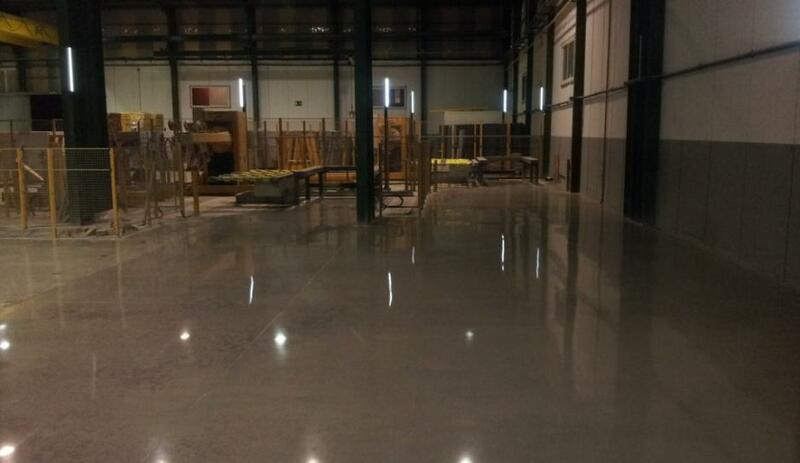 The owners, a French Company, were very proud of their first USA facility and the beautiful RetroPlate olished floors. 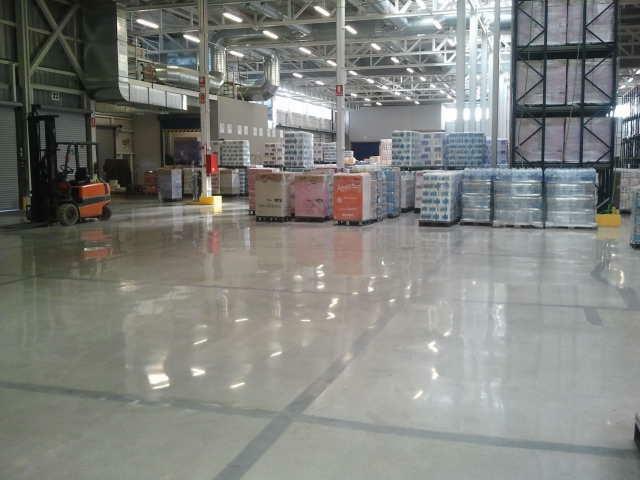 The maintenance manager couldn’t stop talking about the ease of cleaning the floor with CreteClean Plus with Scar Guard. 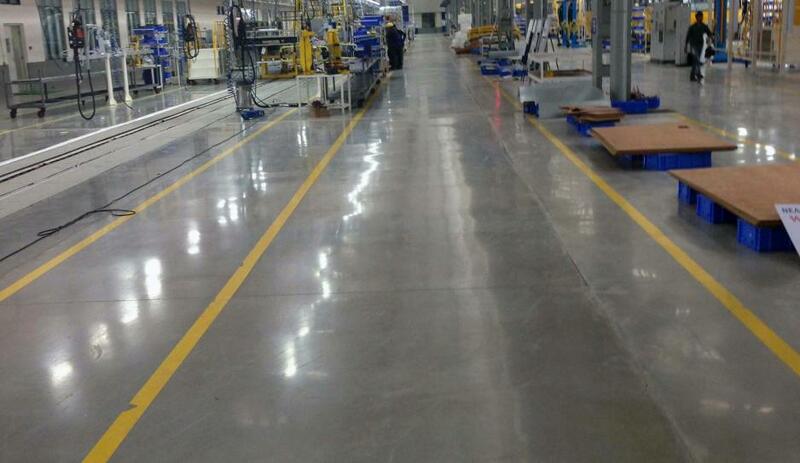 Not only do they produce an energy saving product (solar energy), but now they have a green floor as well! 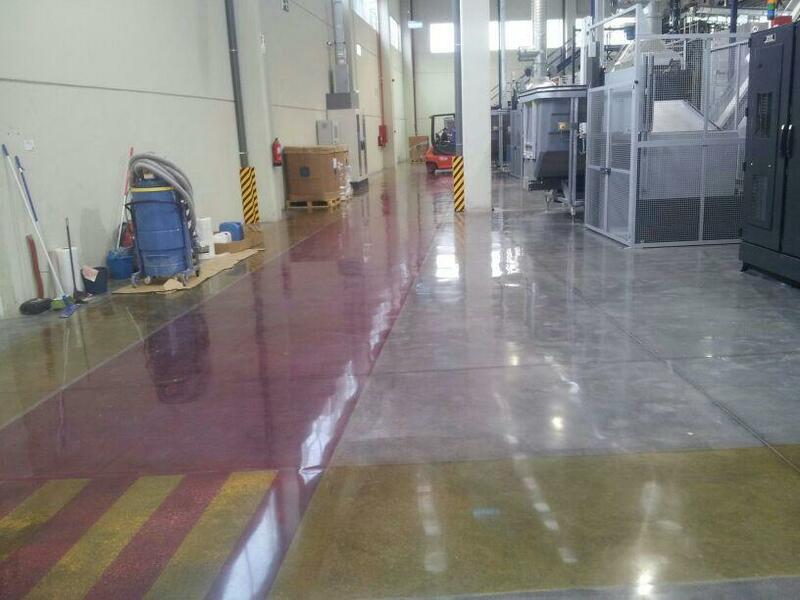 The client chose the RetroPlate System instead of epoxy coatings in order to reduce the maintenance cost of the concrete floor over an extended period of time and to improve its durability. 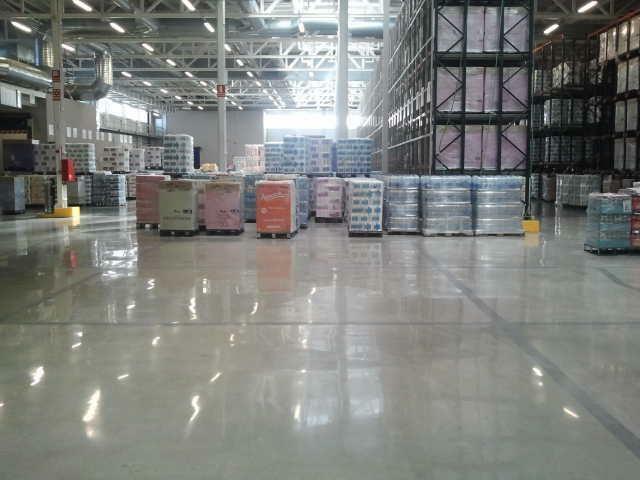 Since being treated with the RetroPlate System, the floor has become hard, dustproof, abrasion resistant, sealed and improved light reflectivity by 30%. 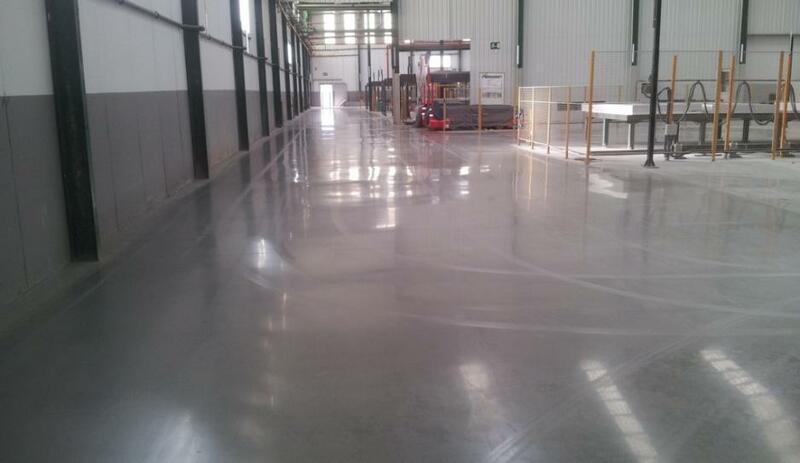 The client contacted Durotec Glasstone to improve the properties of the concrete, improving the overall strength and durability of its new factory. 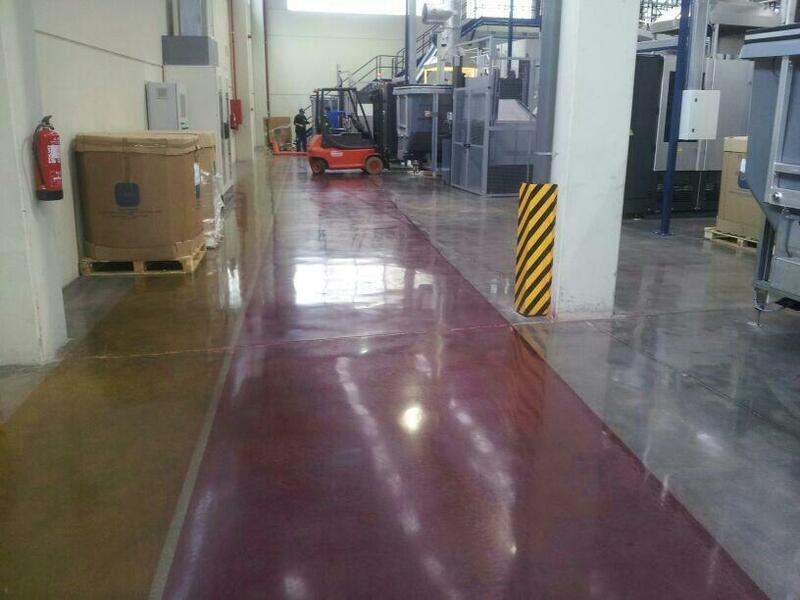 RetroPlate was applied to the floor, and the result was not only aesthetically pleasing, but very durable and easy to clean- qualities which were necessary because the factory has very heavy, continuously moving robots that move parts. 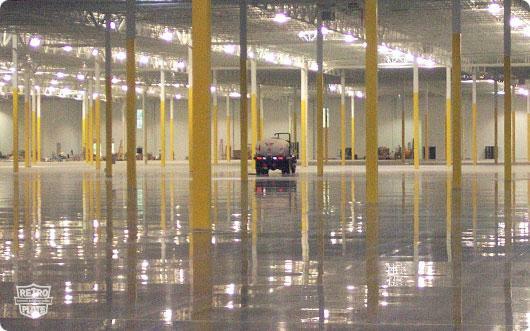 This 50,000 sq. 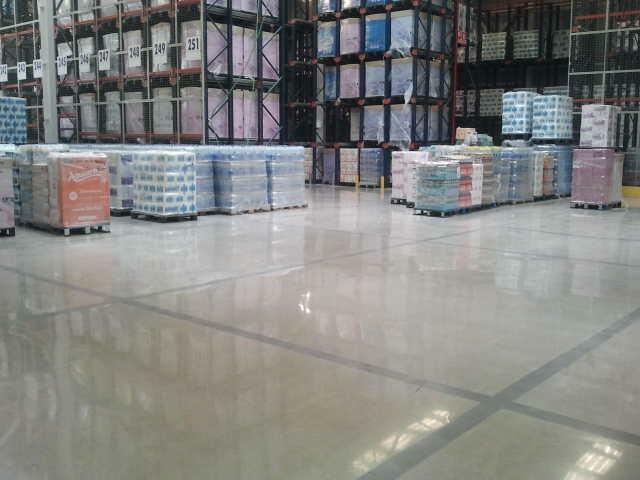 ft. warehouse used the RetroPlate System to achieve a dust-free floor, and a floor that could withstand its heavy forklift traffic. 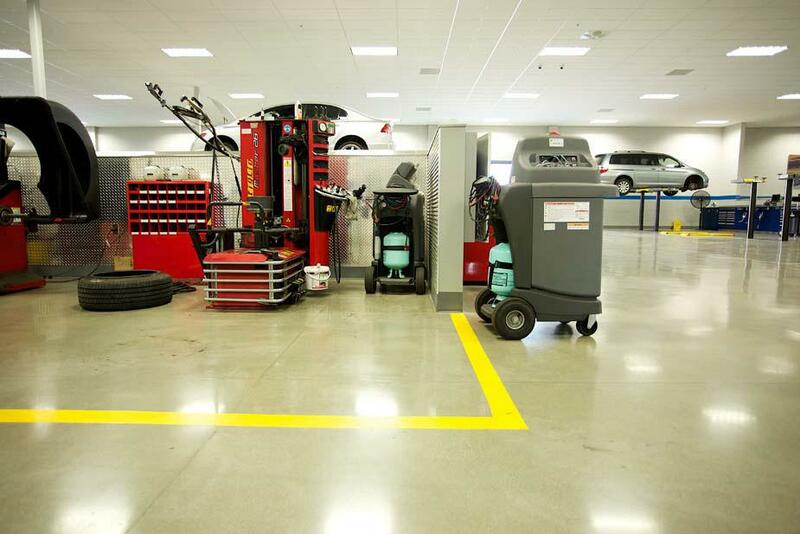 The great look and ease of maintenance are huge bonuses. 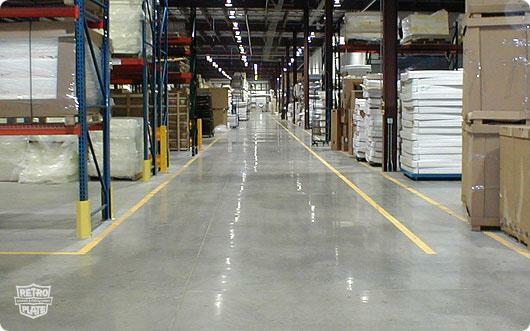 Dirty, dusty merchandise is an issue for warehouses and the RetroPlate System eliminates any concrete dusting. 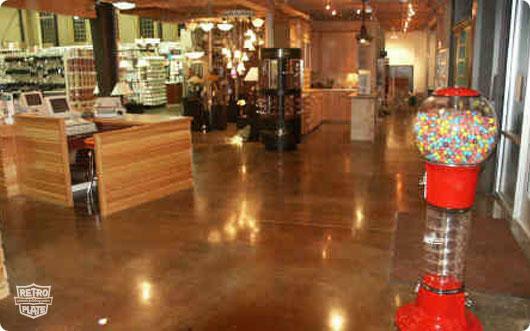 This jewelry warehouse / manufacturing location has taken its facility to another level by RetroPlating their floors. 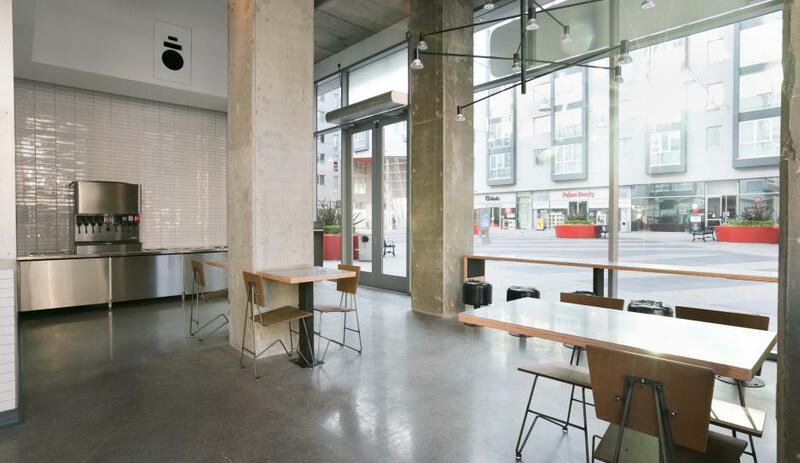 The intense shine and dust-proof environment give this high-end jeweler a look that sets them apart from the rest. 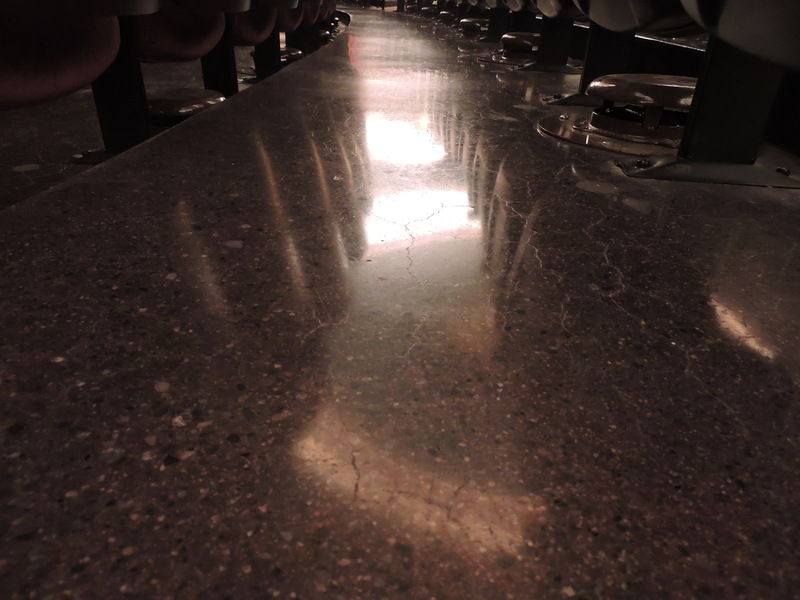 The RetroPlate System is turning bare concrete into granite. 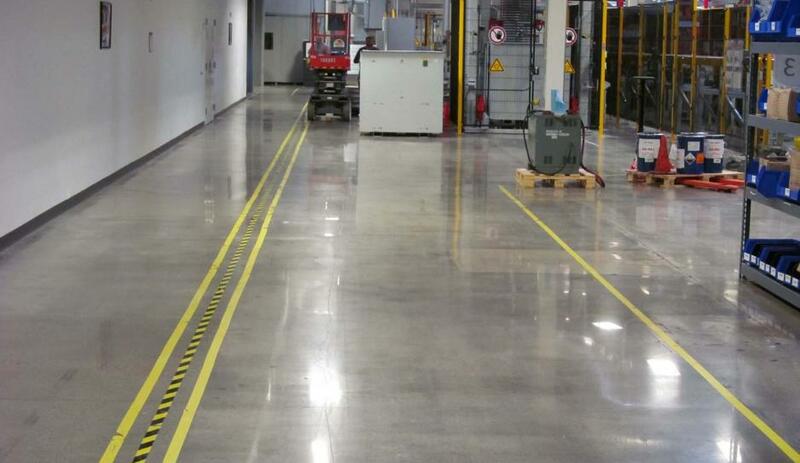 This 900,000 square foot Volkswagen facility in New Jersey received the RetroPlate System, creating a hard, dust proof floor finish that is easy to clean and beautifully polished. 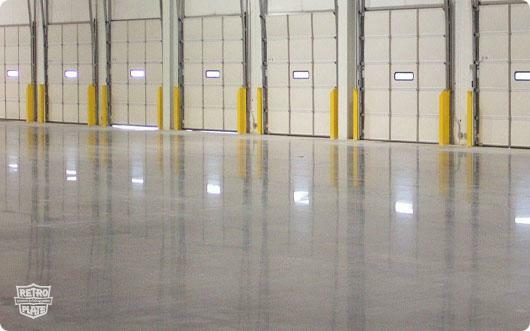 They had previously coated their facilities, but the RetroPlate System has given them all of the RetroPlate advantages without the maintenance and re-application problems of their previous coatings. 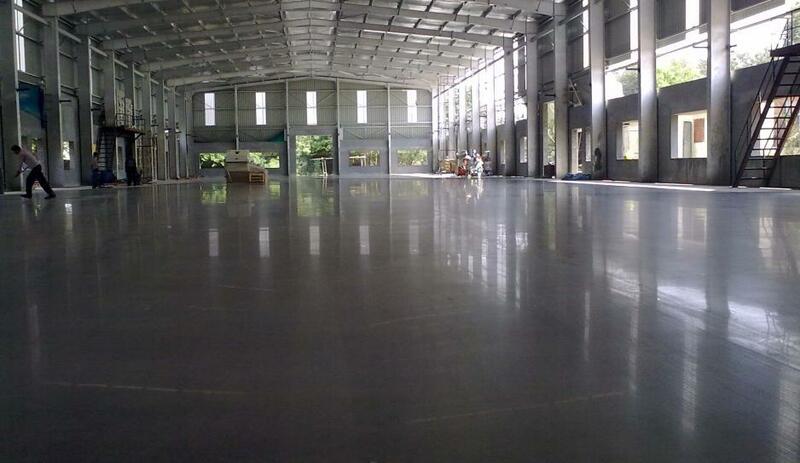 The RetroPlate was applied after the concrete was cured and before the racking went in, and the entire application took less than a month to complete. 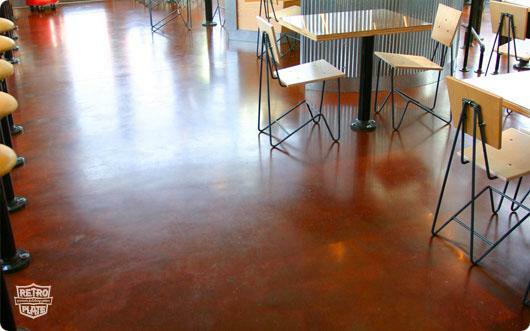 Big or small, the RetroPlate System is the ideal application for your flooring needs. 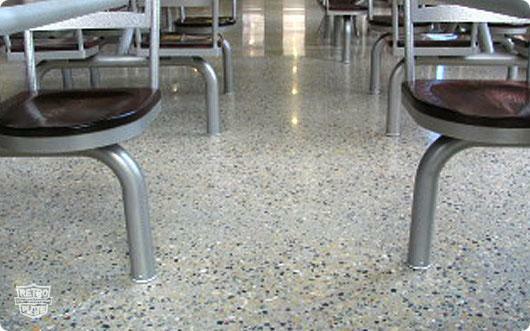 This 100-year-old terrazzo floor was refurbished using the RetroPlate System. 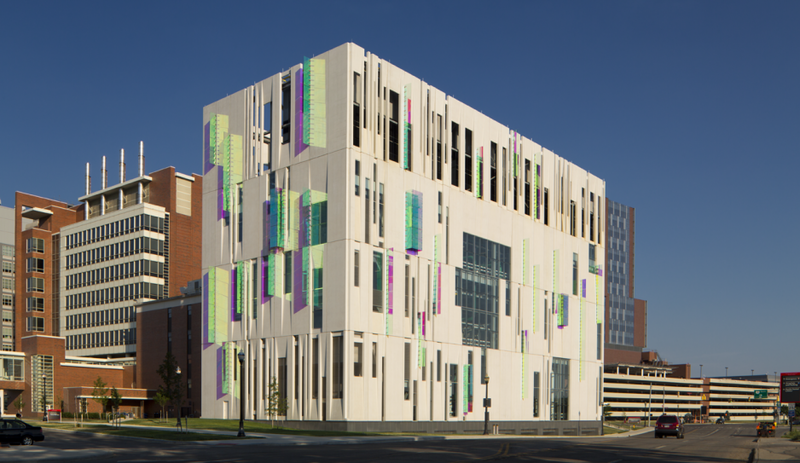 Maintaining the original image and luster of the building was a high priority, and RetroPlate accomplished just that. 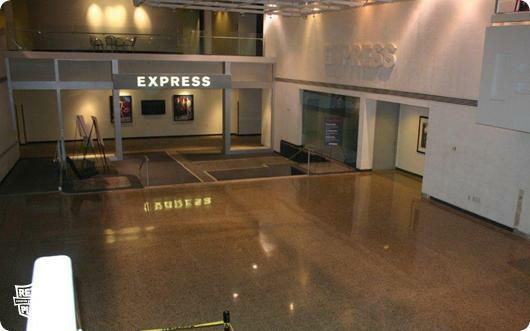 The headquarters for clothing retailer EXPRESS, in Columbus, Ohio, won the 2012 Polished Concrete Award in the Commercial category. 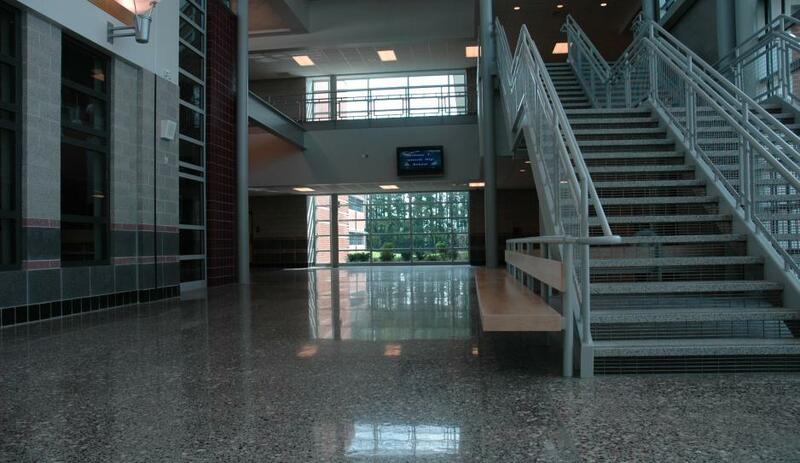 The contractor for the project was Final Touch out of Blacklick, OH. 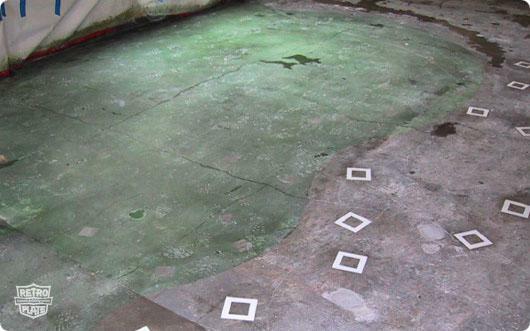 Stone tiles and ½-inch of thin-set had to be removed with a shaver in order to get to the bare concrete. 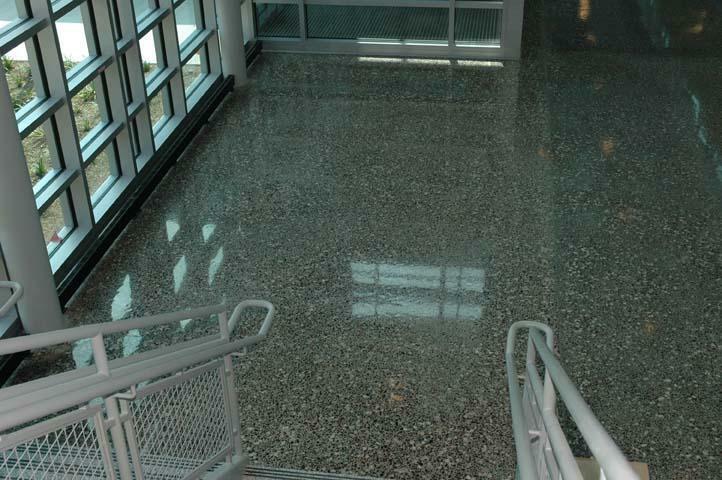 The concrete was then ground to expose large river rock, after which RetroPlate® was applied to the concrete surface, and then polished. 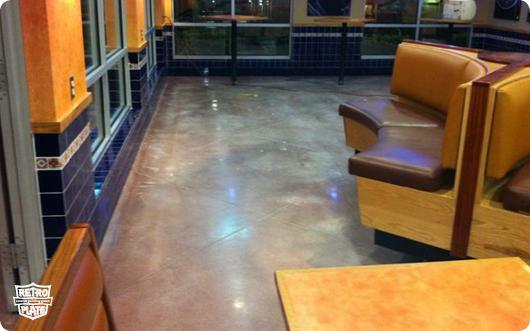 Grout was used to fill excessive pitting and hairline cracks on the project. 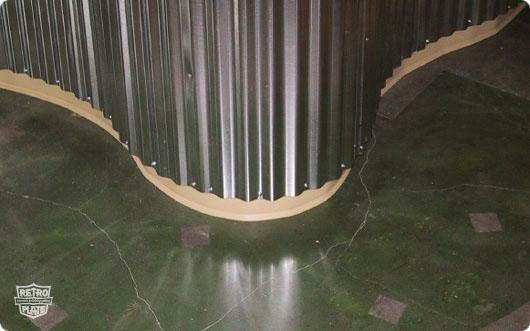 HTC 800 grinders were used for grinding and polishing and attached to T8600 Ermator Dust Collectors to keep the surrounding offices and entryway free of dust during project. 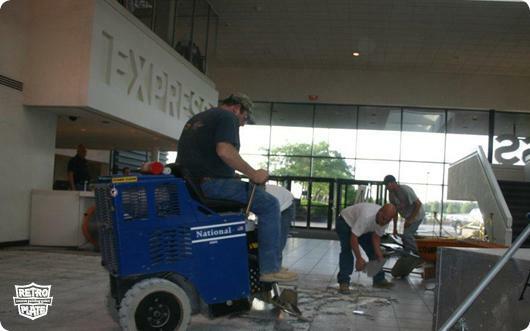 Coordination between tile removal and concrete grinding and polishing was critical to keep project on schedule. 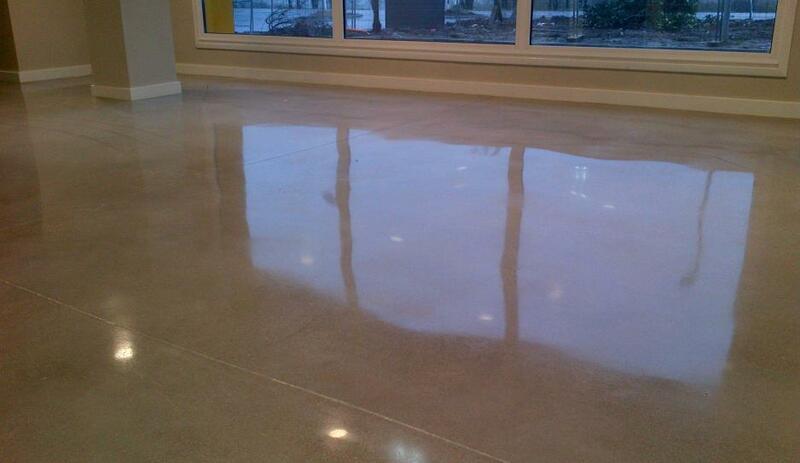 This floor was previously coated with an epoxy coating and was a maintenance headache. 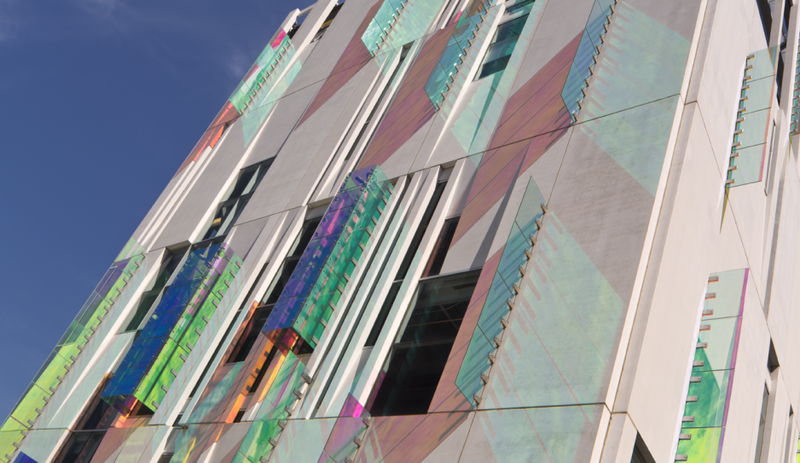 The coating was wearing and peeling away and required constant re-coating. 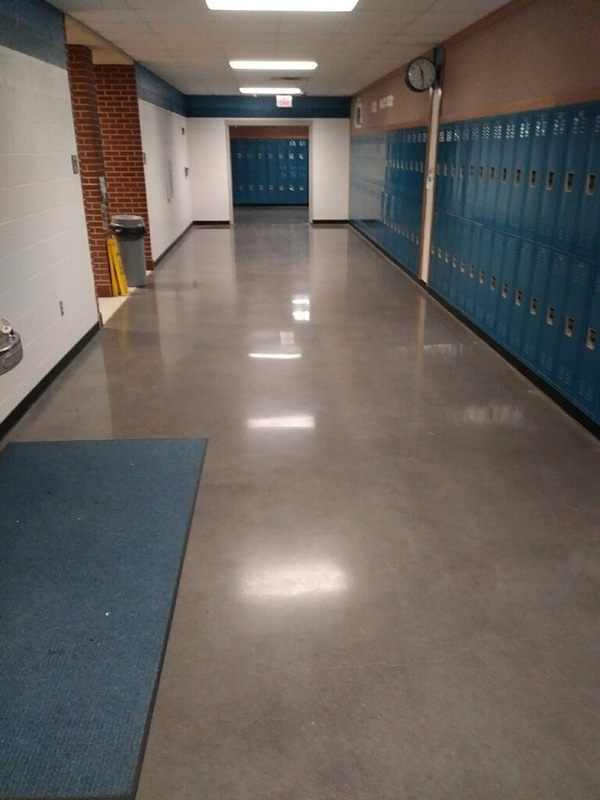 The coating was removed and the floor RetroPlated, turning this one-time maintenance headache into a beautiful, easy to clean surface. 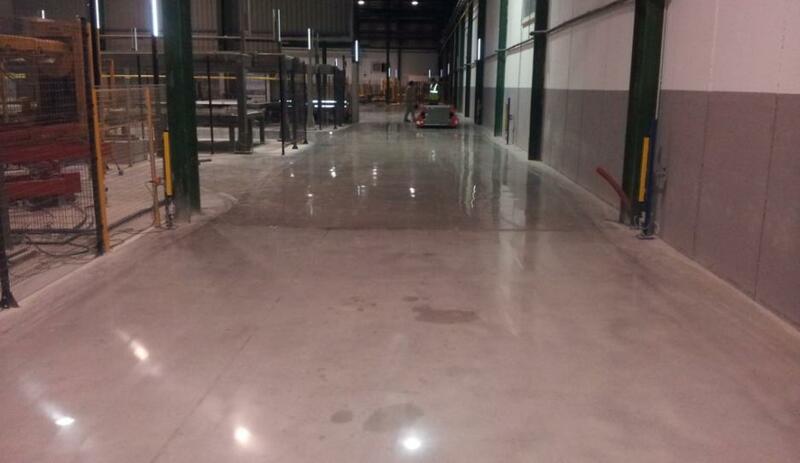 Beginning work on Pacific Audi included a 50, 100 and 200 resin grind. 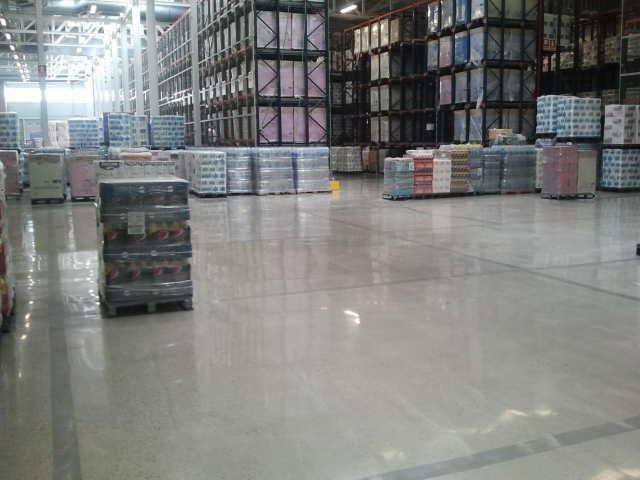 Mark Beamish Waterproofing crew members then applied the RetroPlate System and polished the floor with 400 and 800 resin diamond pads. 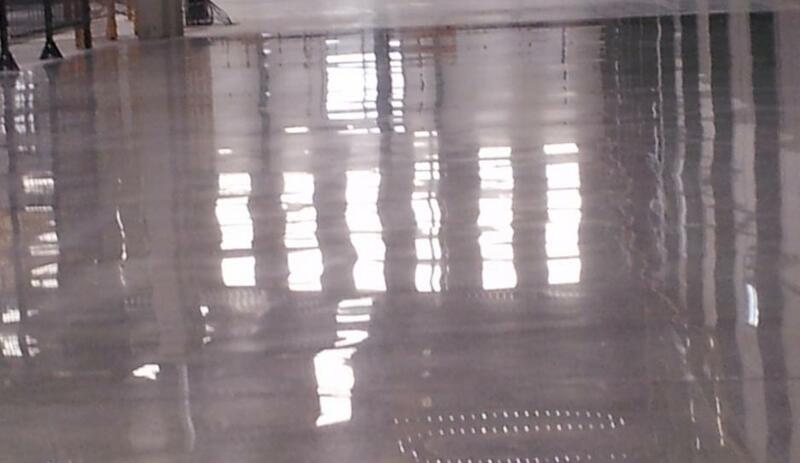 Final work on Pacific Audi concluded with the application of RetroGuard and a burnish for protected, lasting shine. 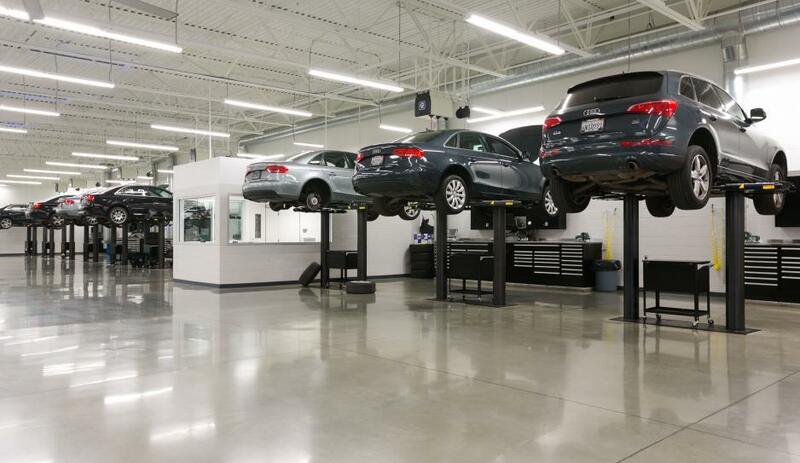 This 40,000 square foot dealership received the RetroPlate System on its showroom, office space, and maintenance areas. 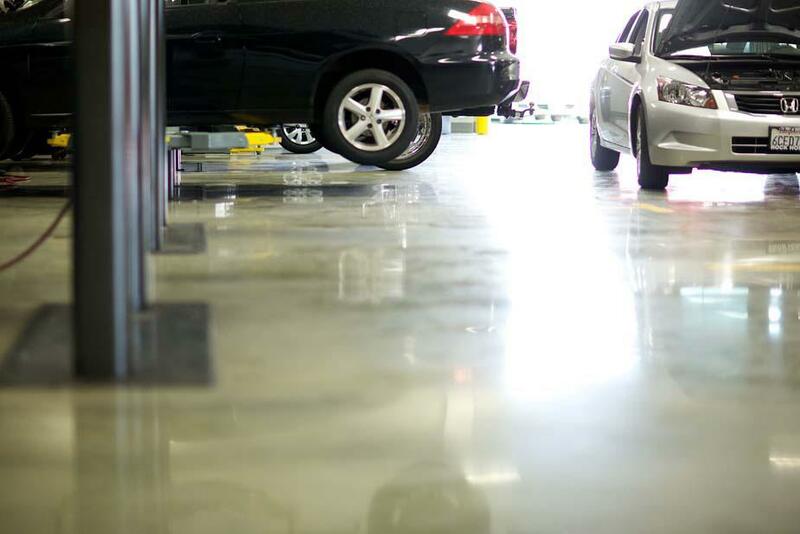 When you can sell the vehicle with the reflection off the floor, it can only be the RetroPlate System. 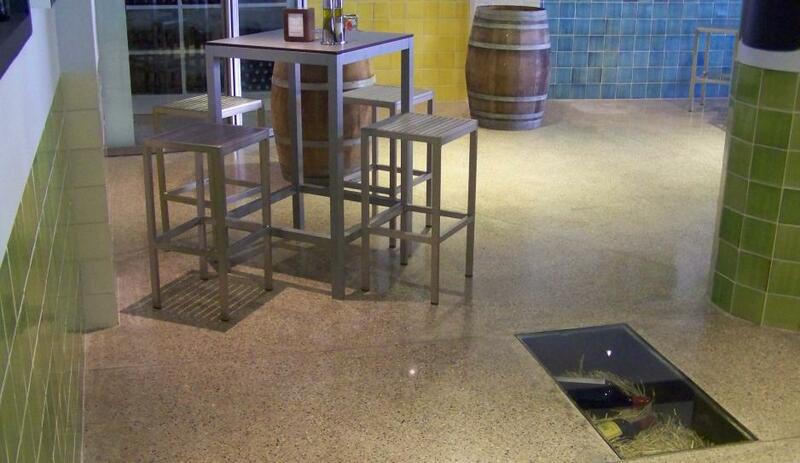 A recognized title holder for numerous Polished Concrete Awards, Mark Beamish Waterproofing has the experience to meet customer expectations and deliver quality results. 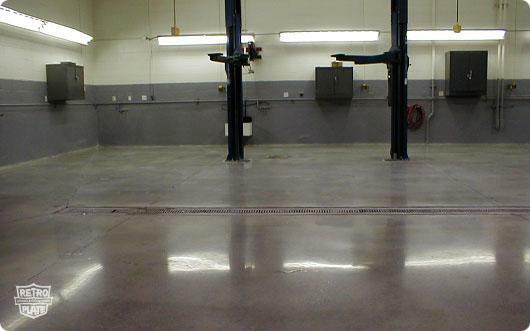 Beginning concrete polishing work at Rock Honda started with multiple-pass floor grinds, followed by the application of the RetroPlate System for the floor polish. 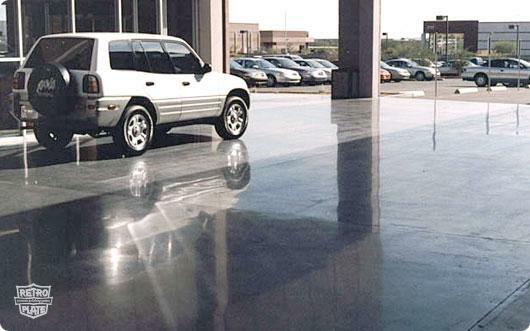 Concluding steps included the application of RetroGuard and final burnish for a lasting shine. 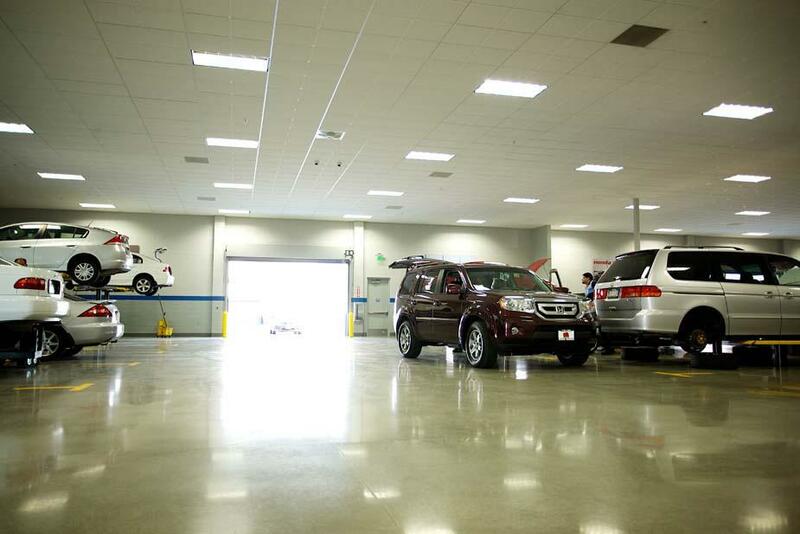 This Toyota dealership received the RetroPlate System in the showroom, drive thru, and maintenance areas. 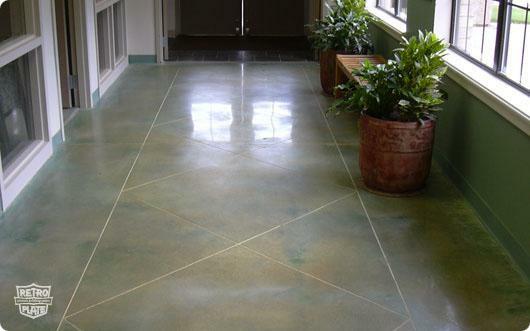 RetroPlate was applied to this floor in 1998 and looks as good today as the day it was applied. 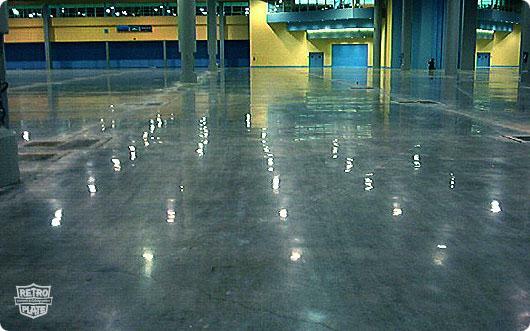 The RetroPlate creates a hardened, sealed, dust proof, and polished surface – ideal for a stadium or arena. 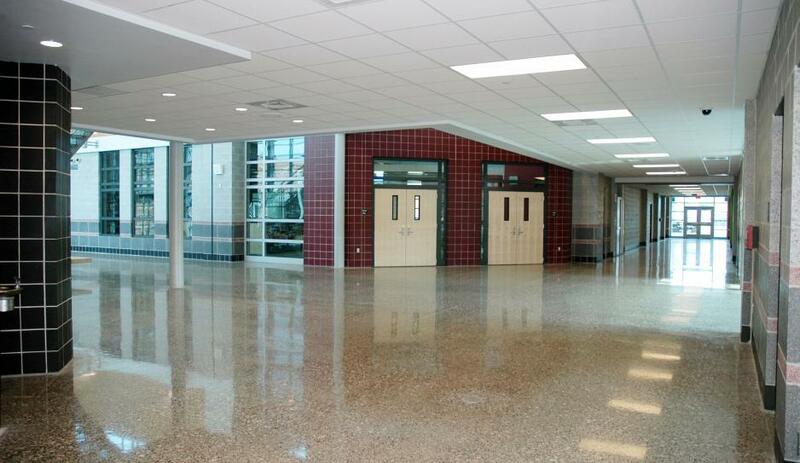 The maintenance is dramatically reduced compared to other flooring options, and the longevity is unsurpassed. 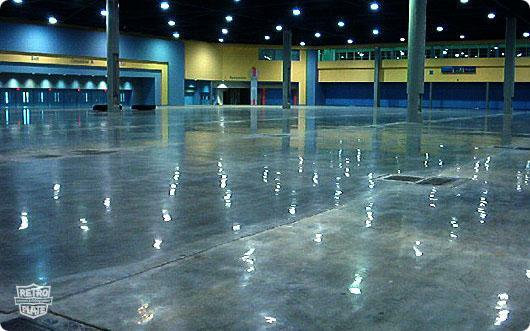 This 500,000 square foot convention center combines all that is Miami by using the RetroPlate System on their floor – beautiful, highly reflective, durable and easy to clean. 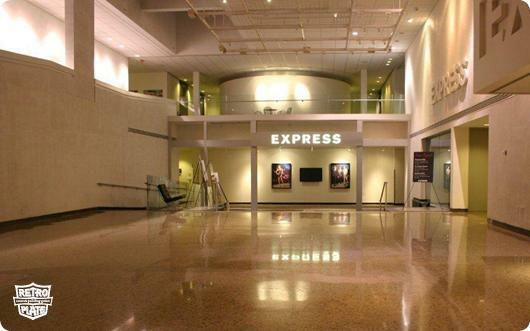 These characteristics make RetroPlate ideal for showing off any tradeshow or convention center.